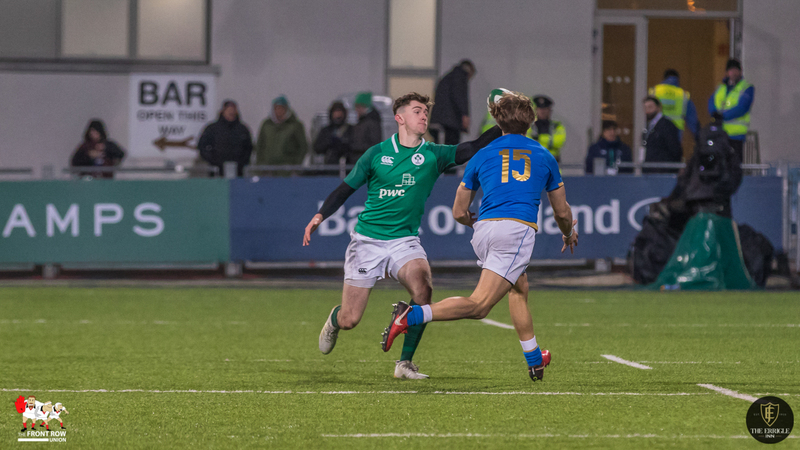 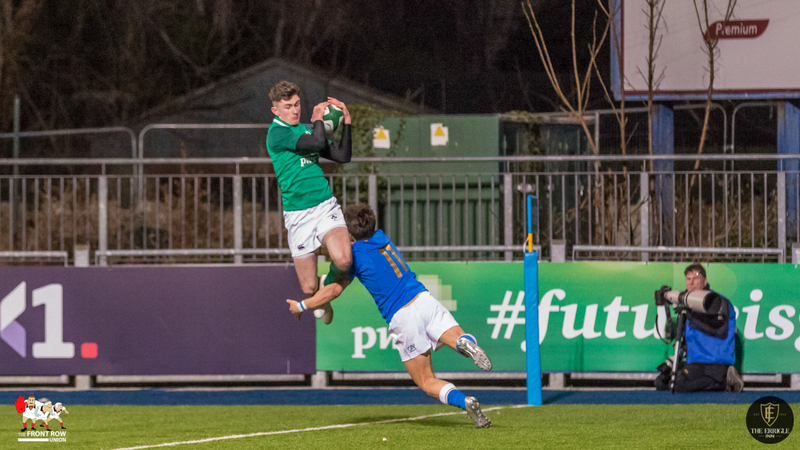 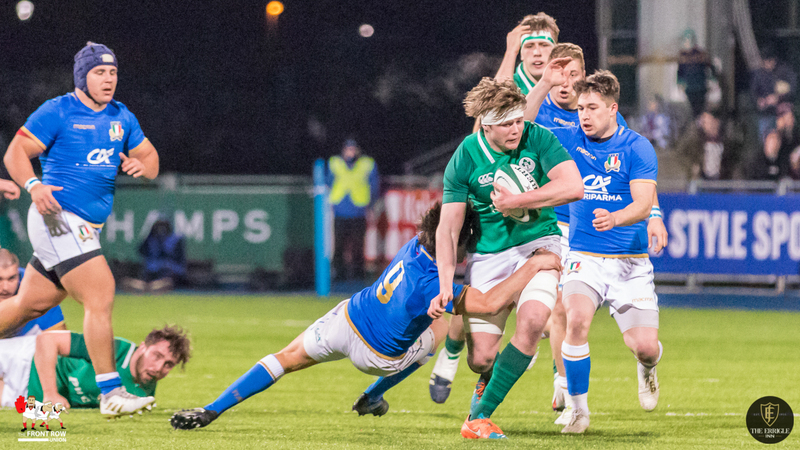 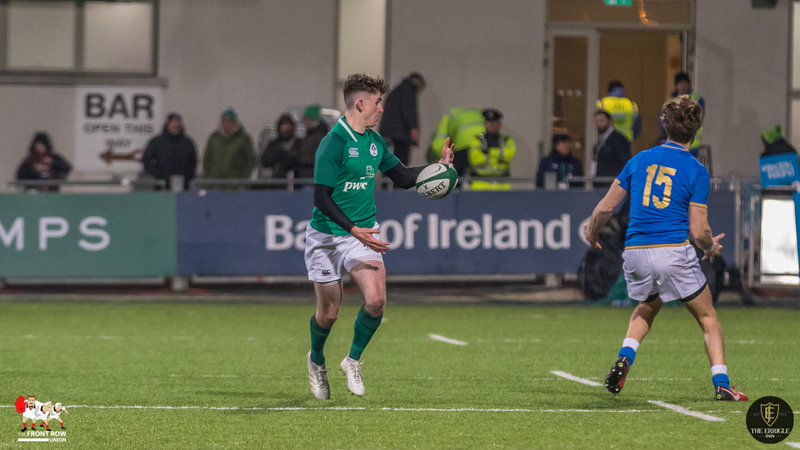 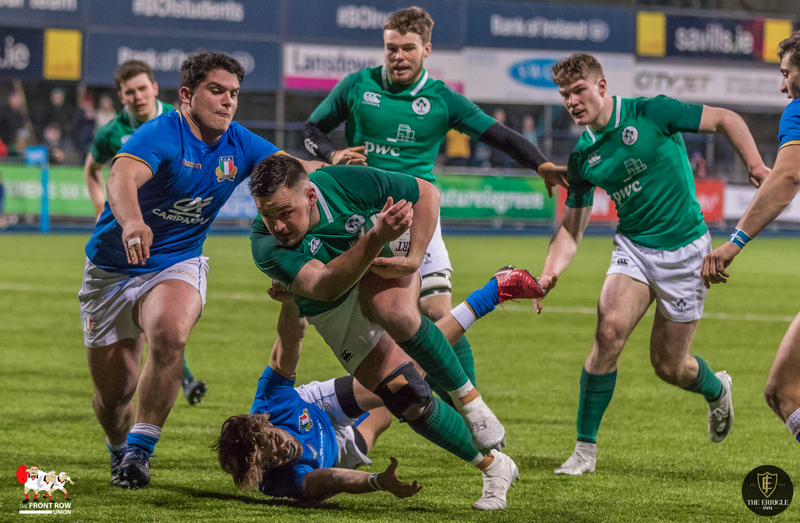 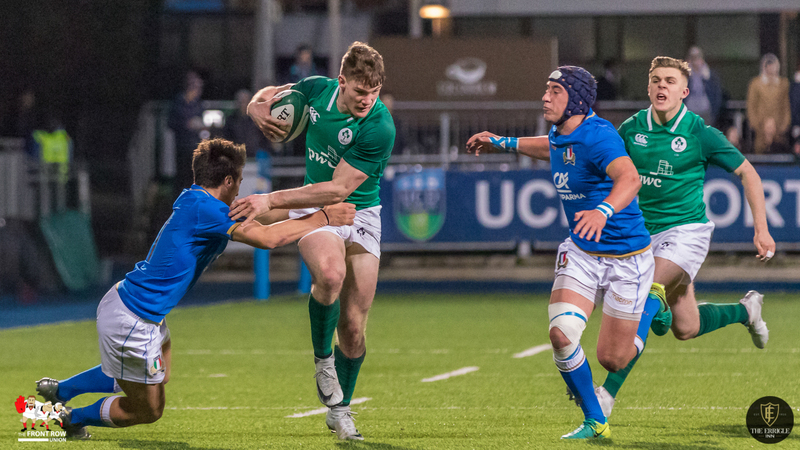 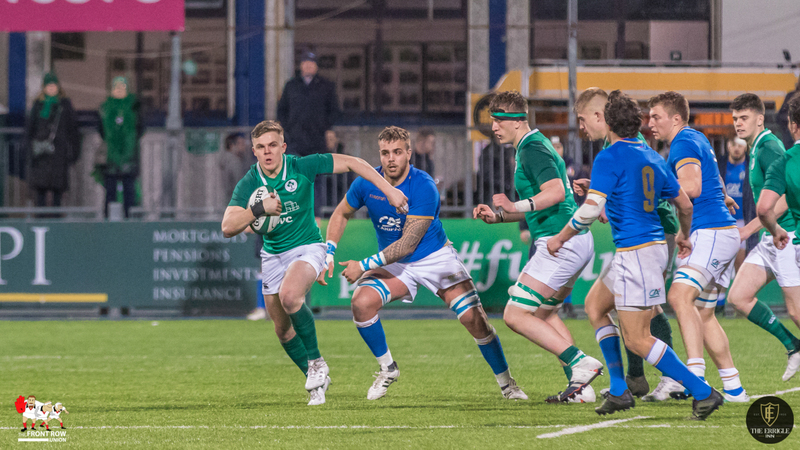 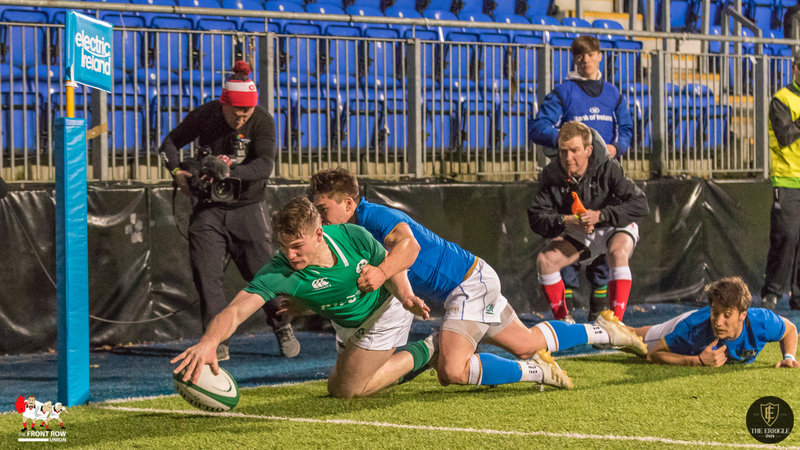 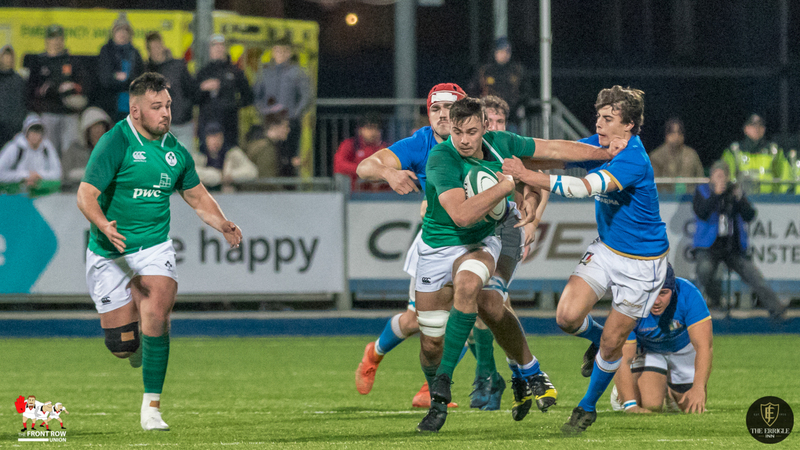 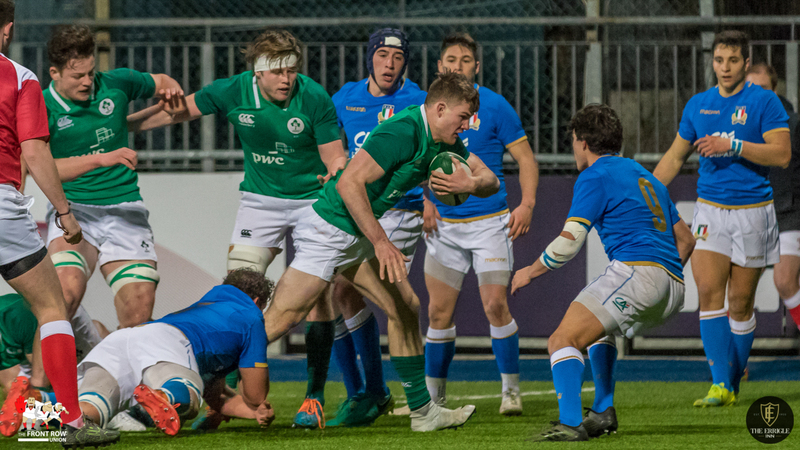 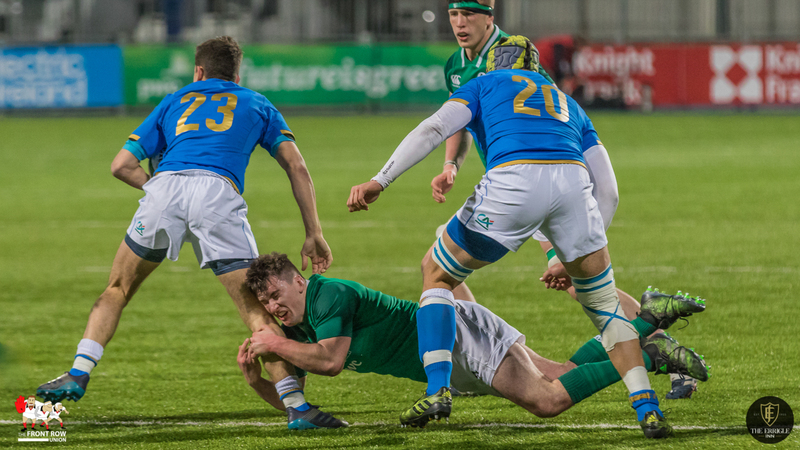 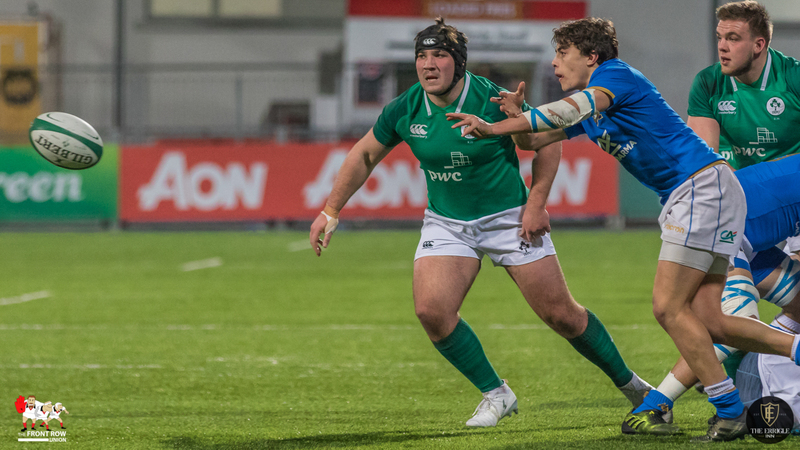 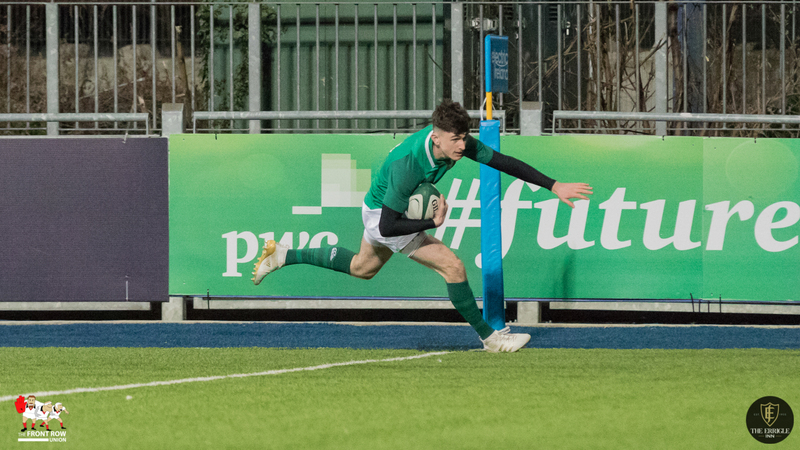 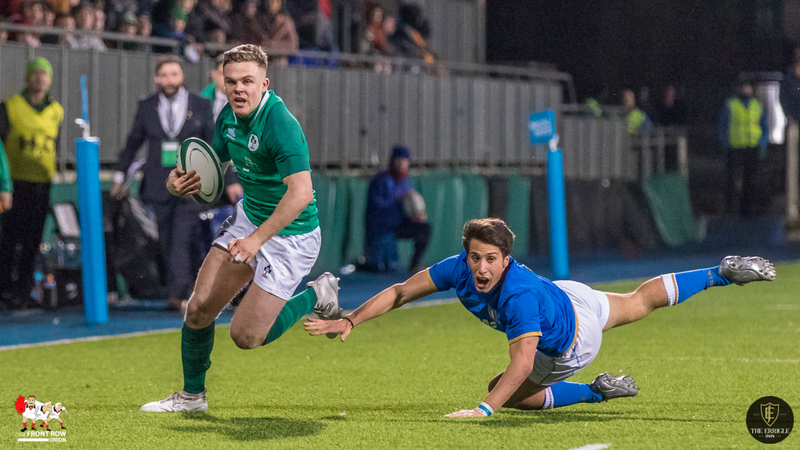 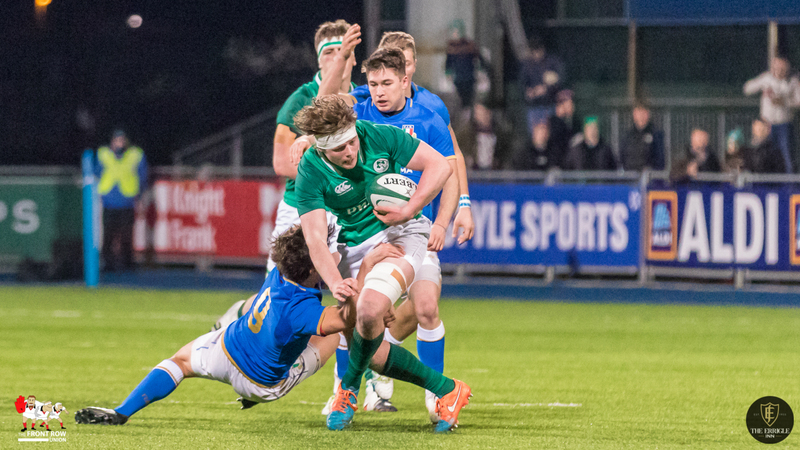 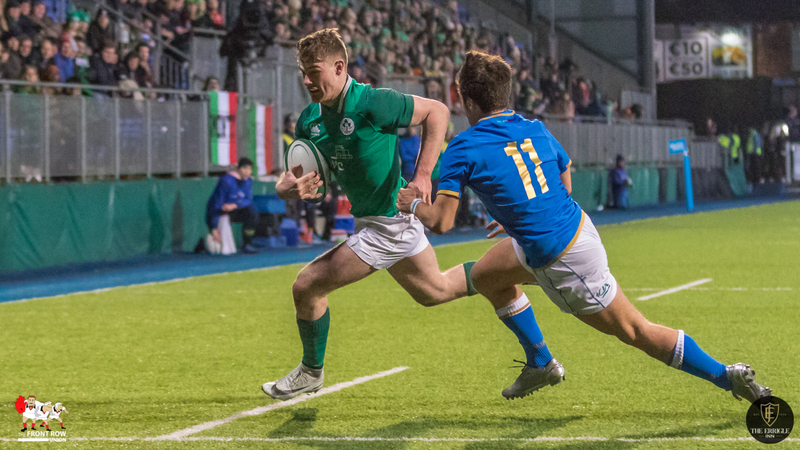 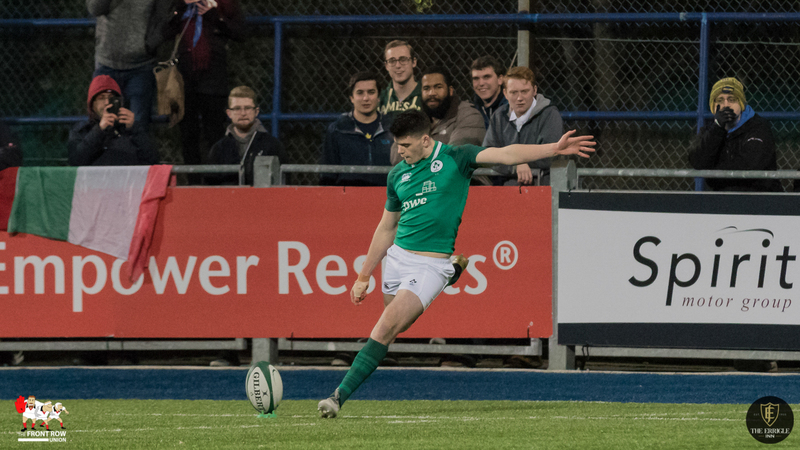 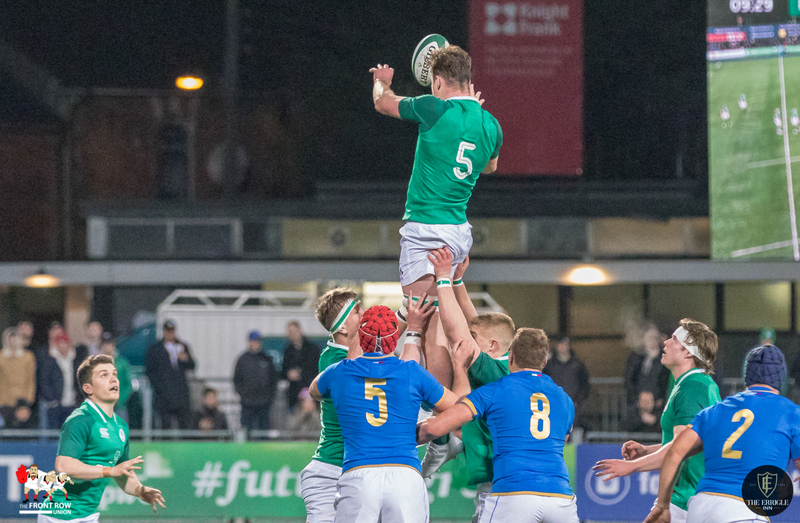 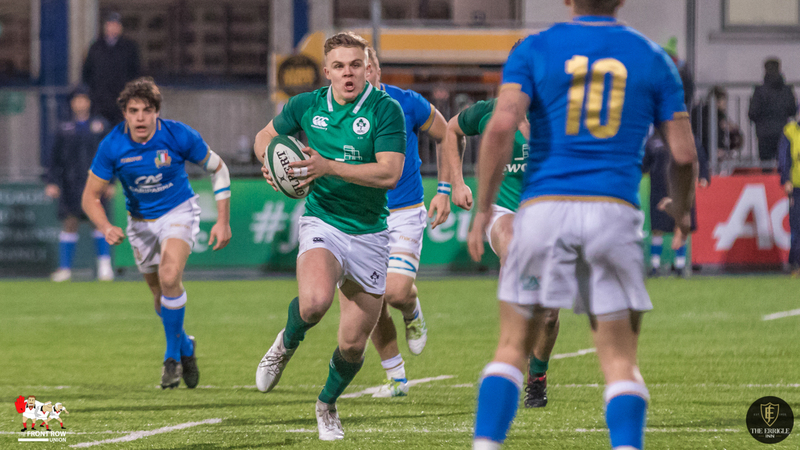 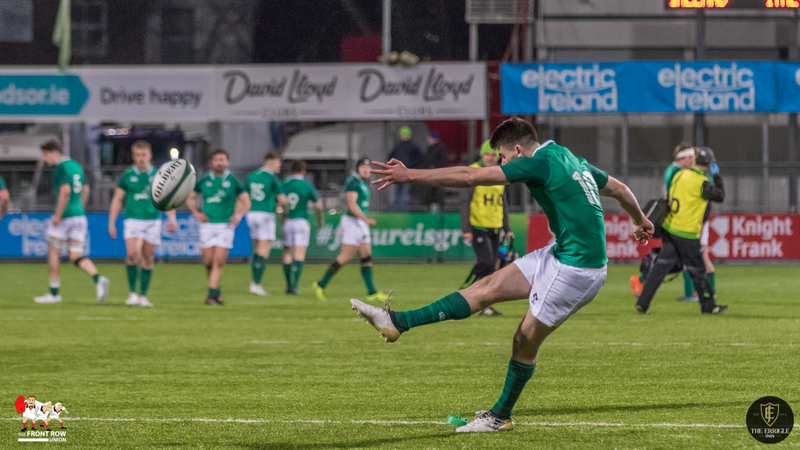 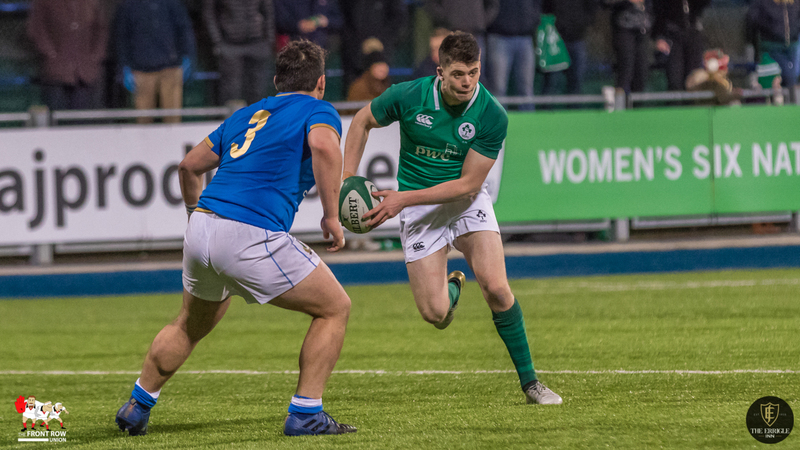 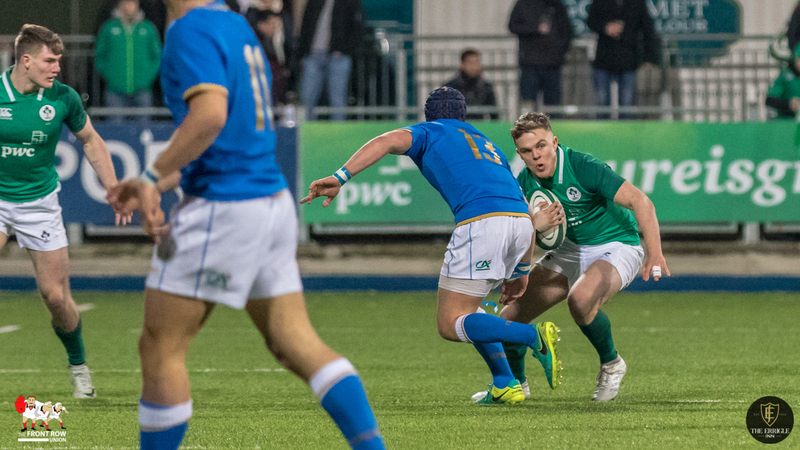 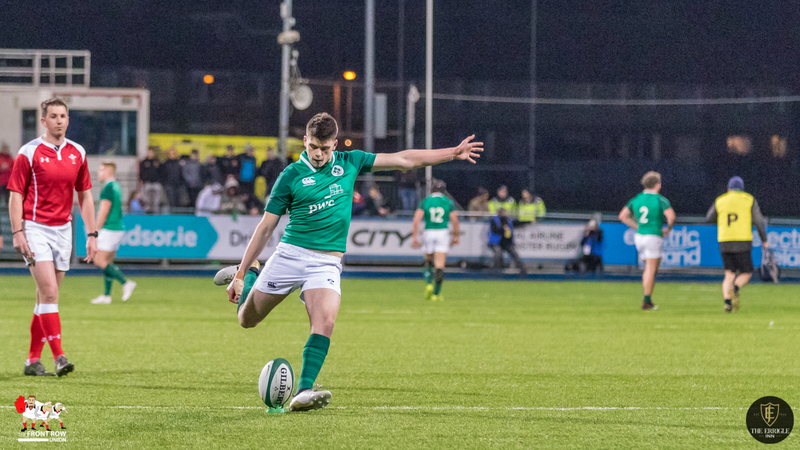 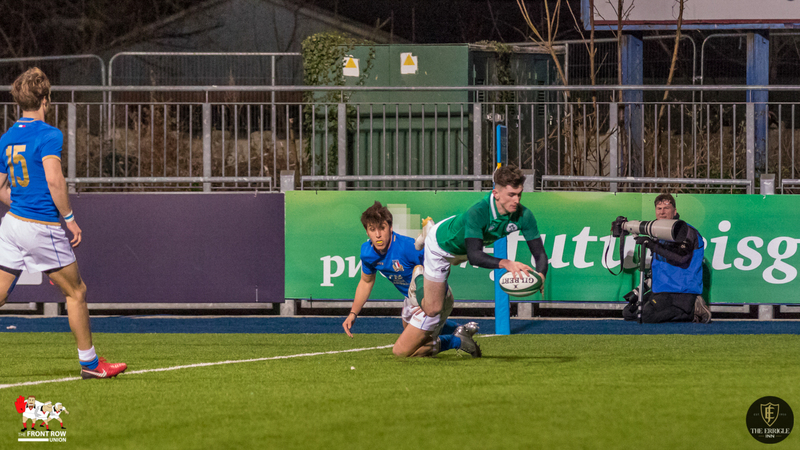 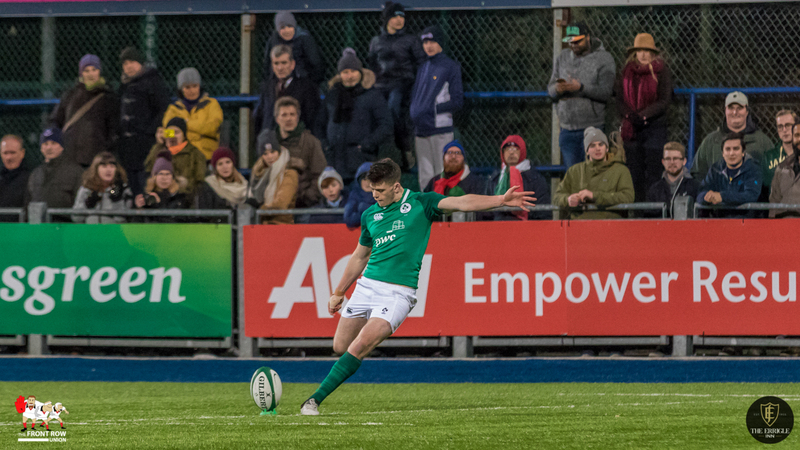 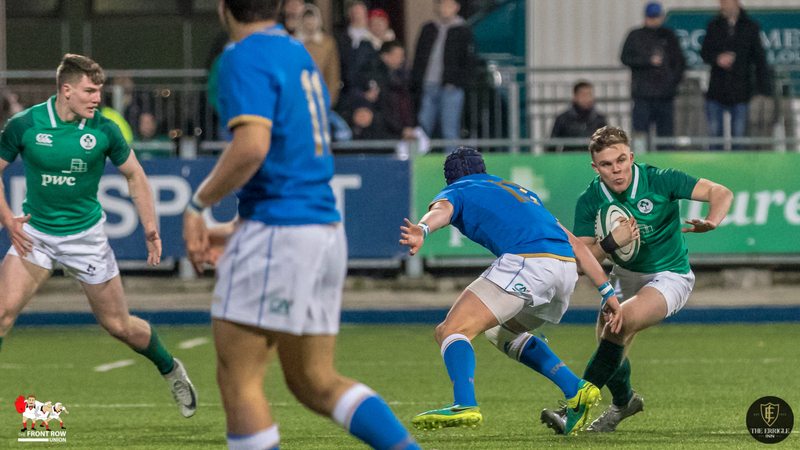 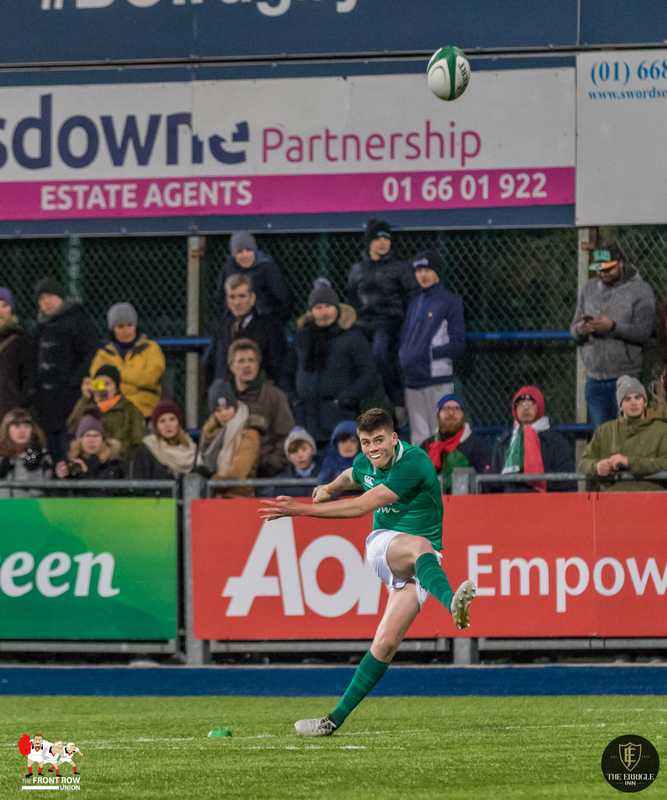 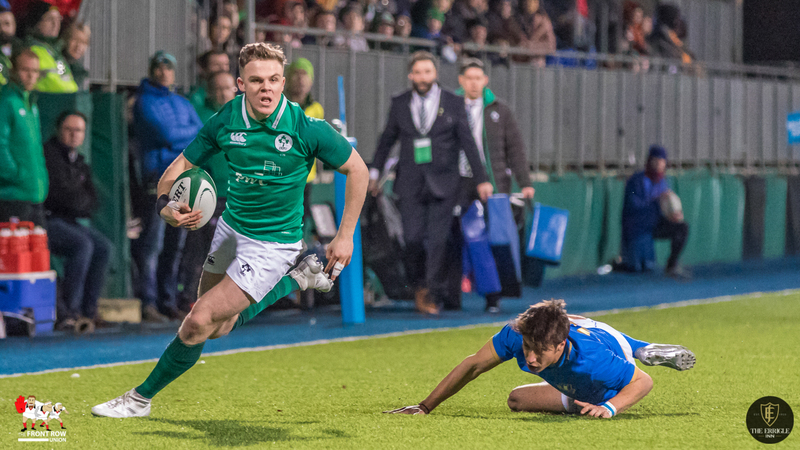 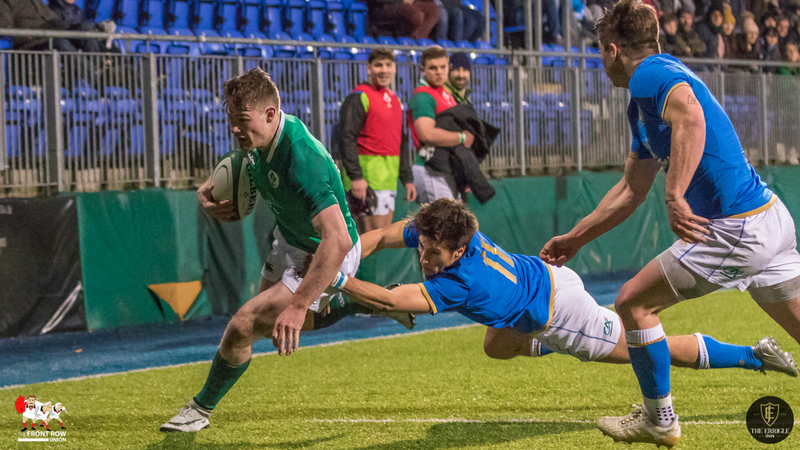 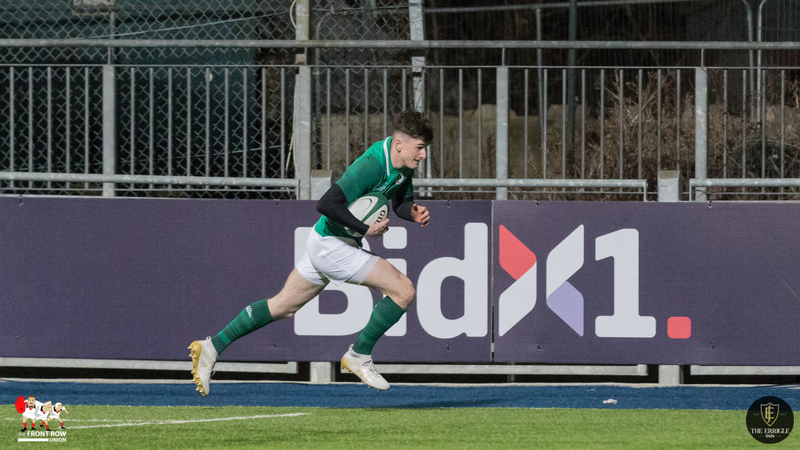 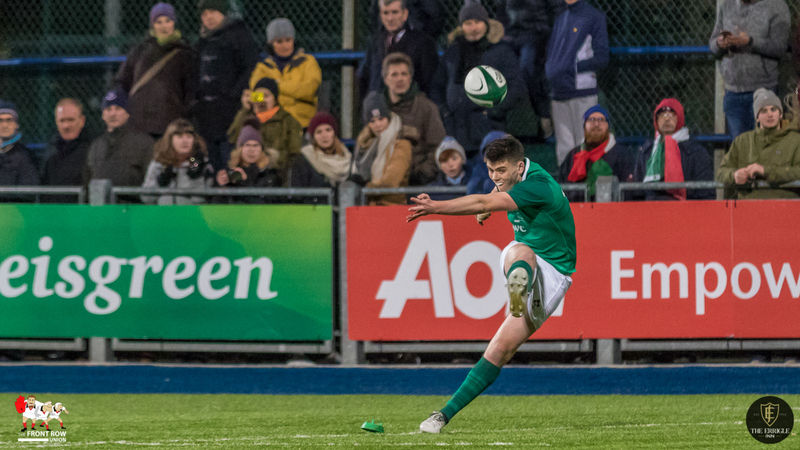 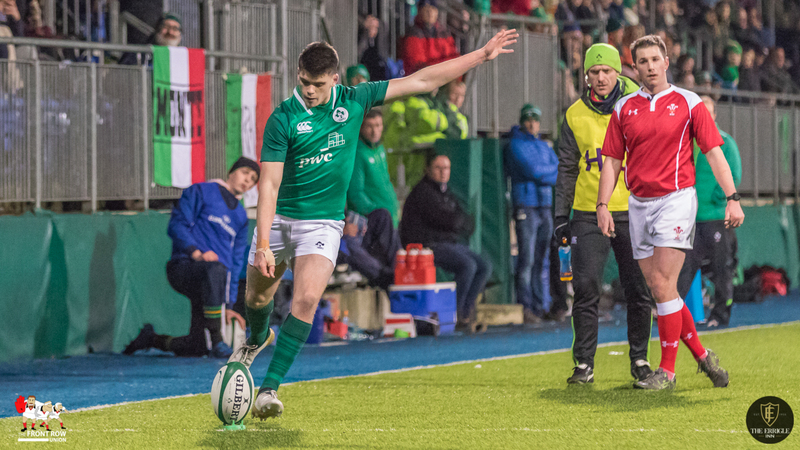 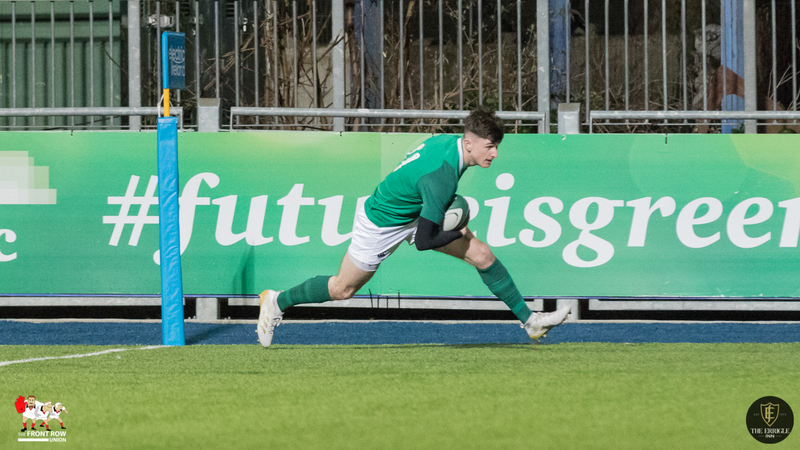 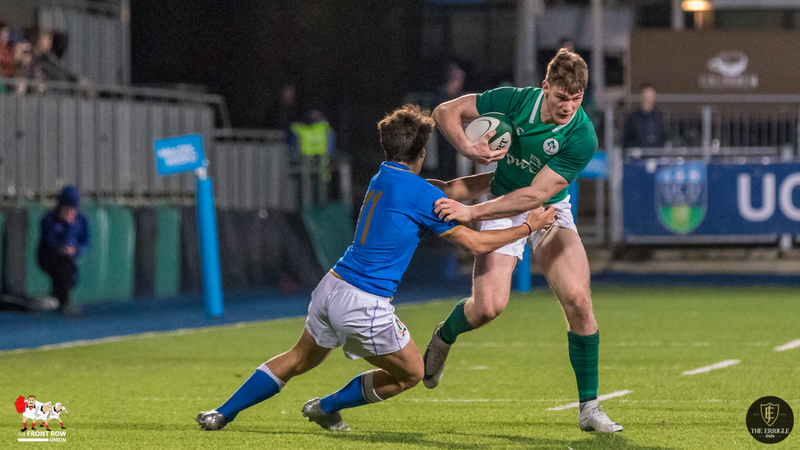 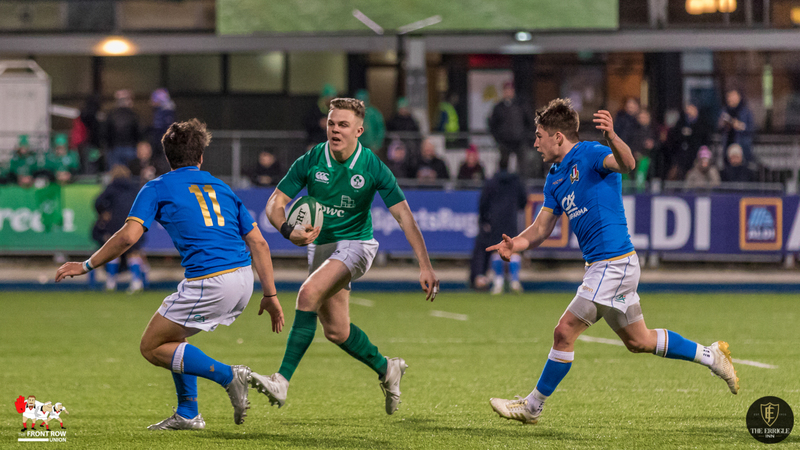 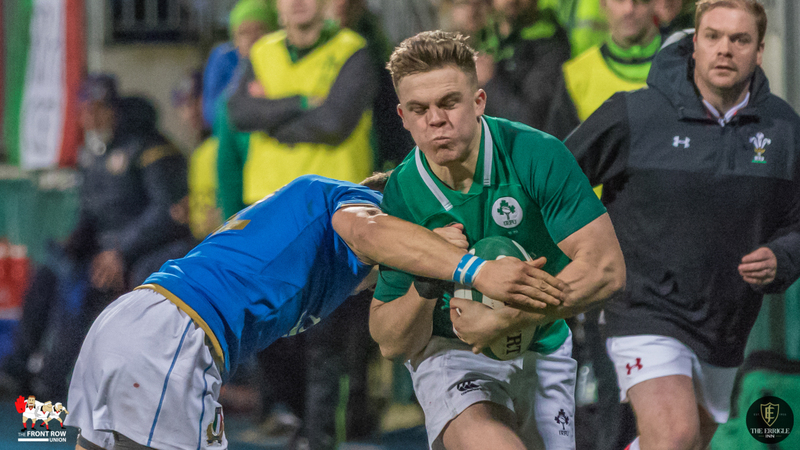 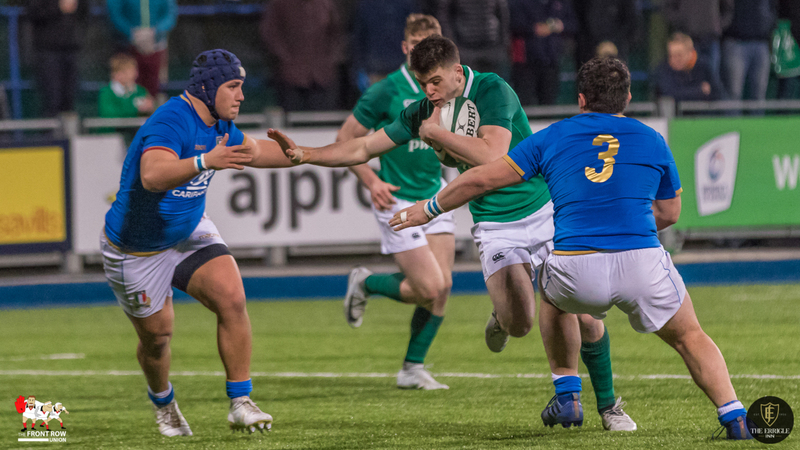 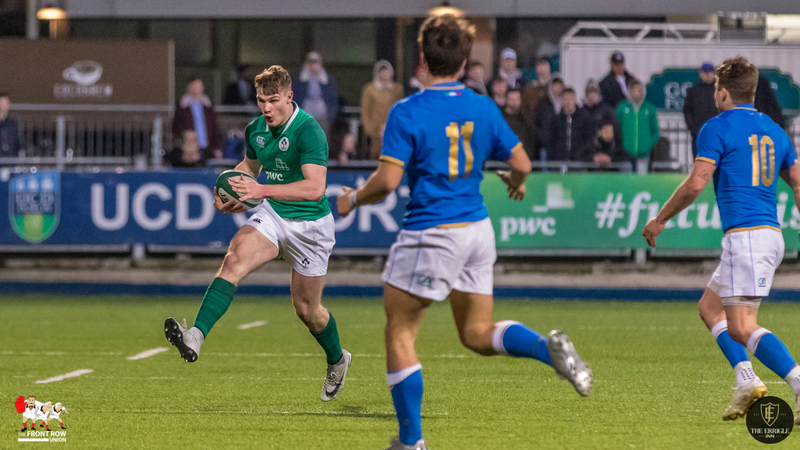 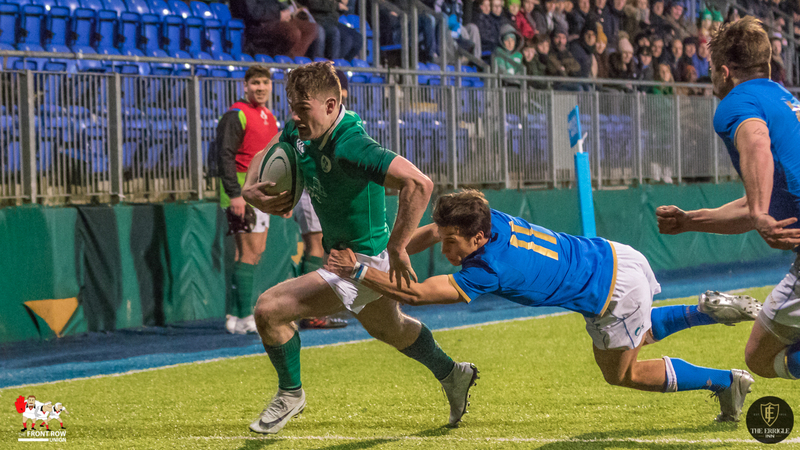 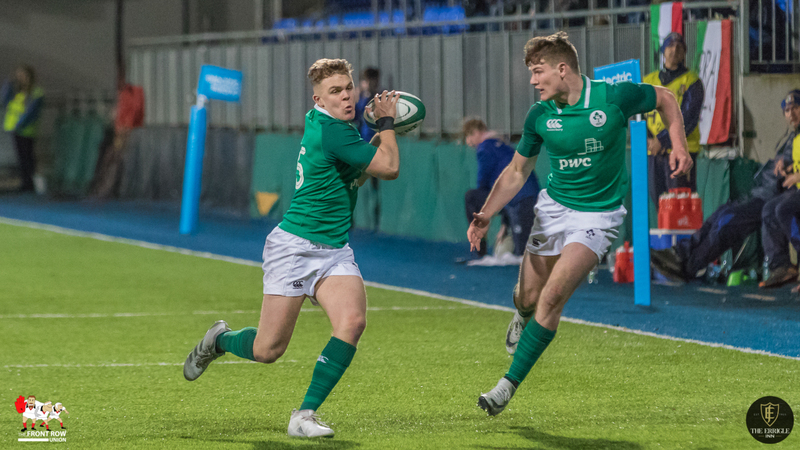 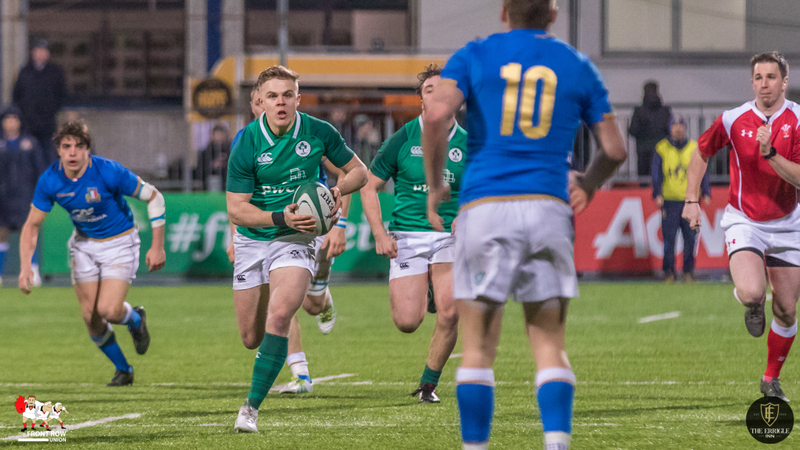 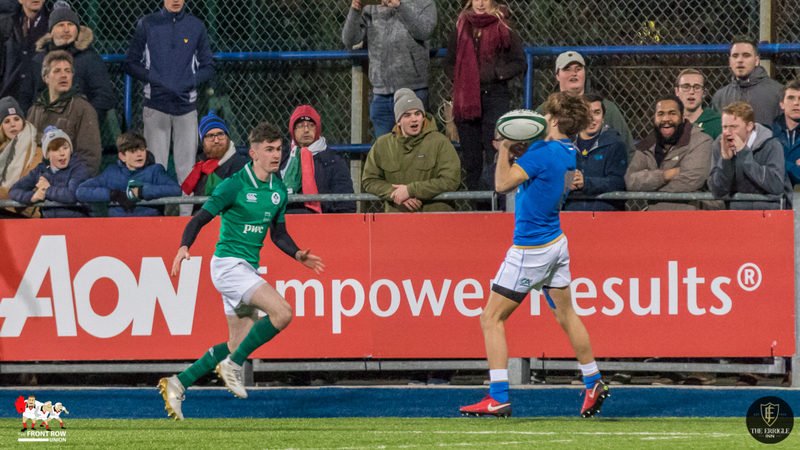 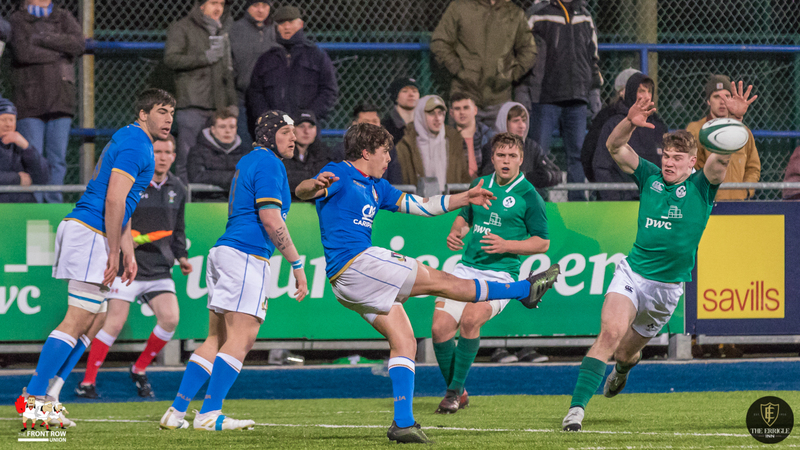 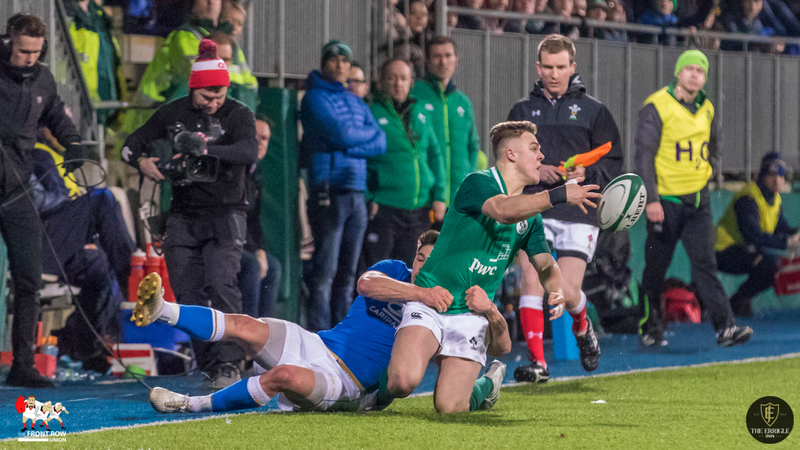 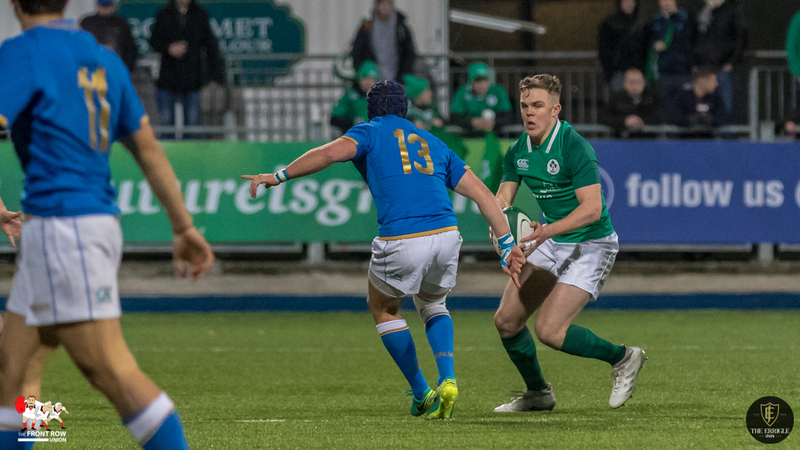 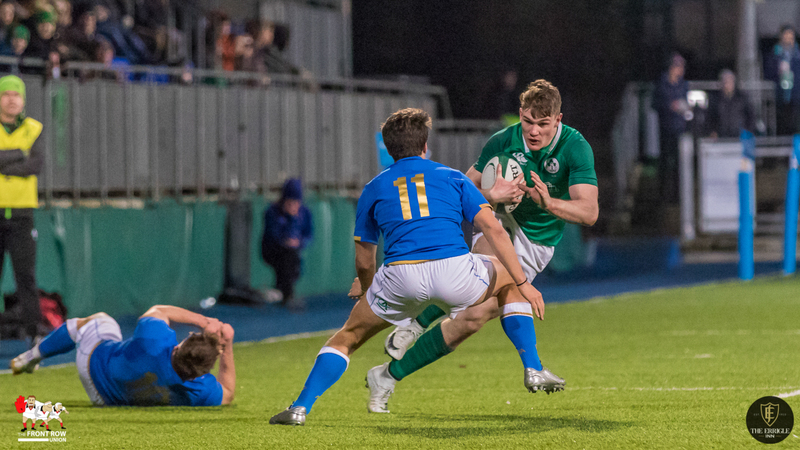 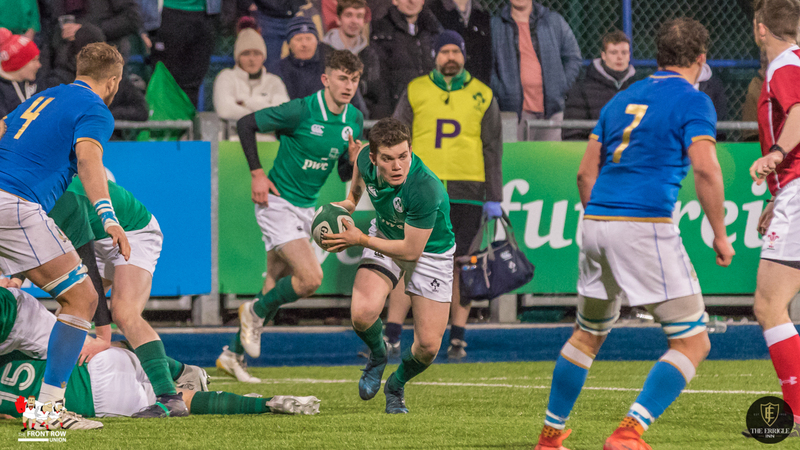 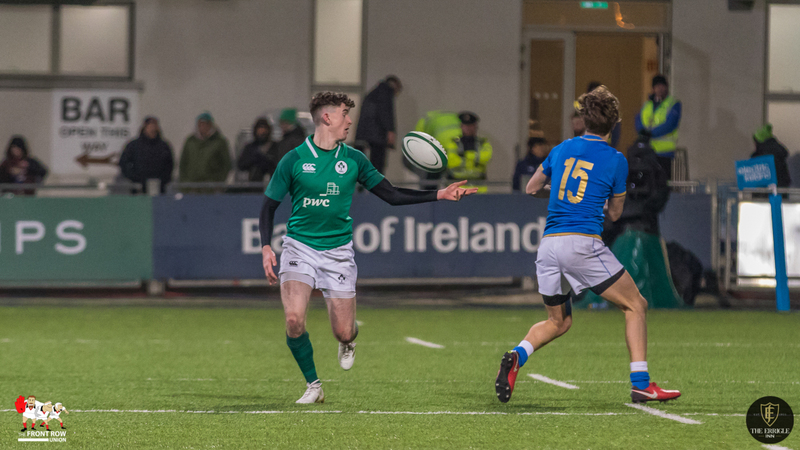 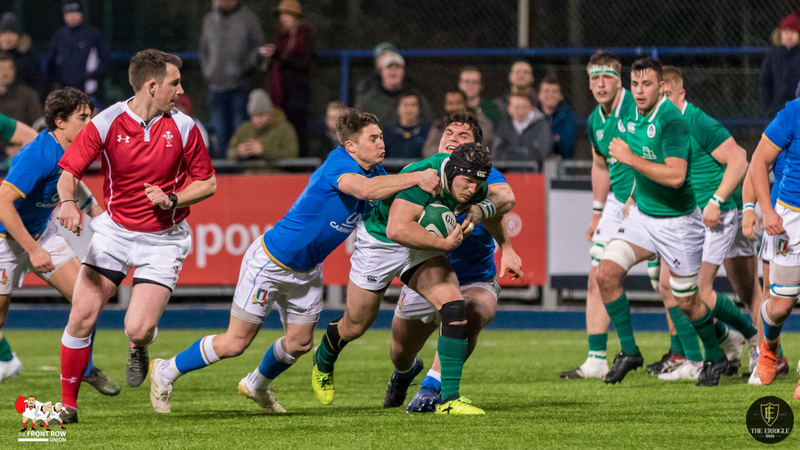 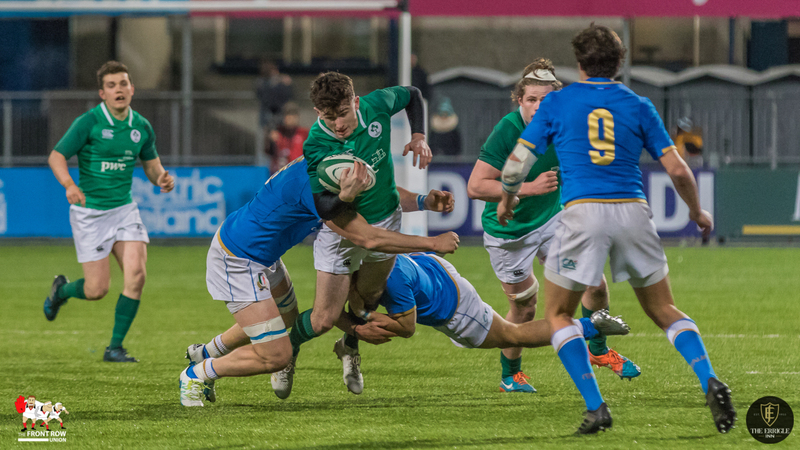 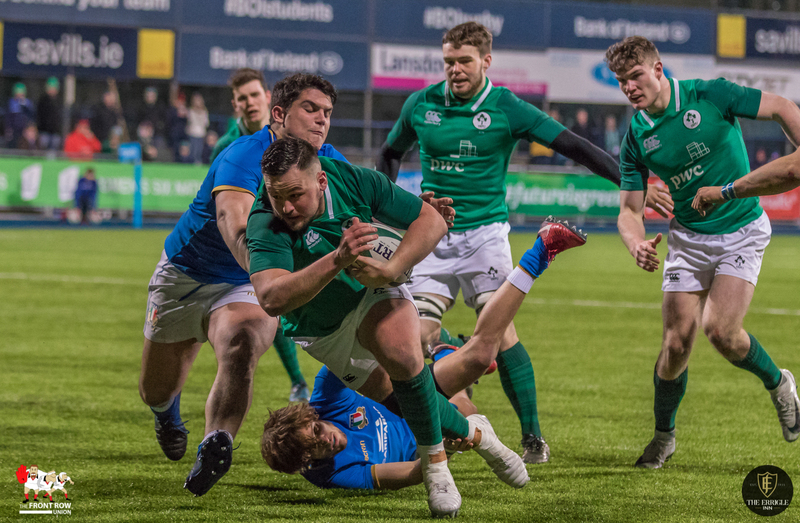 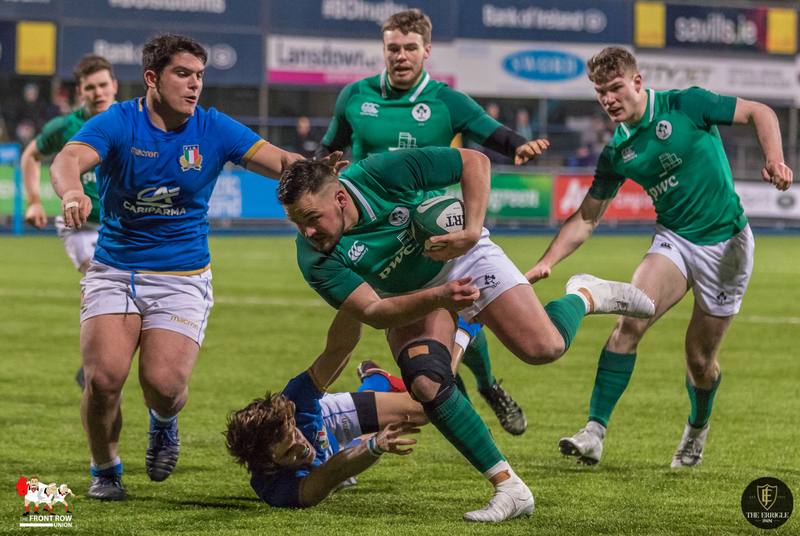 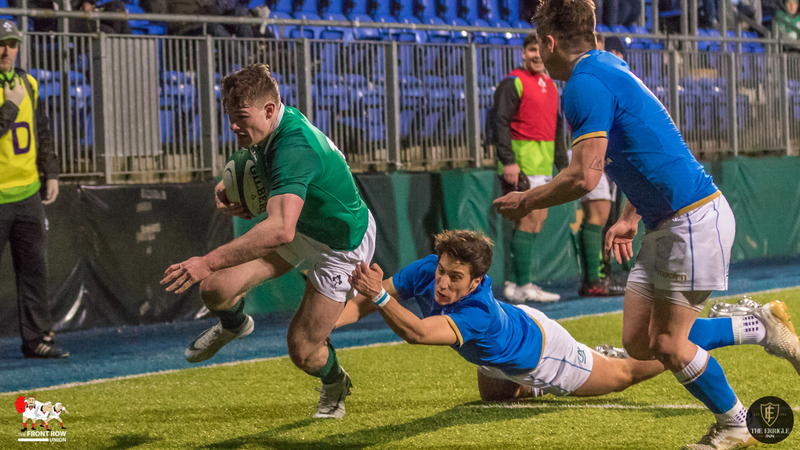 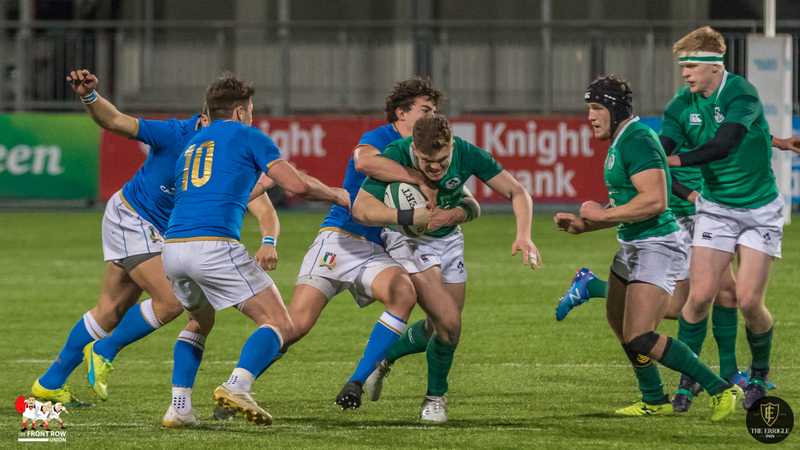 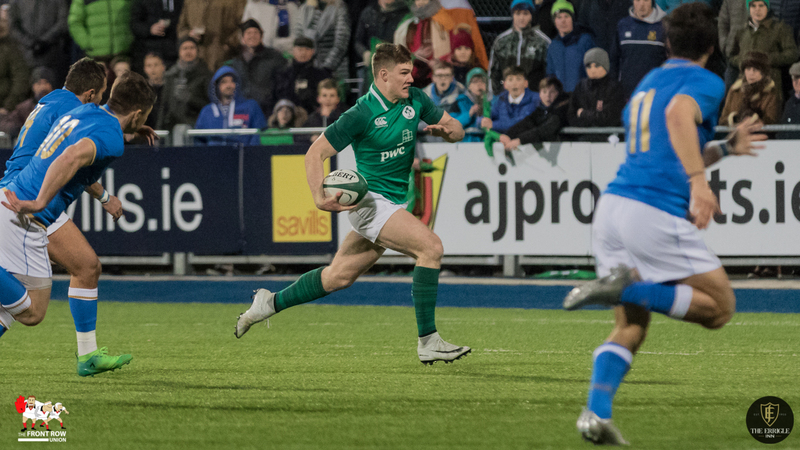 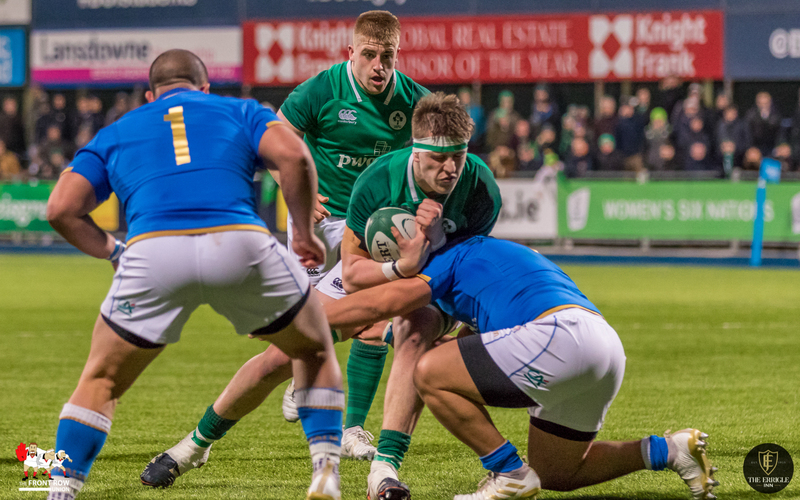 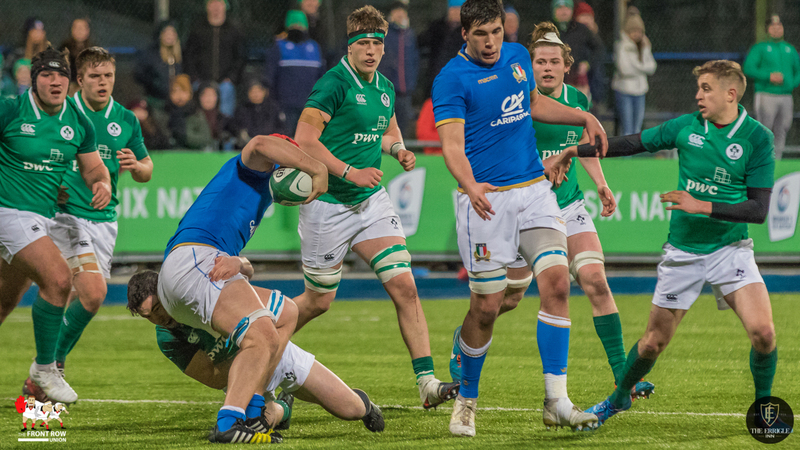 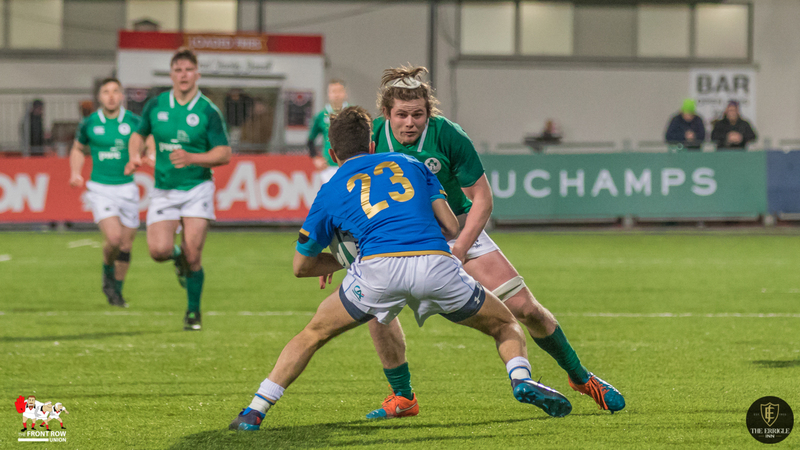 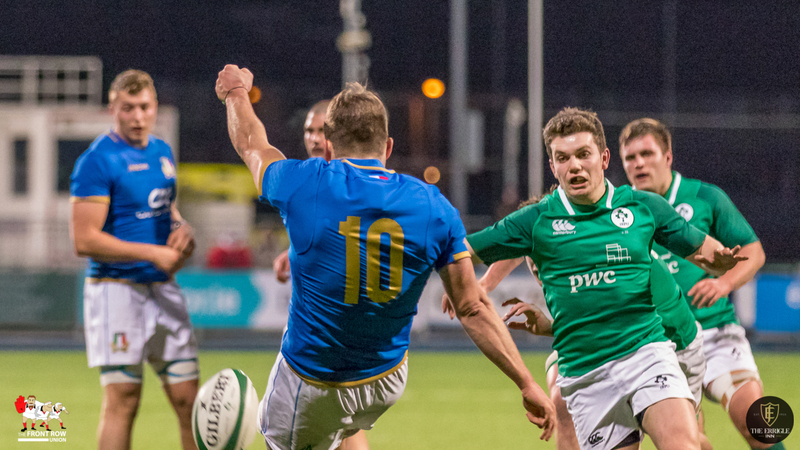 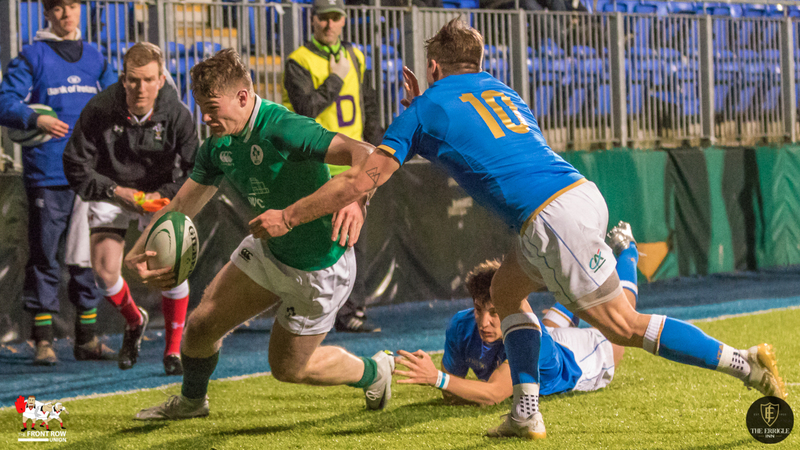 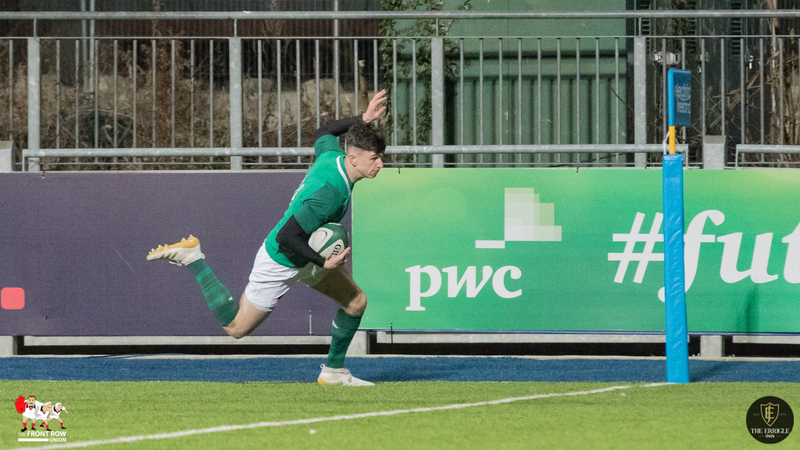 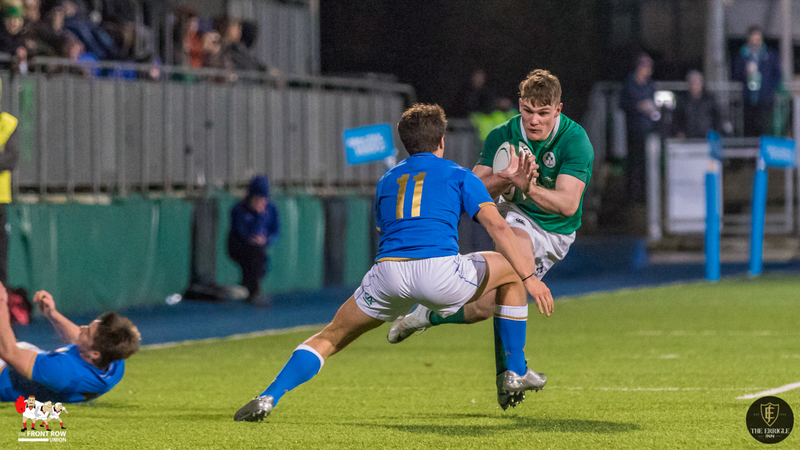 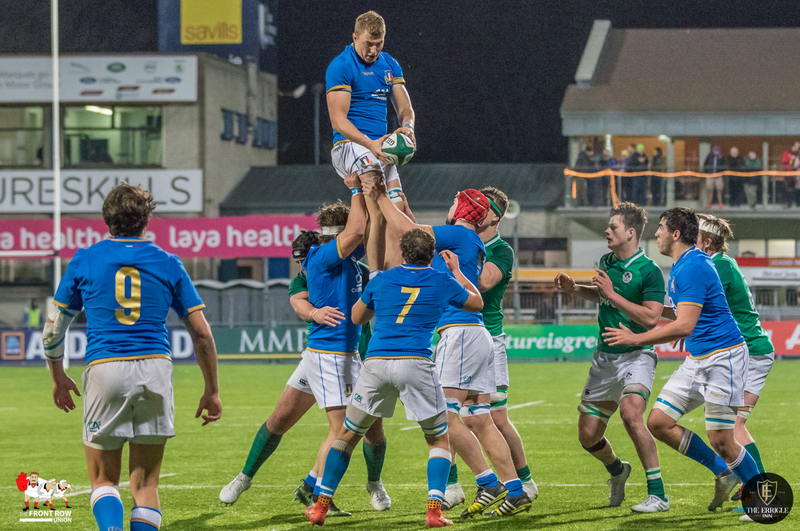 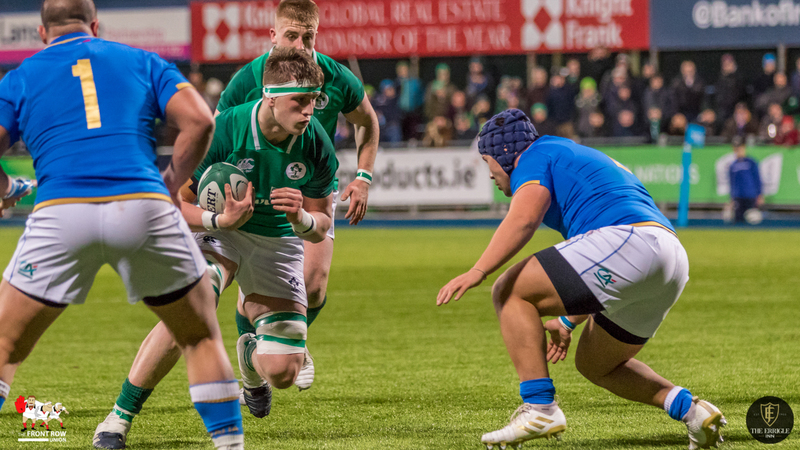 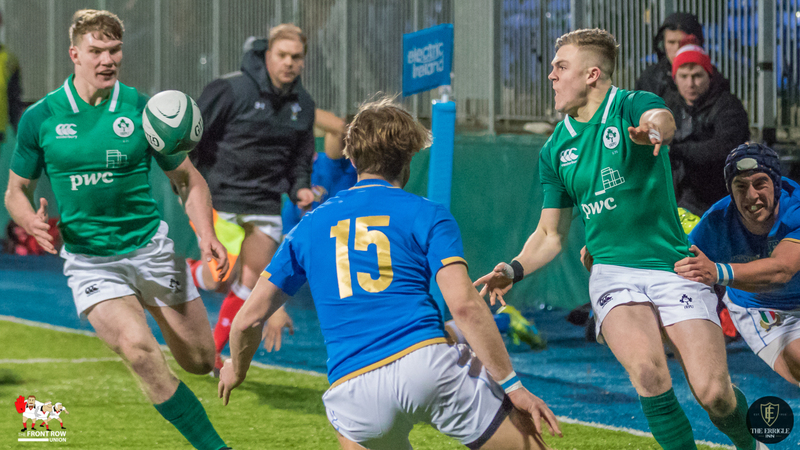 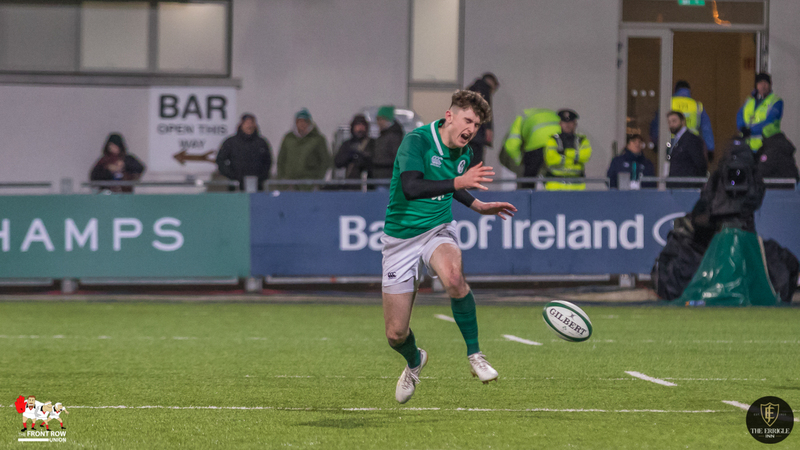 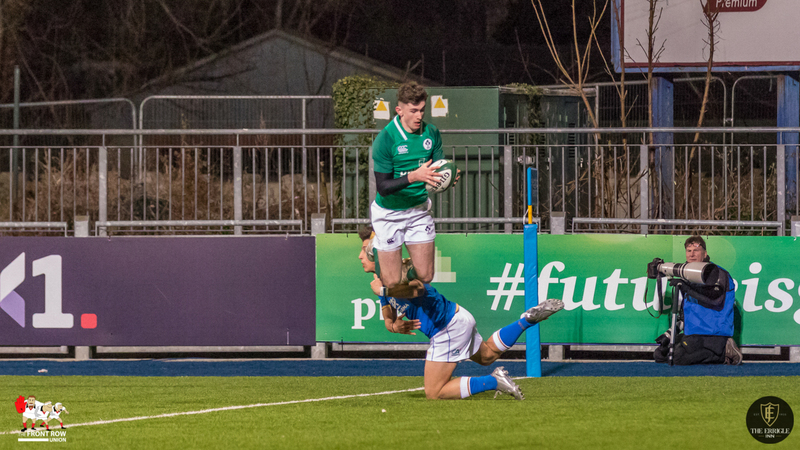 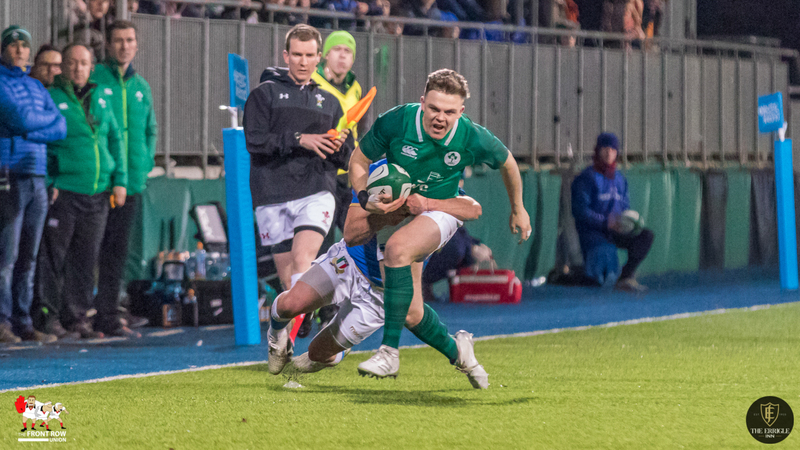 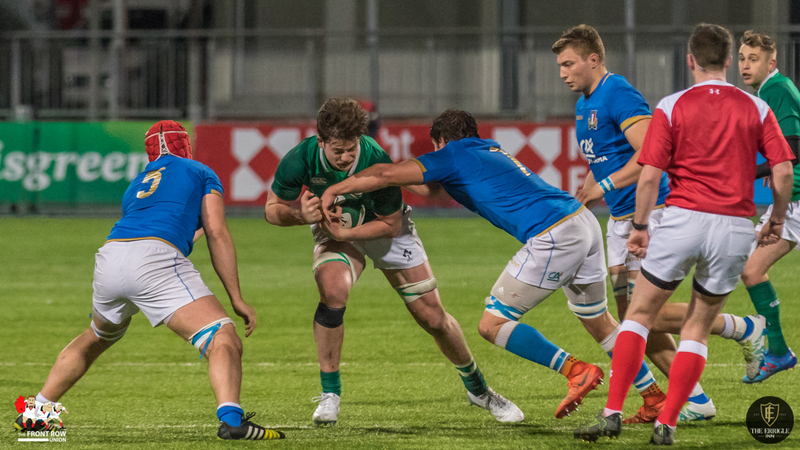 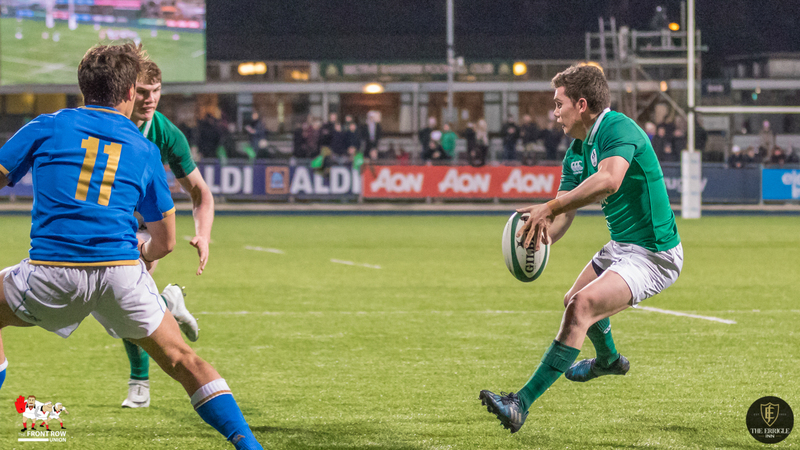 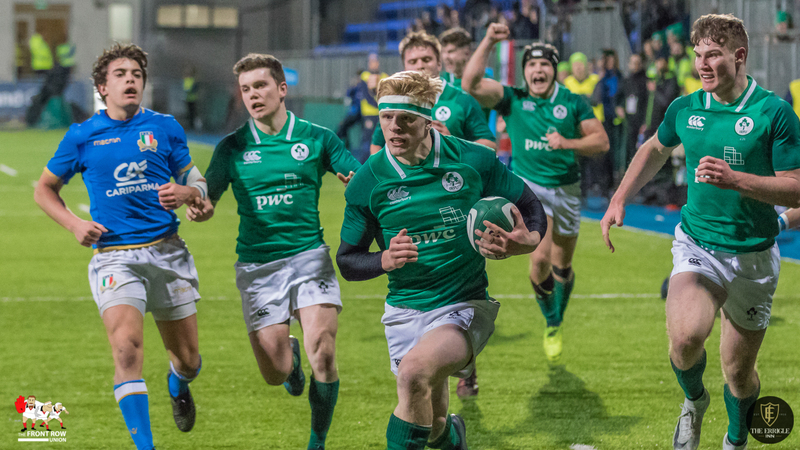 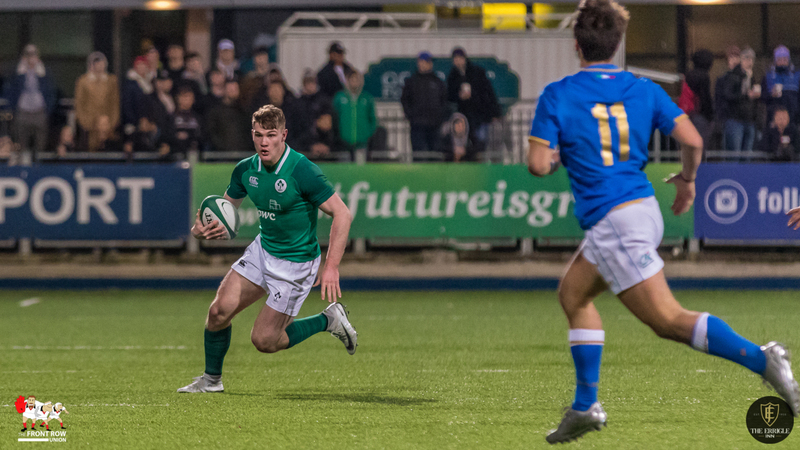 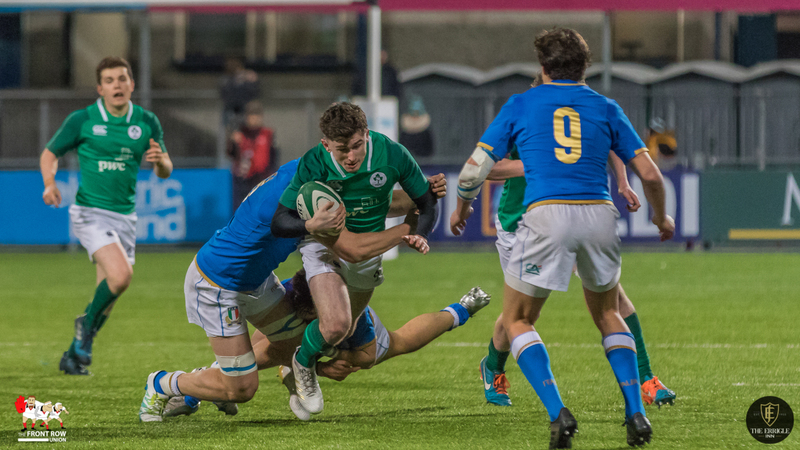 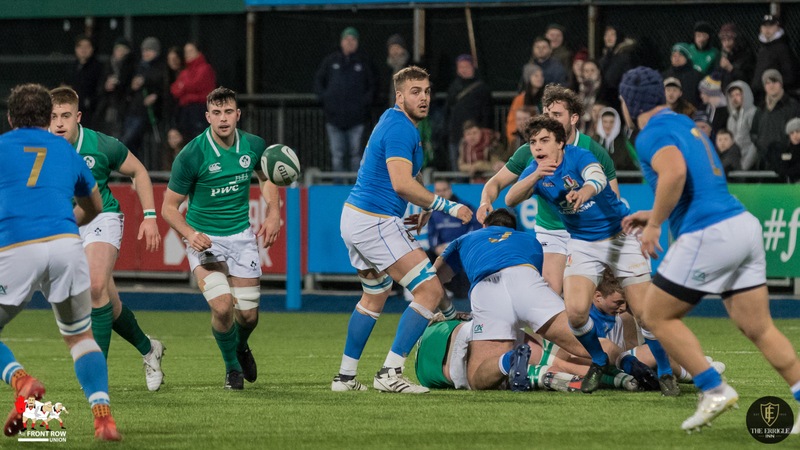 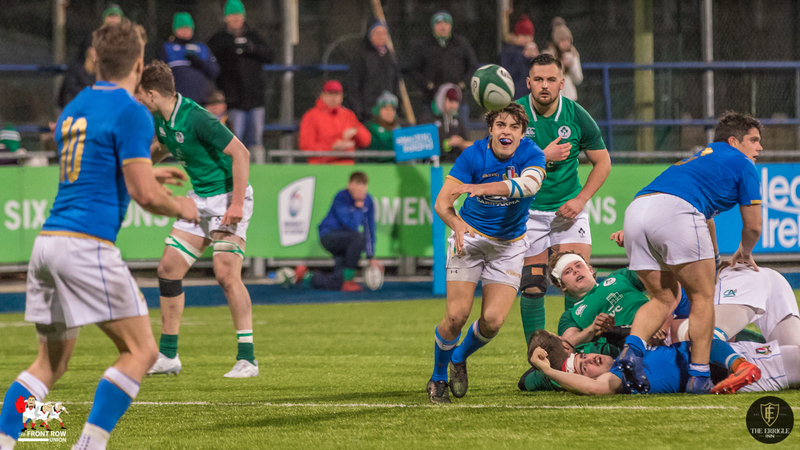 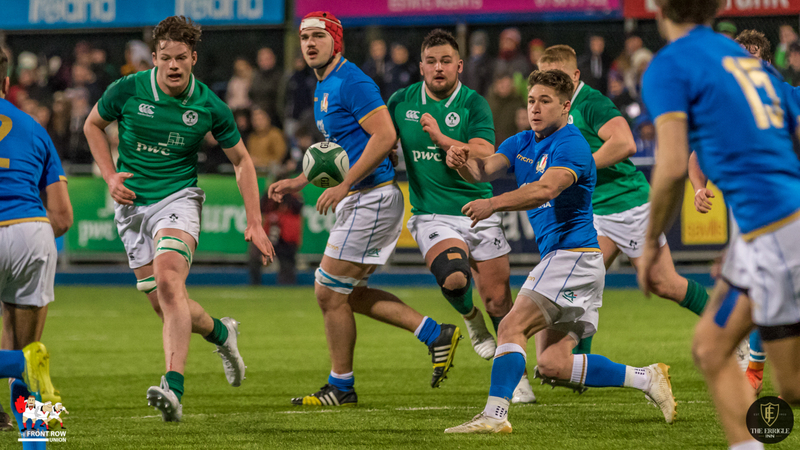 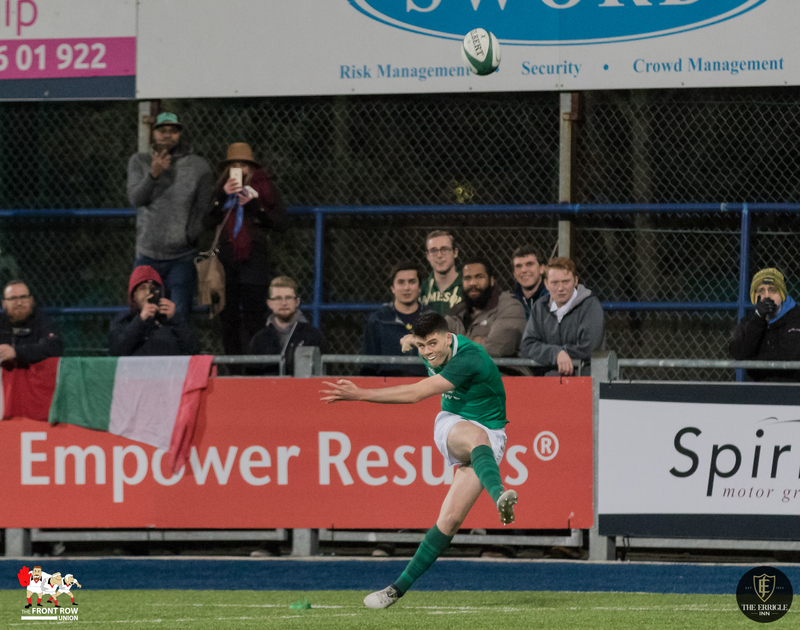 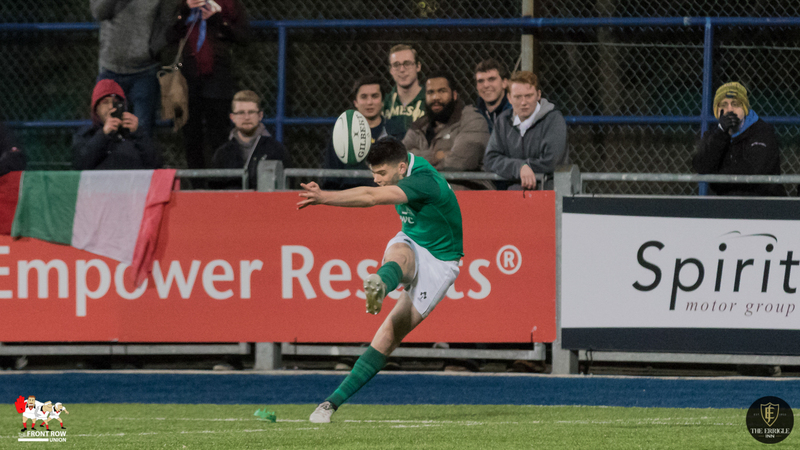 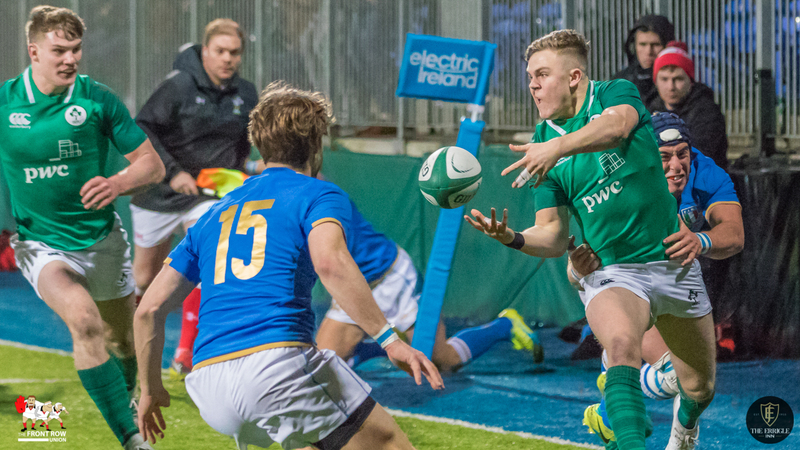 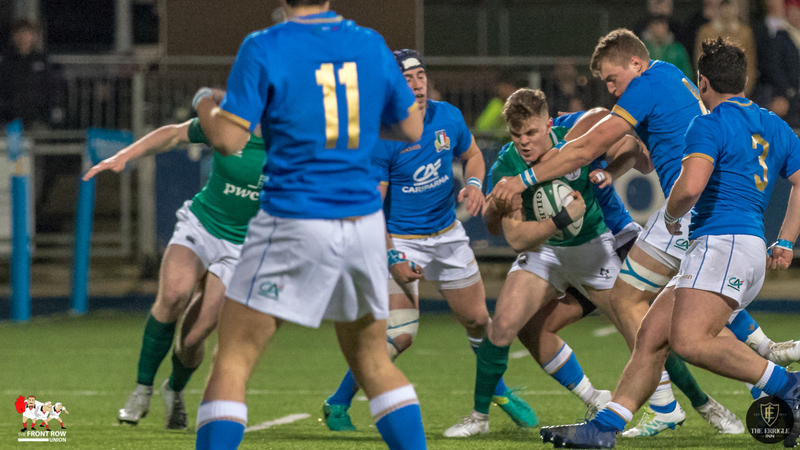 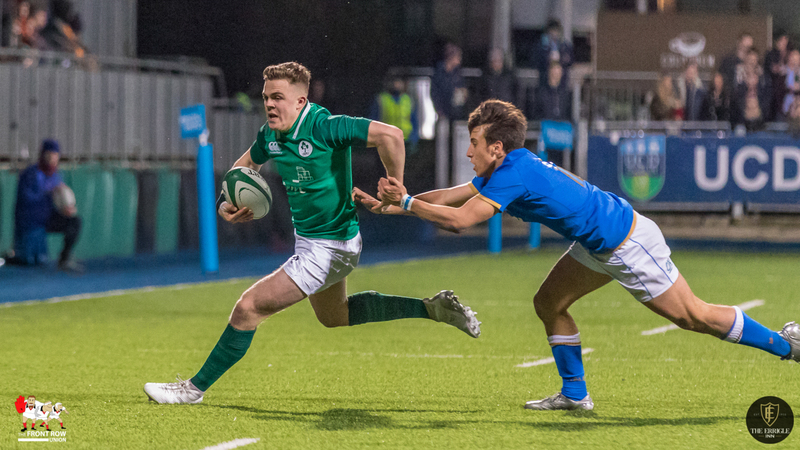 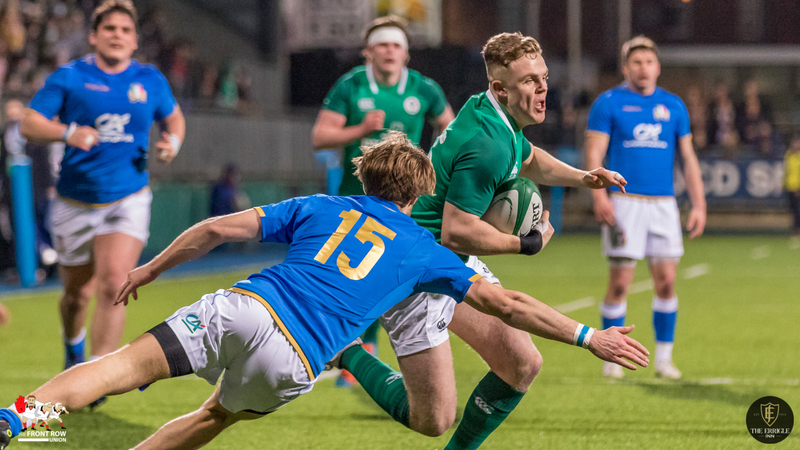 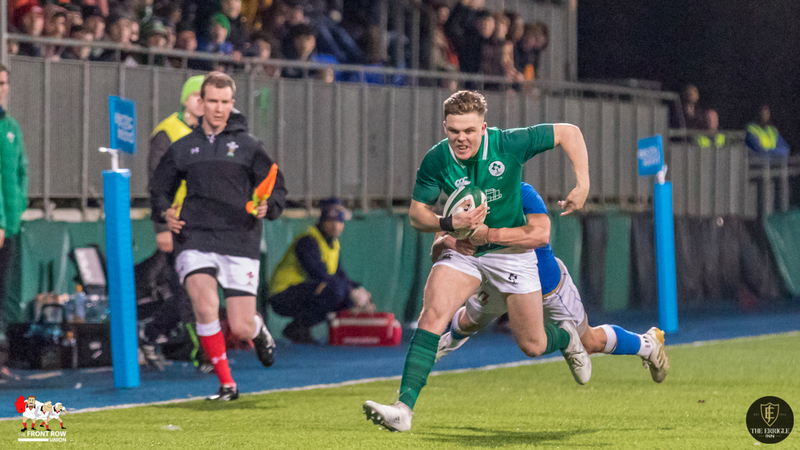 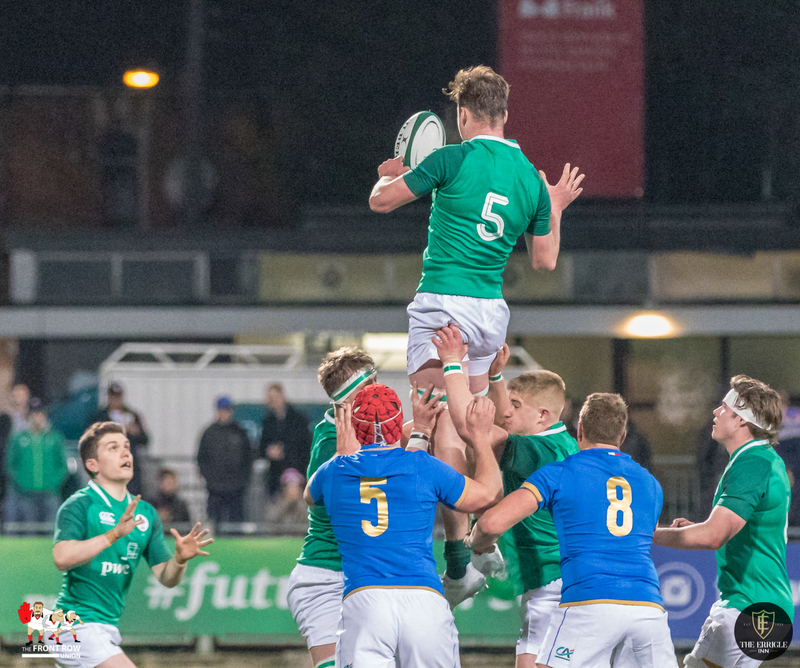 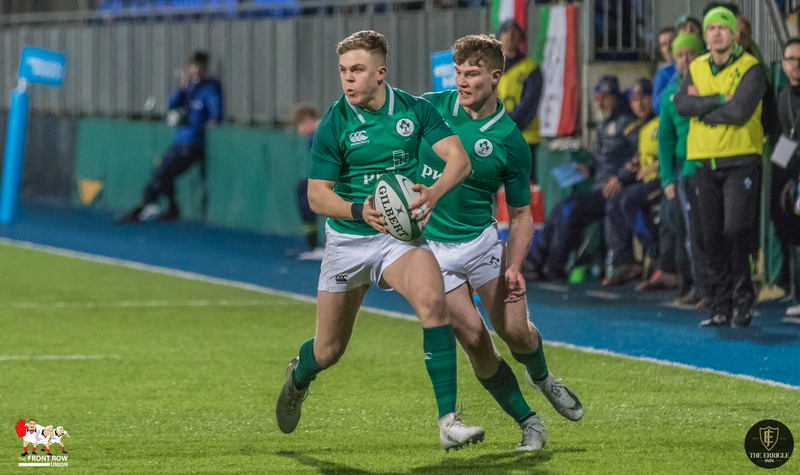 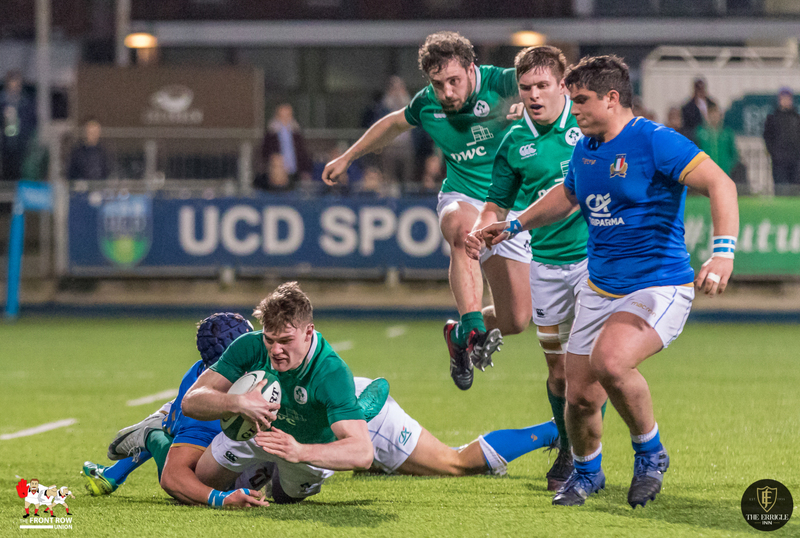 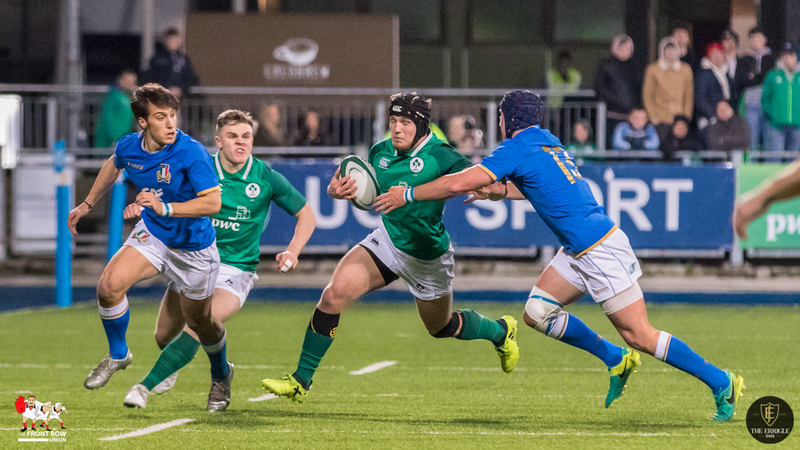 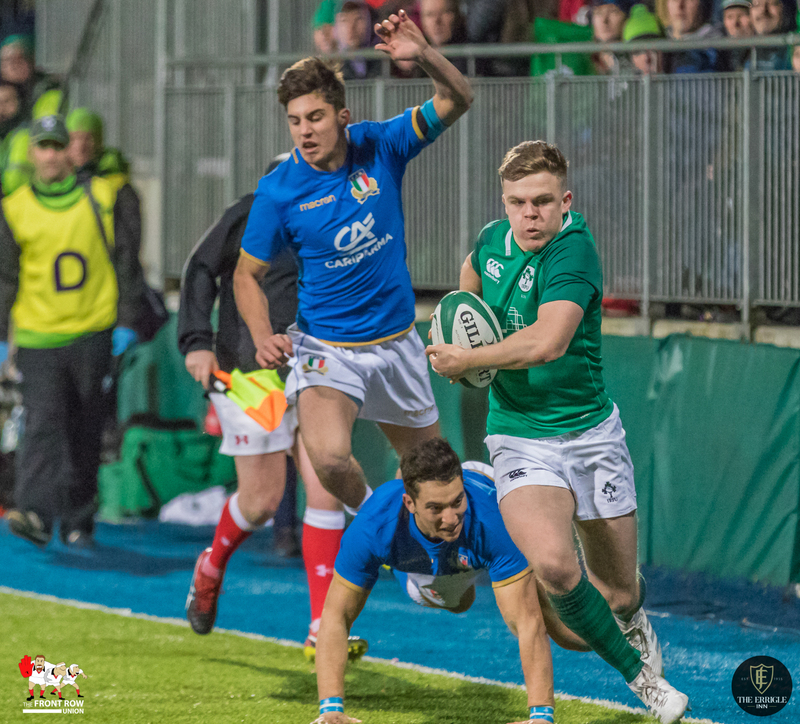 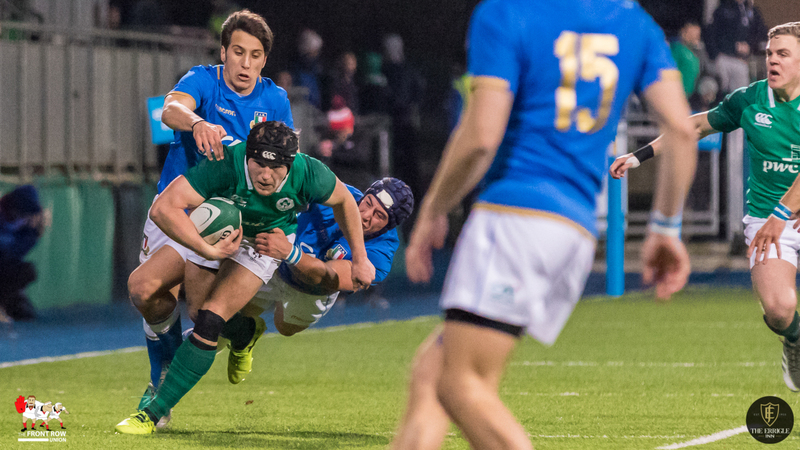 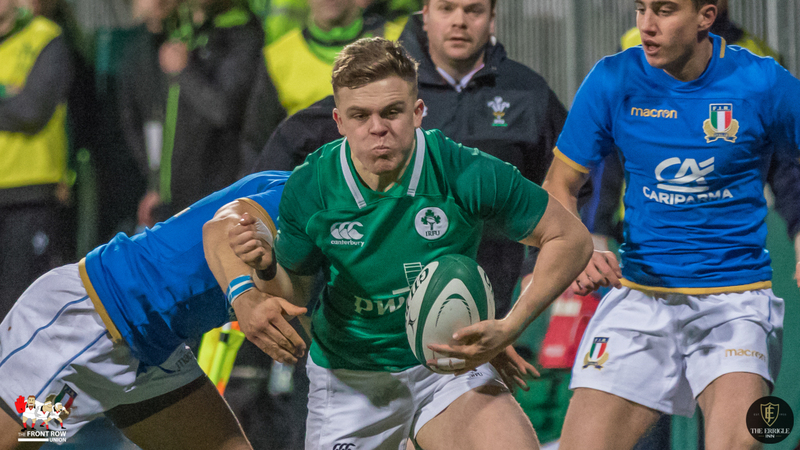 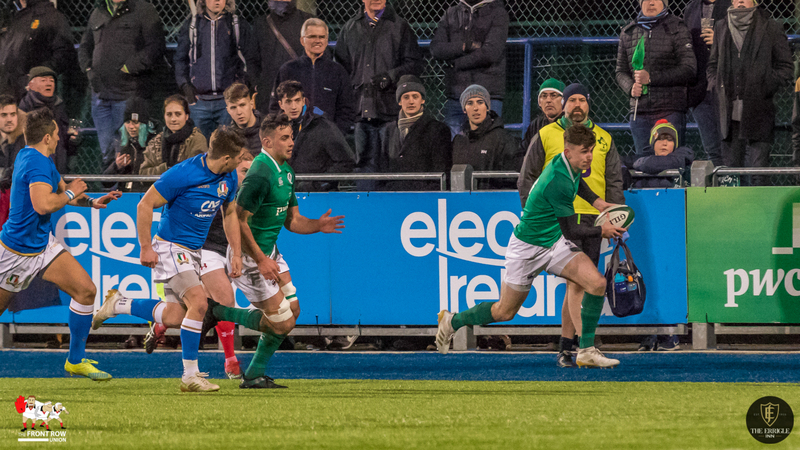 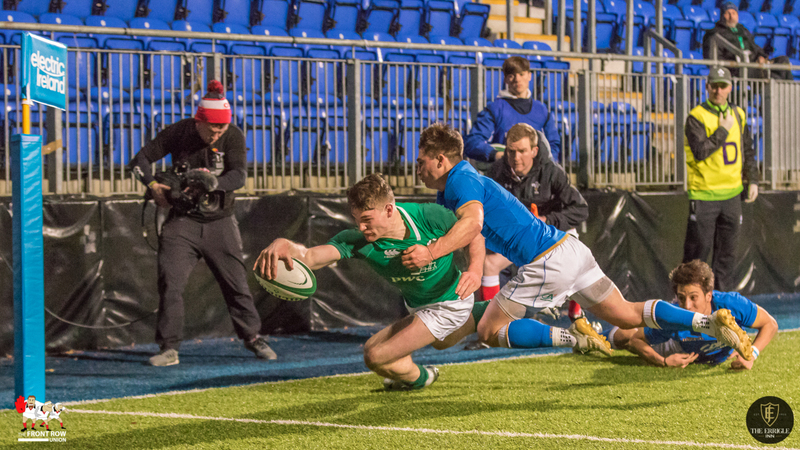 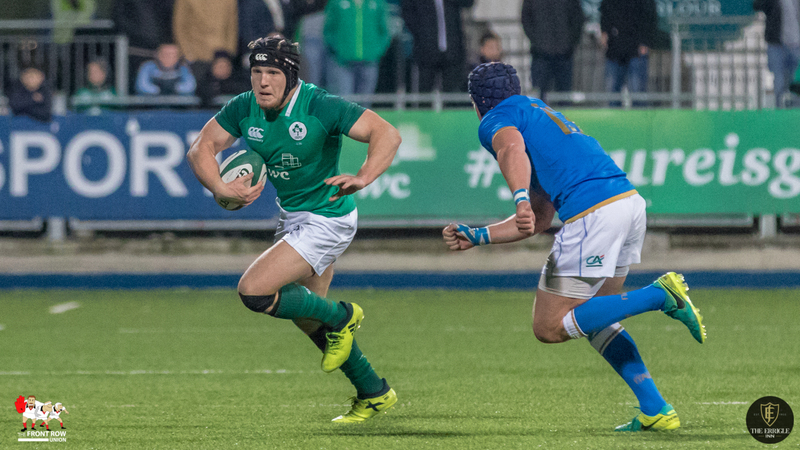 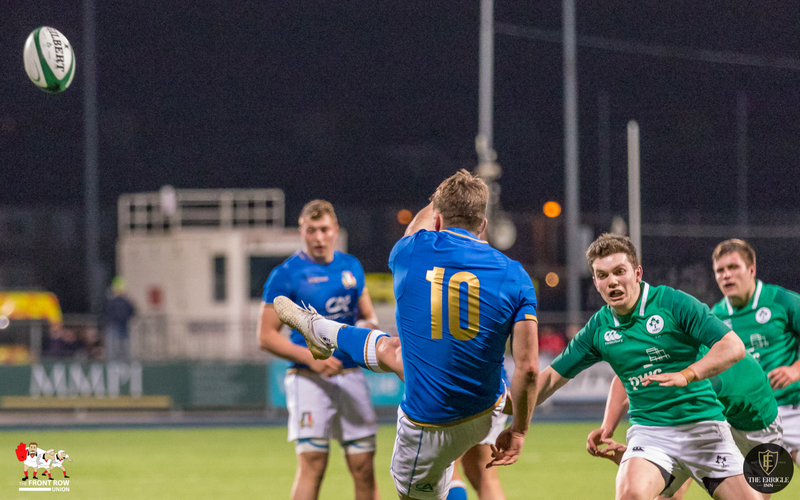 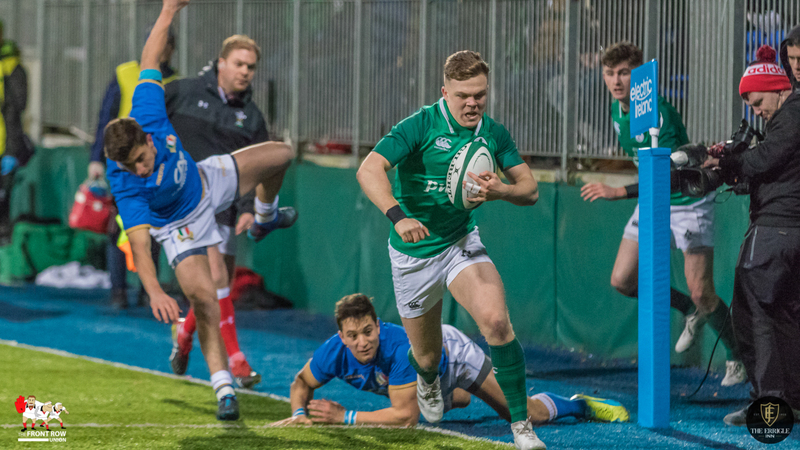 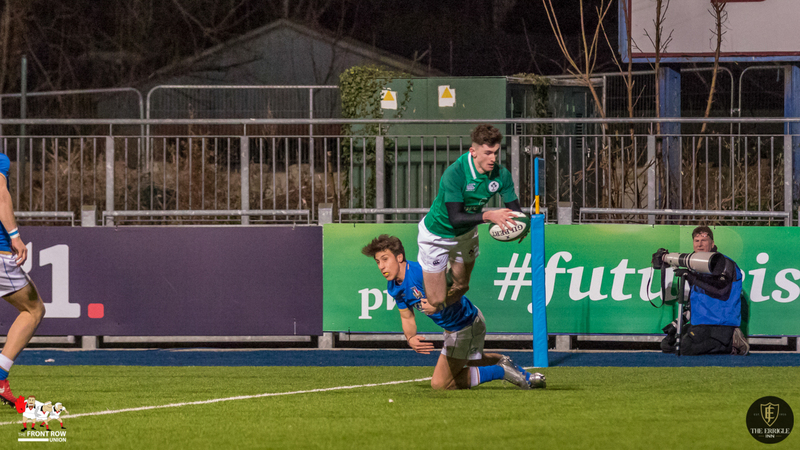 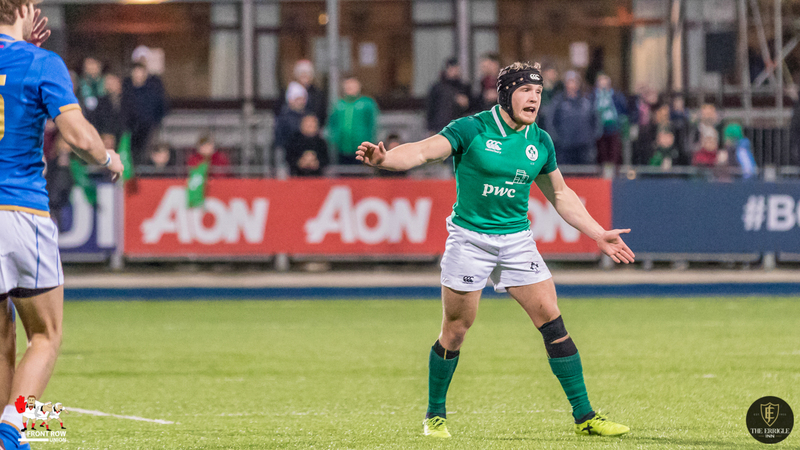 The U20 Six Nations tournament continued on Friday night with wins for Ireland, England and France, all three recording a bonus point win. 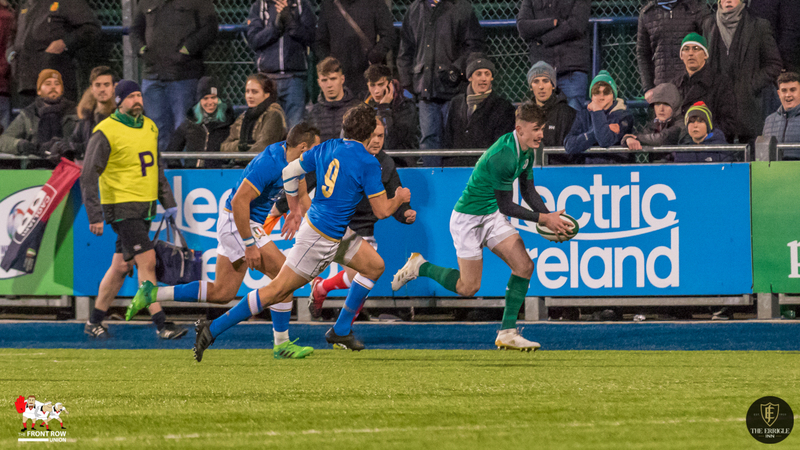 Ireland made hard work of it against a 14 man Italy though England were rather more convincing and France whopped Scotland at Broadwood Stadium. 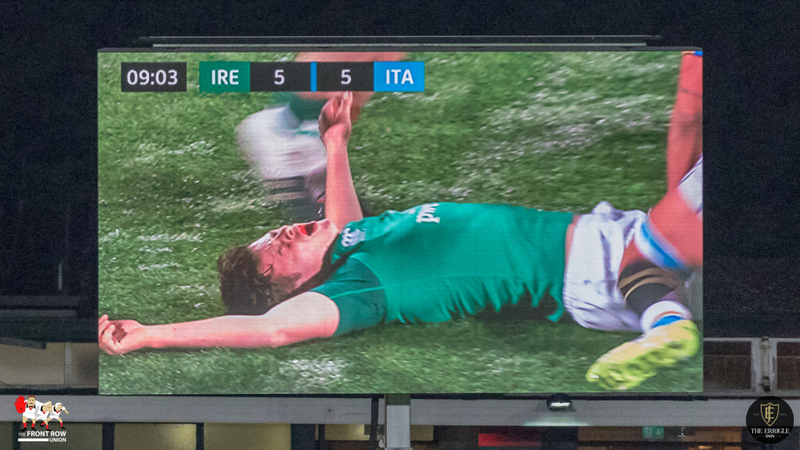 The results are shown below. 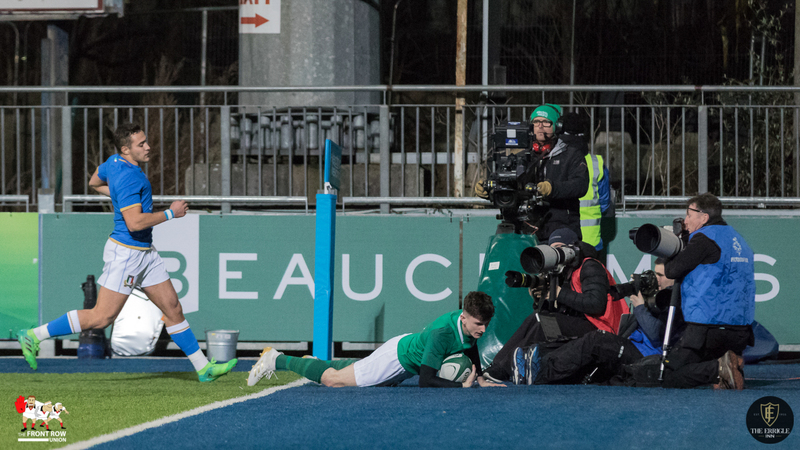 The results mean that France move to the top of the table, above England on points difference, with Wales slipping down to to third, just above Ireland on points difference. 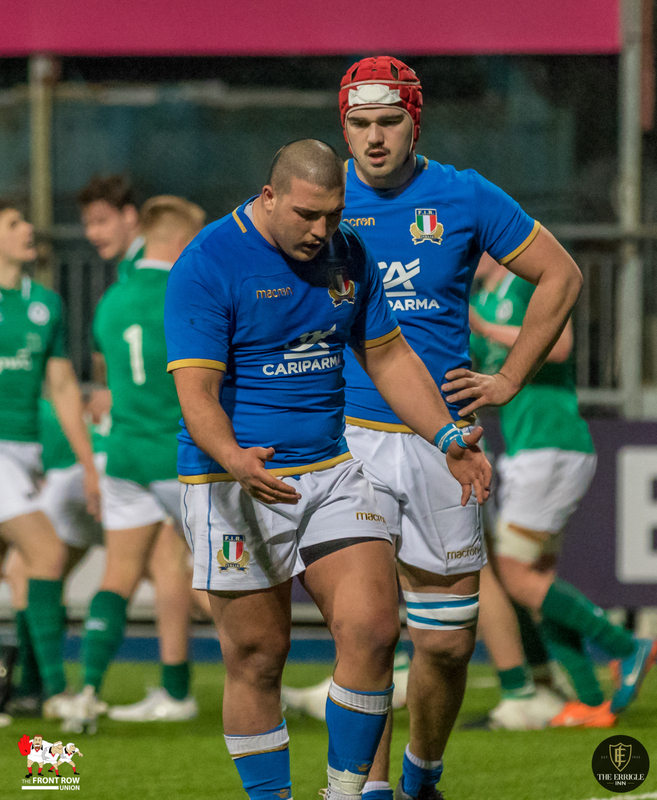 Italy, despite a difficult start with England at home and Ireland away, can take some comfort in that they picked up losing bonus points in both games but it looks as though it’s going to be a difficult tournament for Scotland who have already shipped over 100 points in their two games. 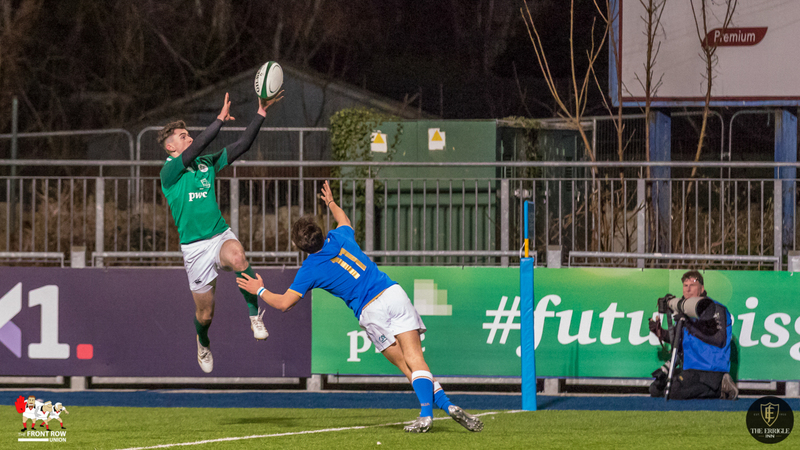 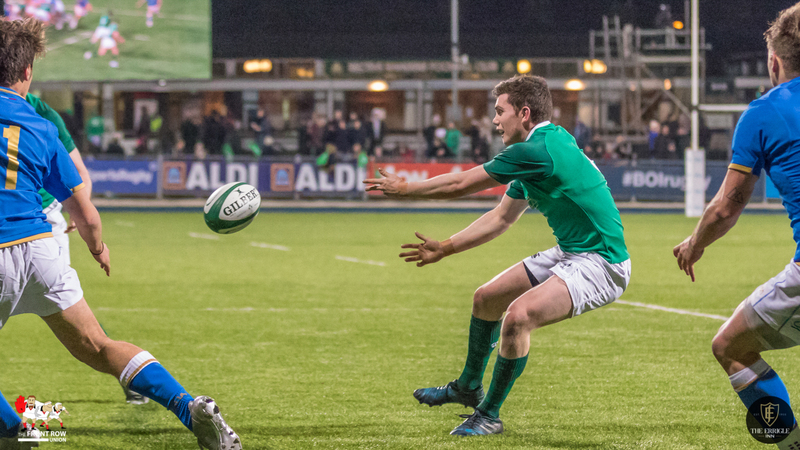 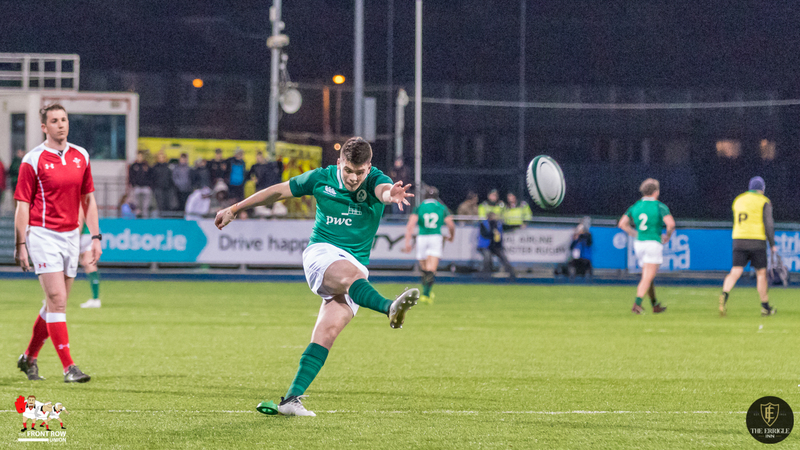 We caught up with Ireland U20’s on Friday night at Donnybrook in pretty much perfect conditions for playing rugby. 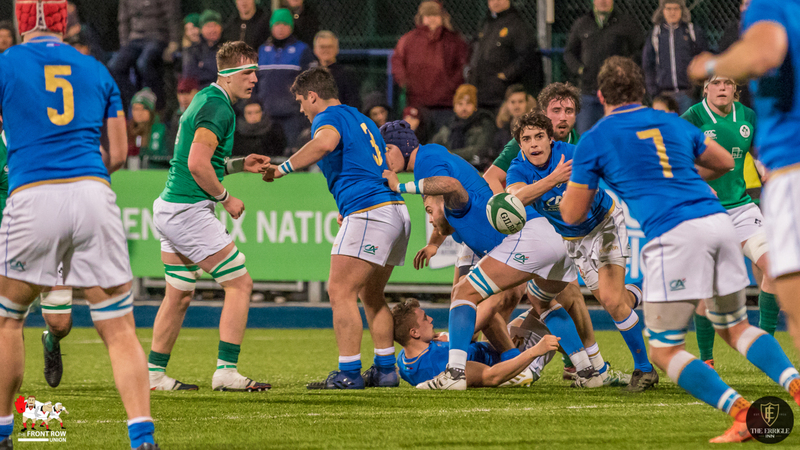 There was plenty of action in the game but it was another frustrating performance from Ireland who’s standards slipped in the second half after a convincing first half performance. 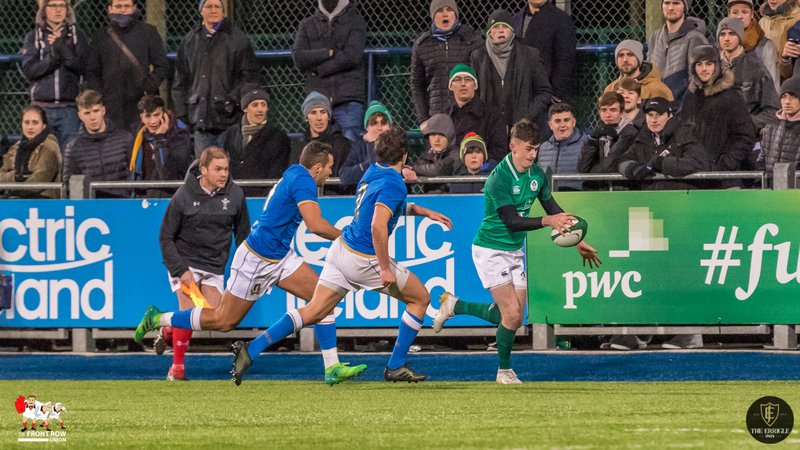 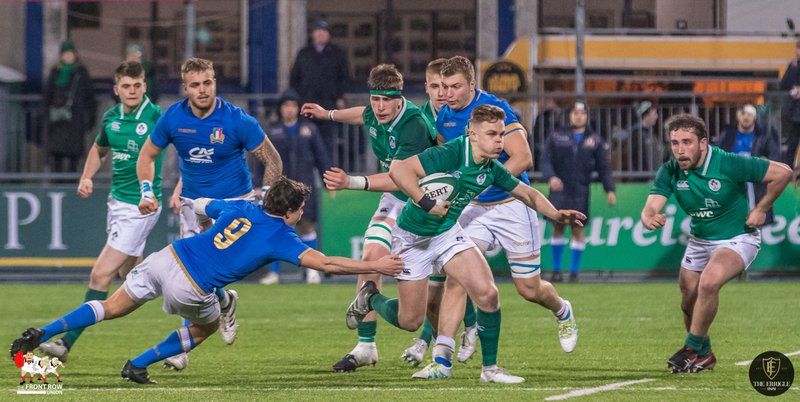 Italy opened the scoring with an early intercept try from Tommaso Coppo but Ireland replied in a couple of minutes with James McCarthy crossing out wide to tie the game at 5 – 5. 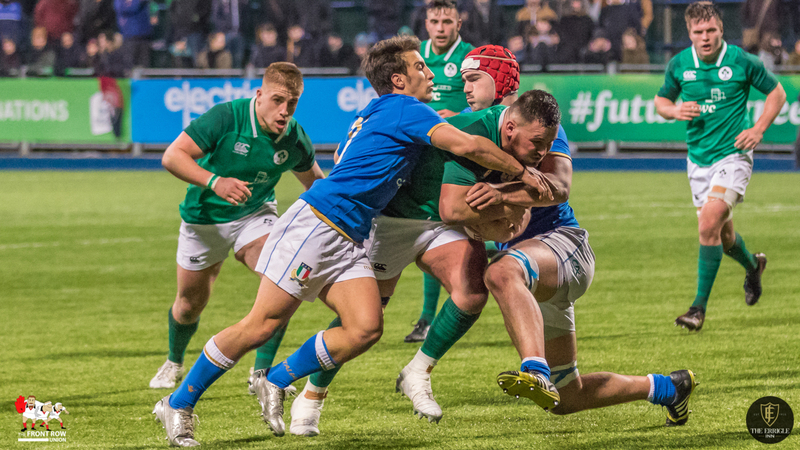 Italy’s Jacopo Bianchi was red carded for a reckless tackle shortly after and with Italy reduced to 14 men it looked like Ireland would cut loose. 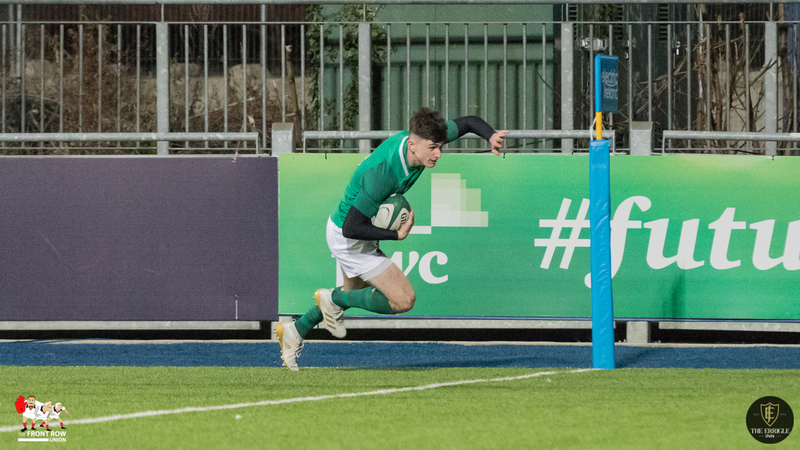 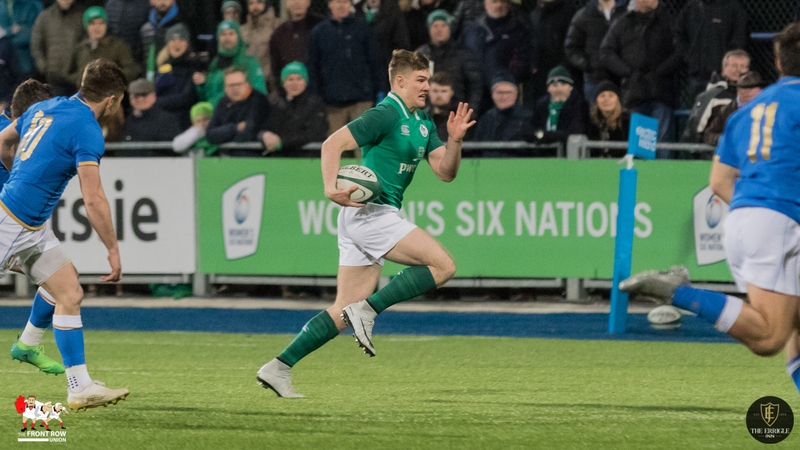 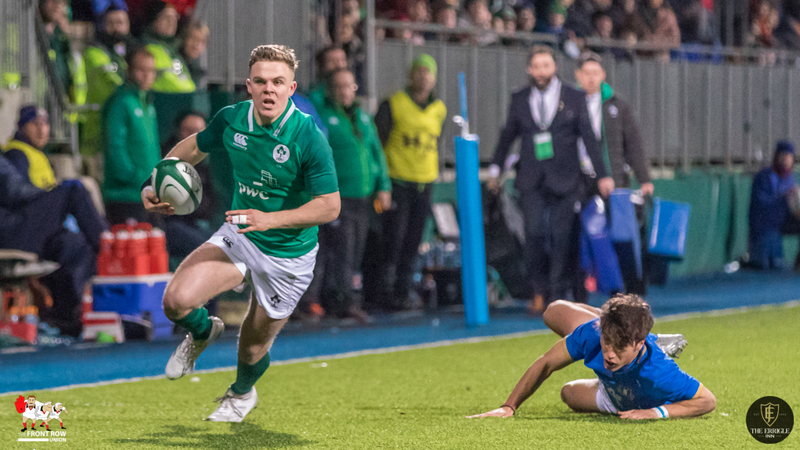 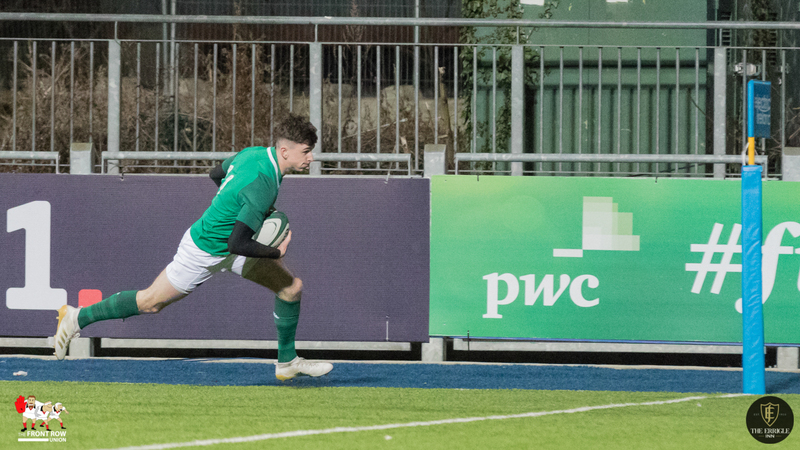 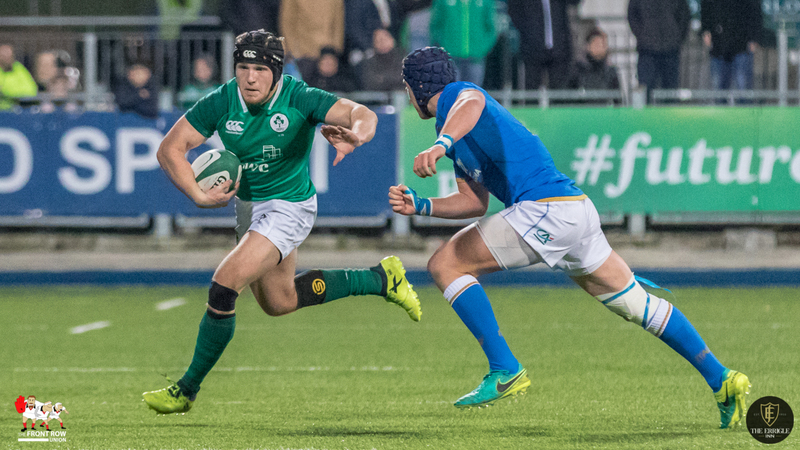 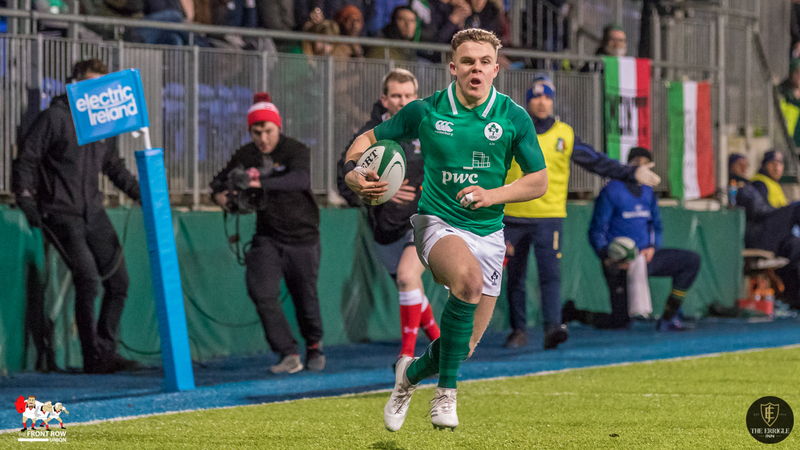 And so it proved as scrum half Hugh O’Sullivan and second row Cormac Daly both touched down for tries, converted by Harry Byrne, to give Ireland a 19 – 5 lead before the first quarter was out. 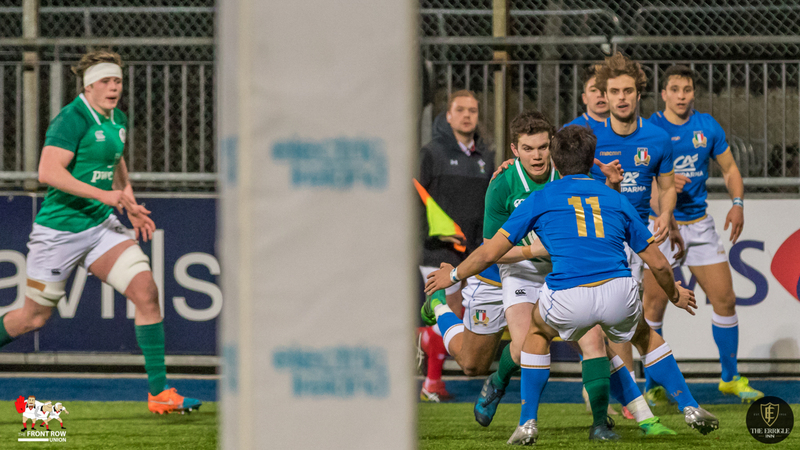 Italy stemmed the flow with a 22nd minute penalty by Antonio Rizzi but it was only a temporary blip as McCarthy crossed for his athletic second, converted by Byrne, before Ireland other winger Peter Sullivan crossed in the right hand corner for a five pointer. 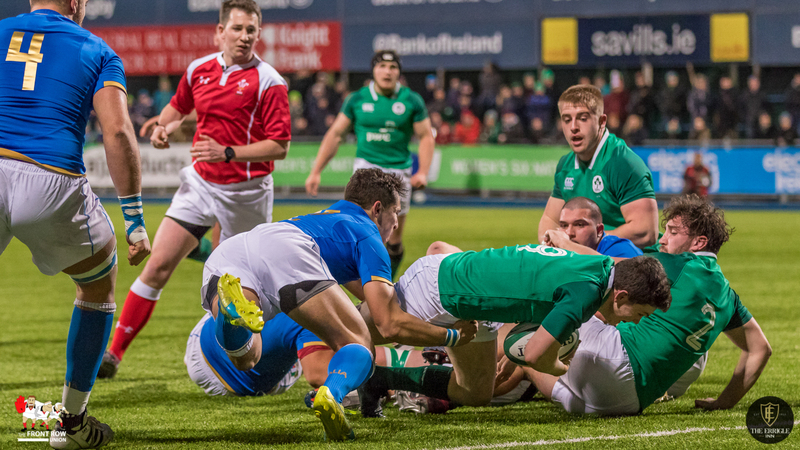 At 31 – 8 and bonus point in the bag Ireland looked home and hosed. 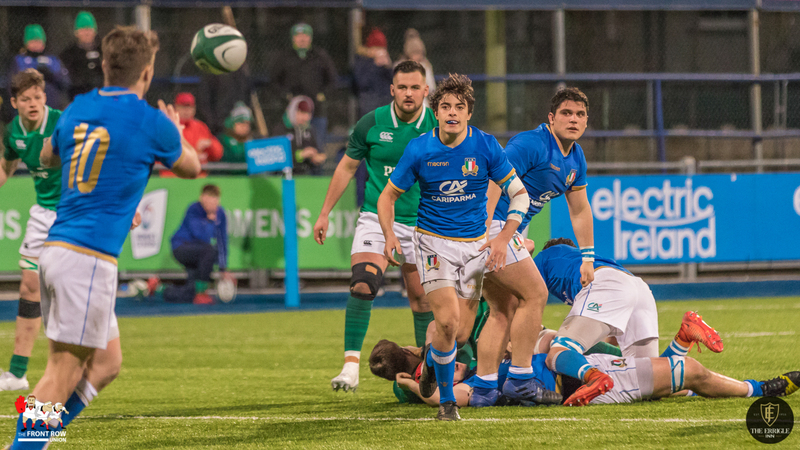 However, Italy gave a portent of things to come when Niccolo Cannone crossed for their second try with the last play of the half, Rizzi converting to take it to 31 – 15 at the break. 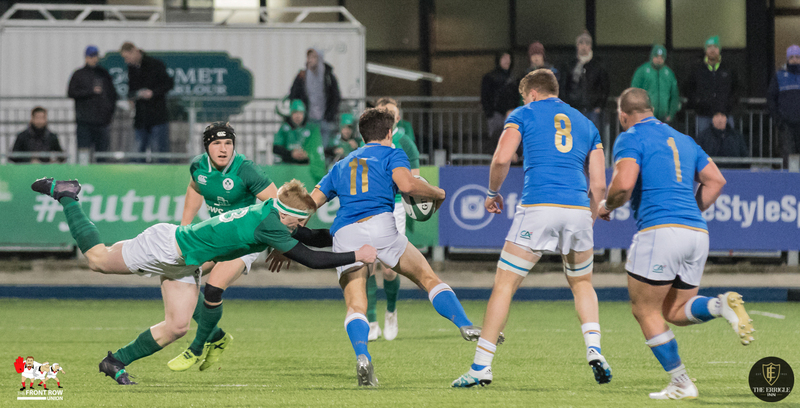 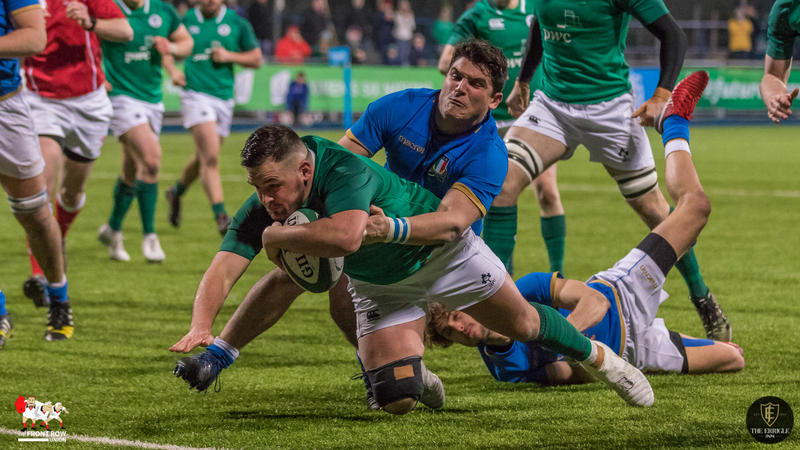 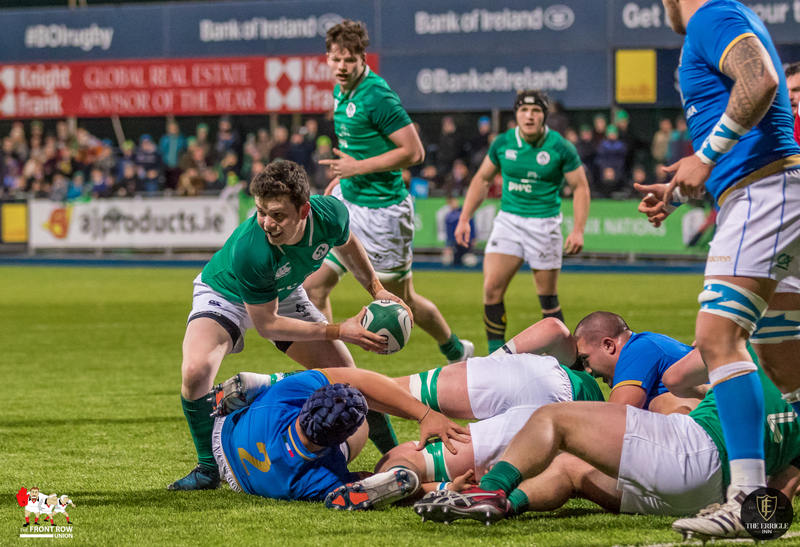 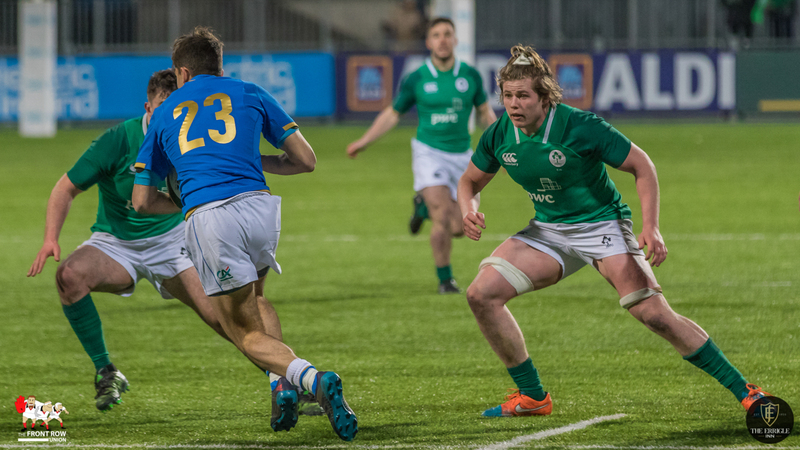 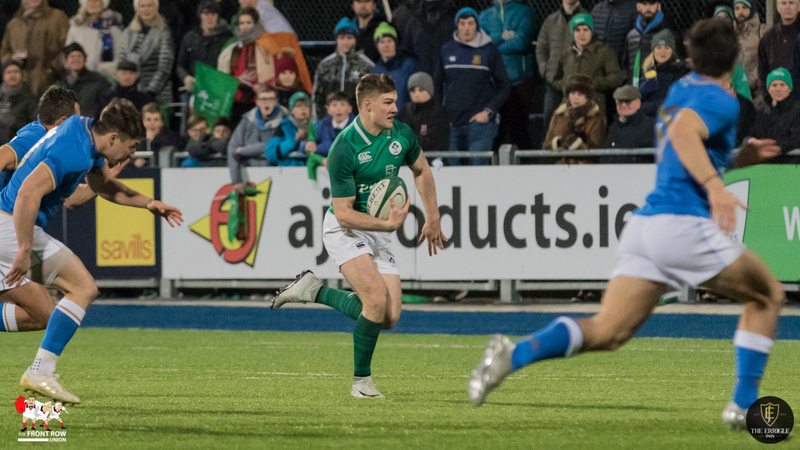 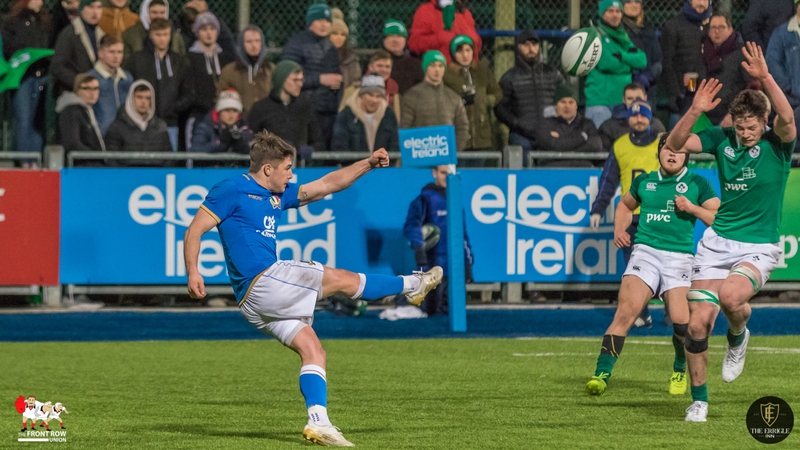 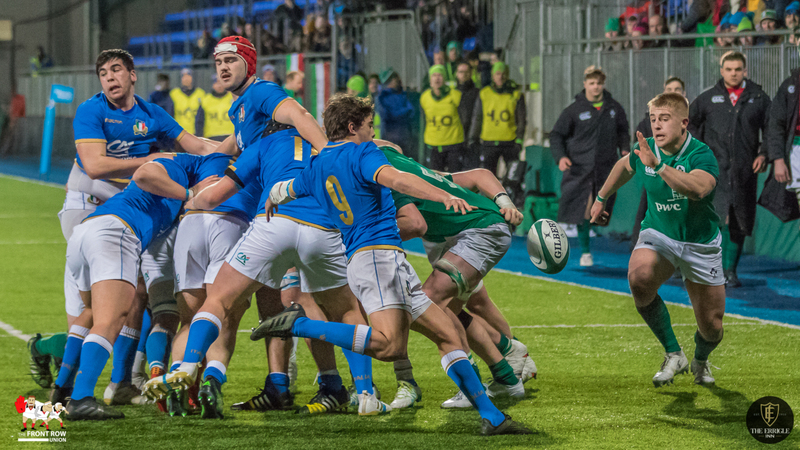 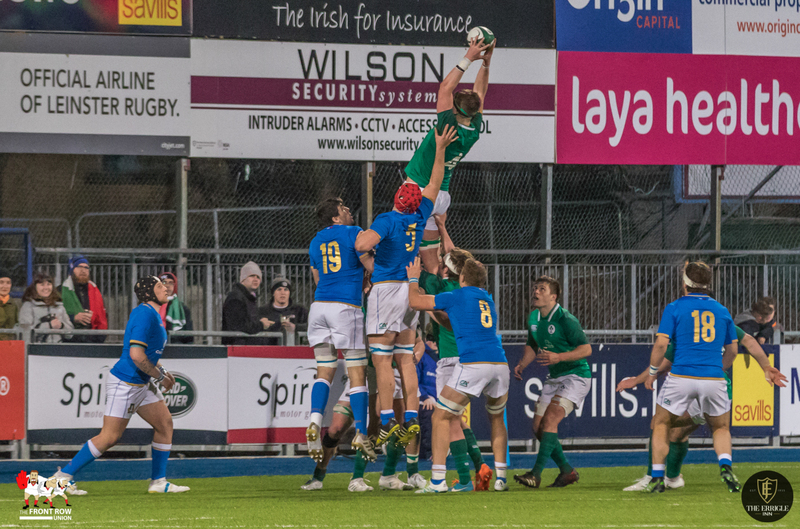 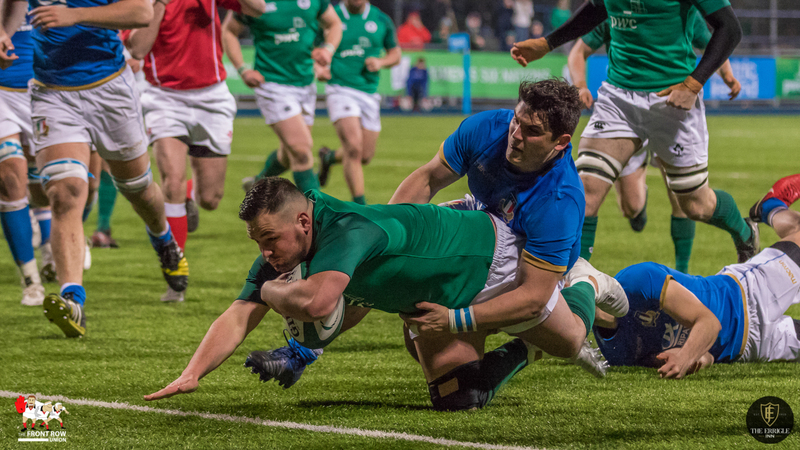 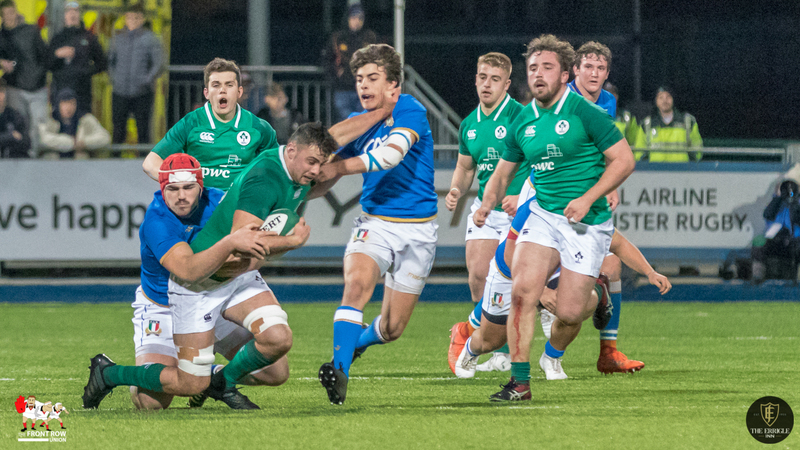 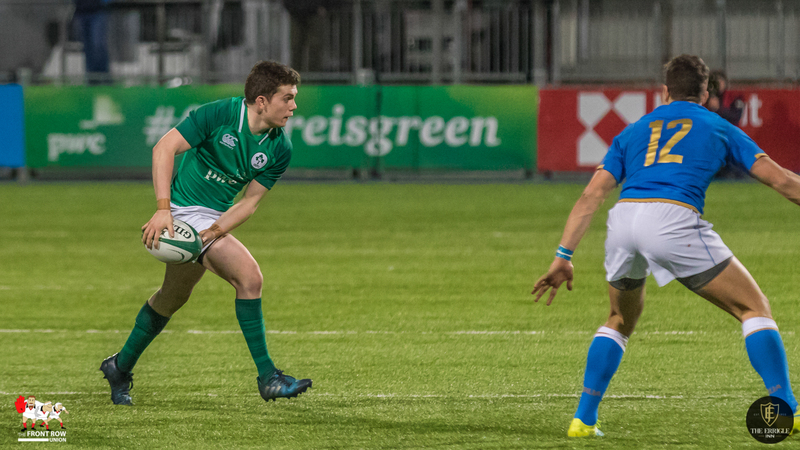 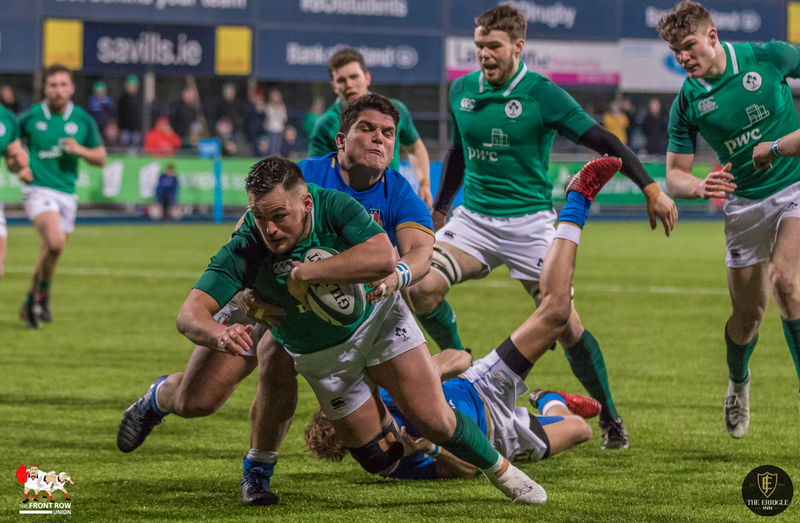 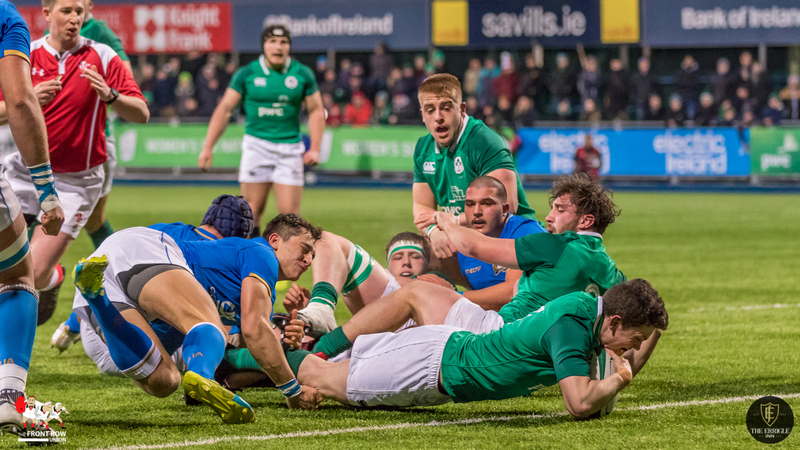 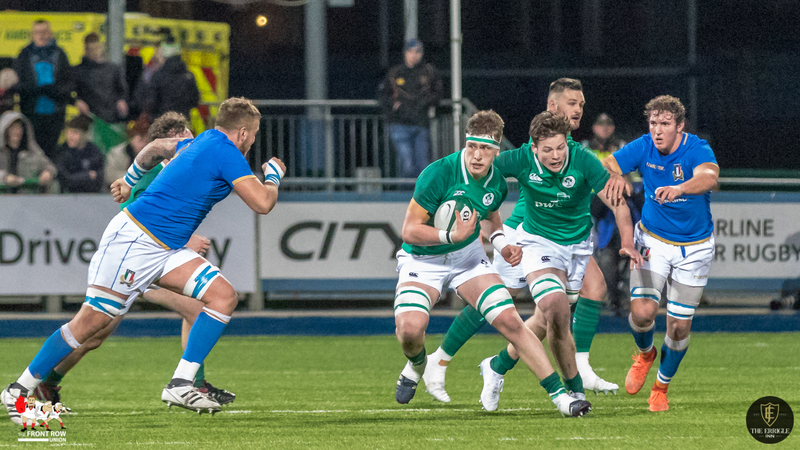 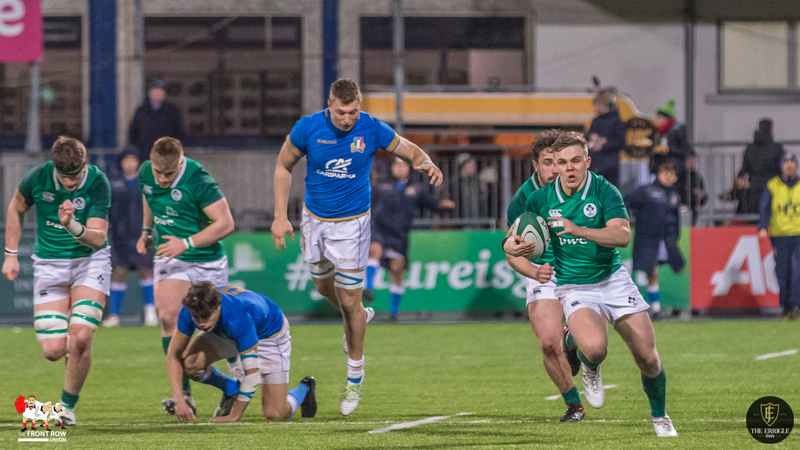 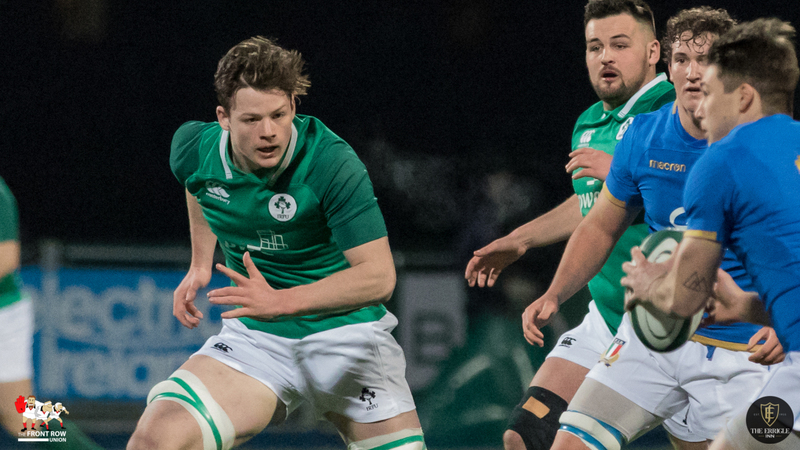 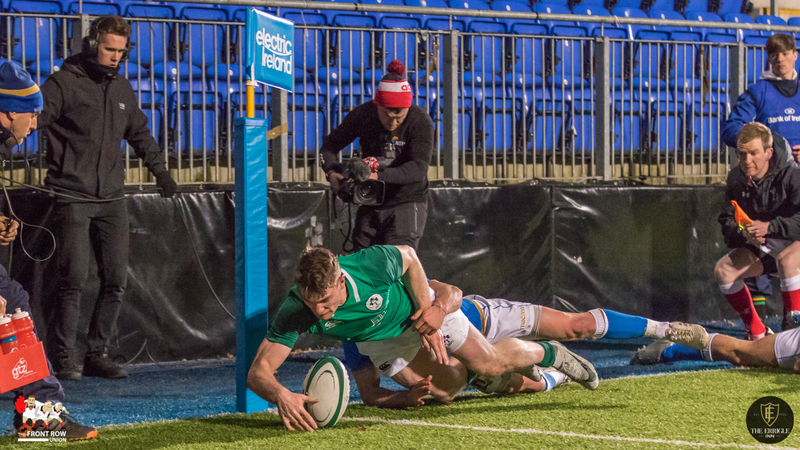 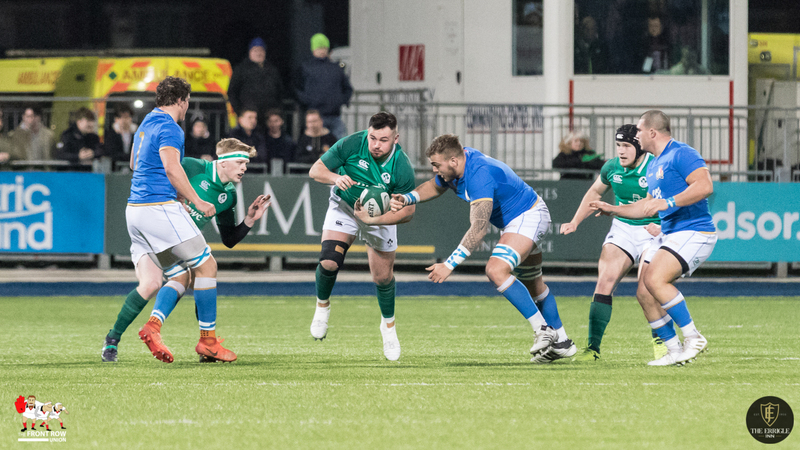 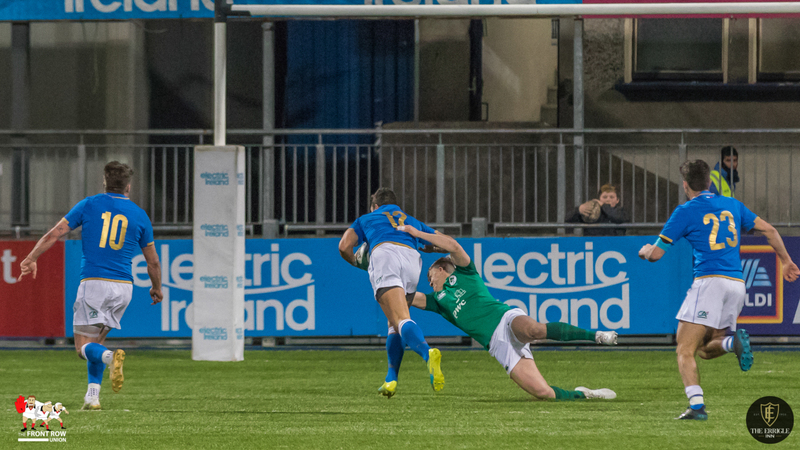 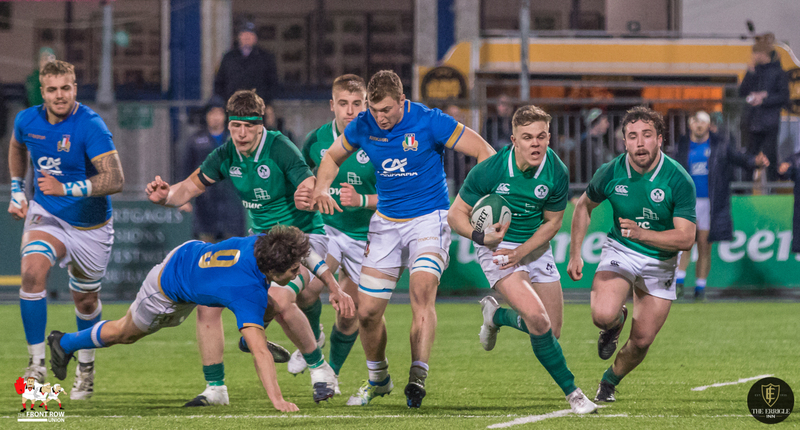 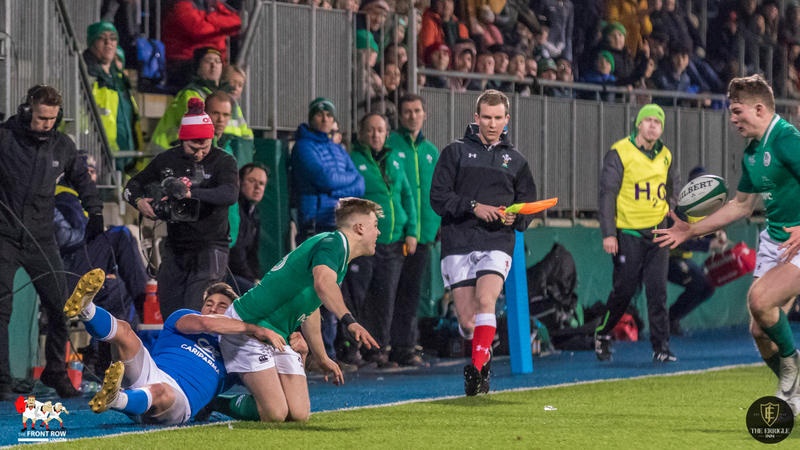 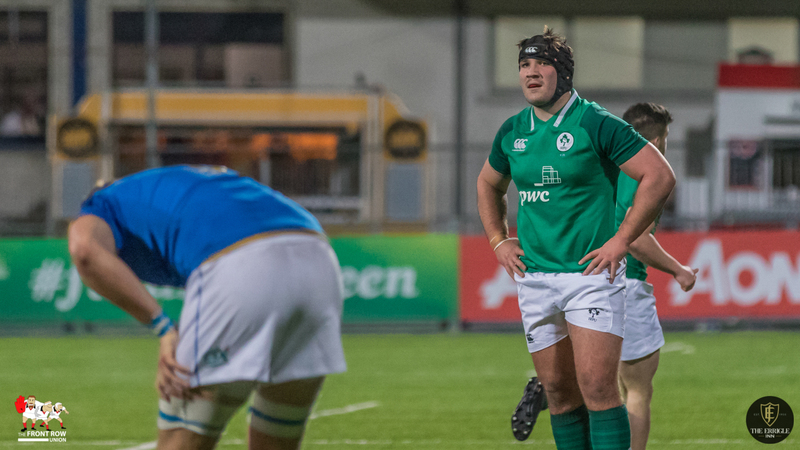 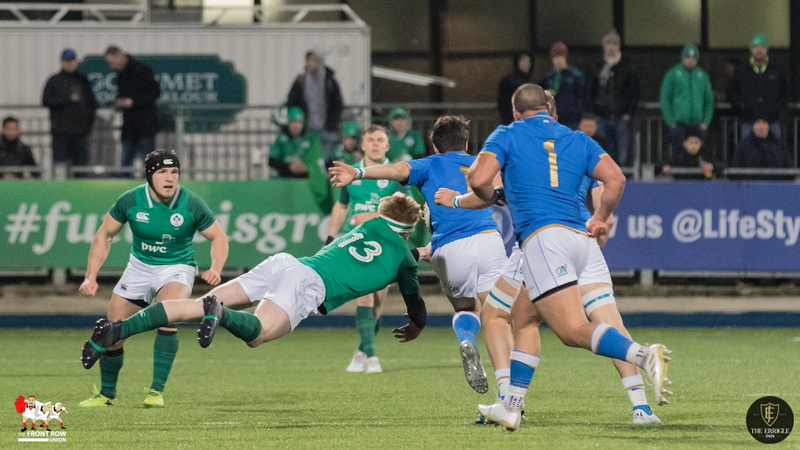 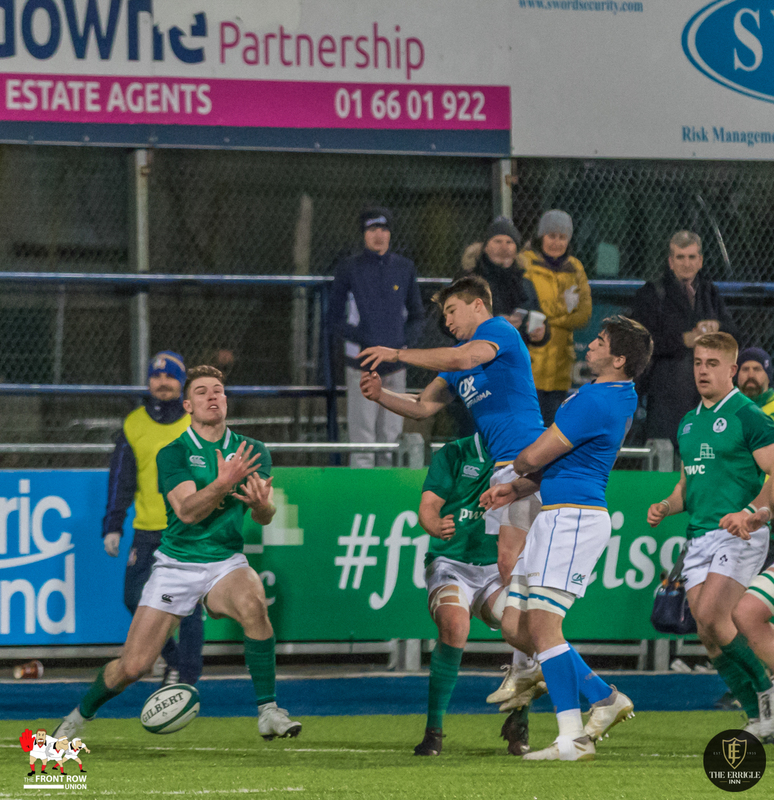 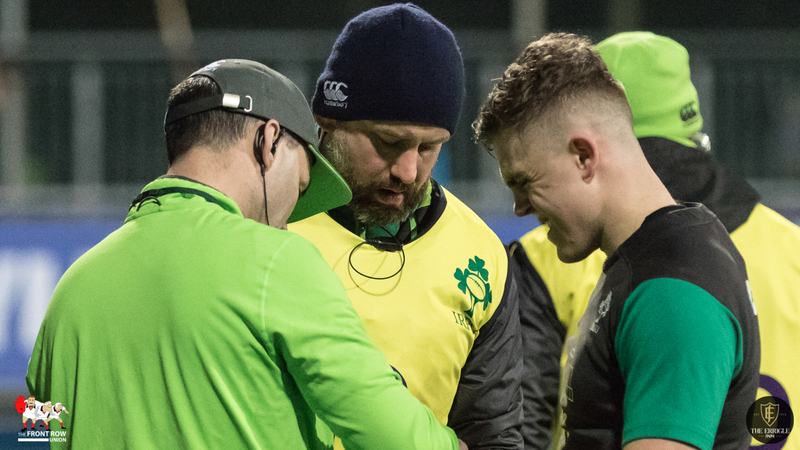 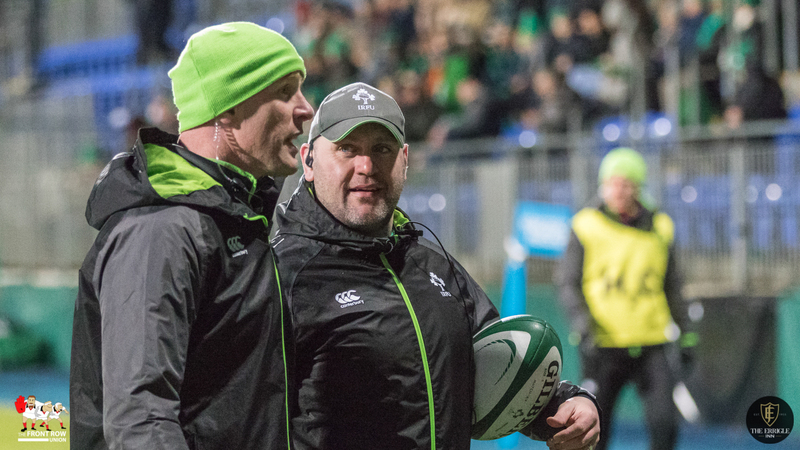 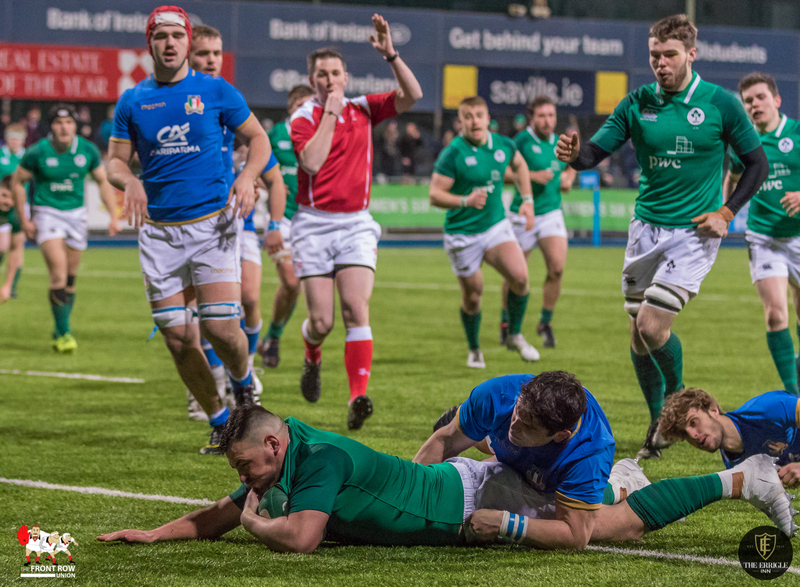 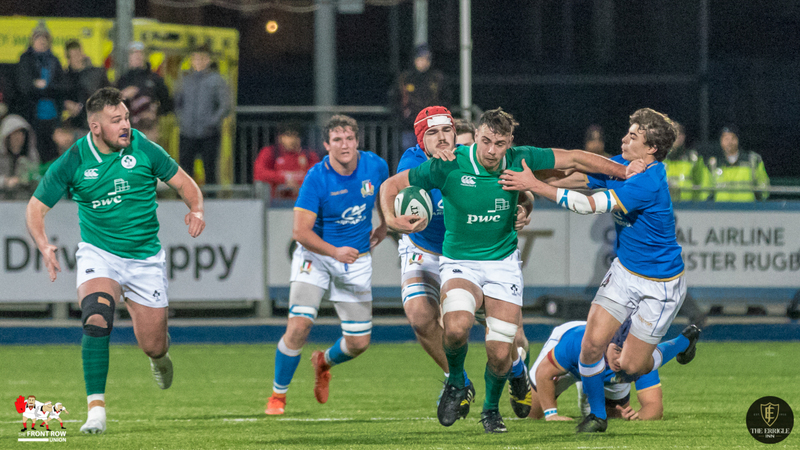 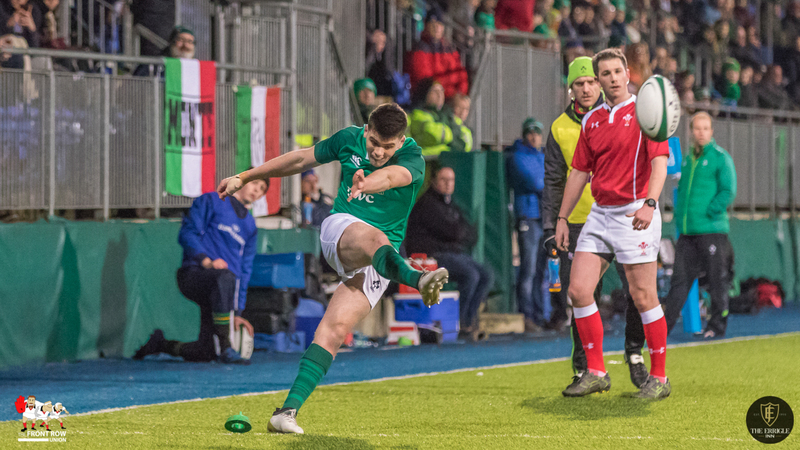 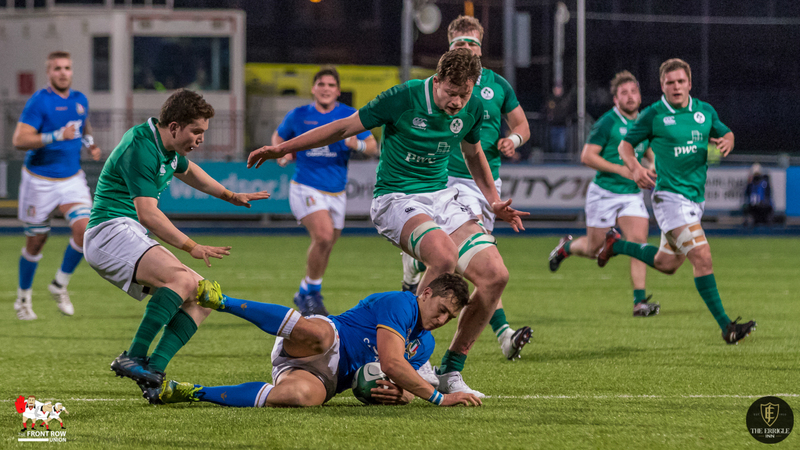 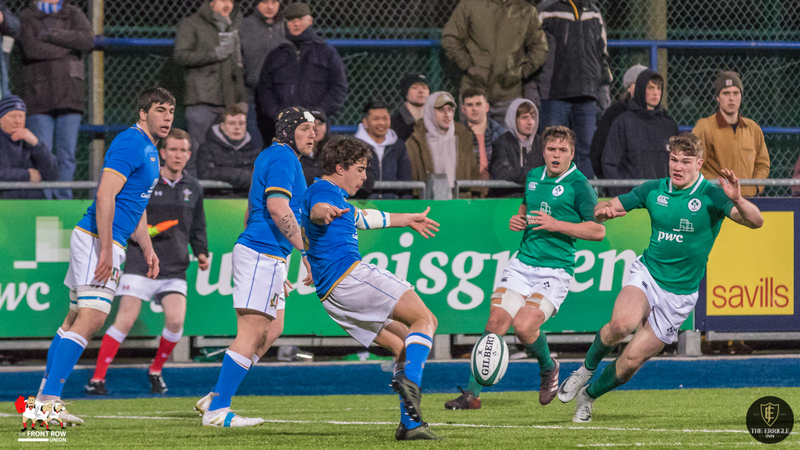 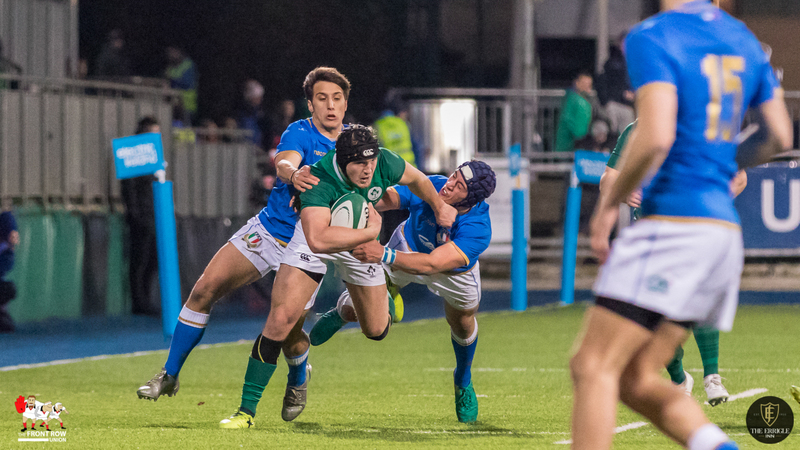 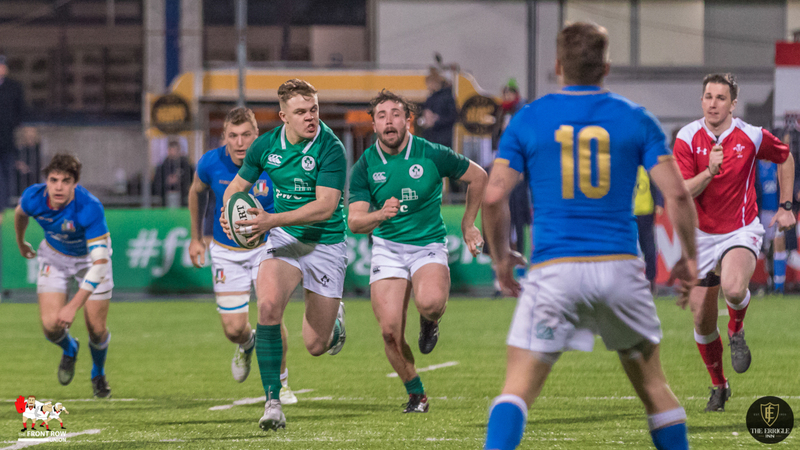 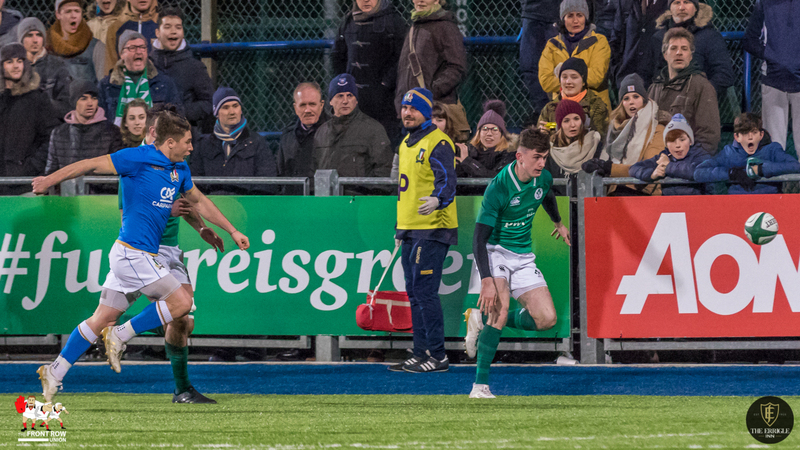 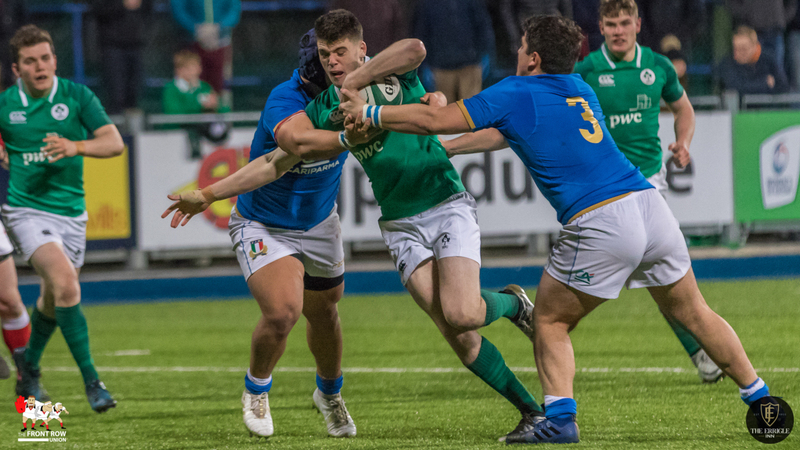 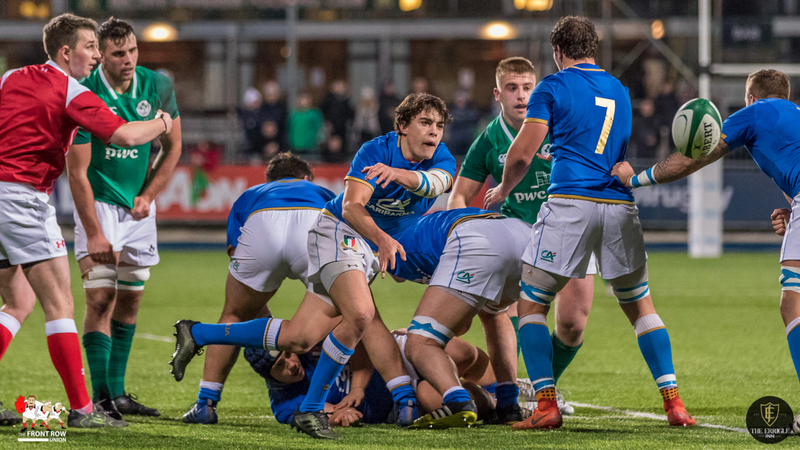 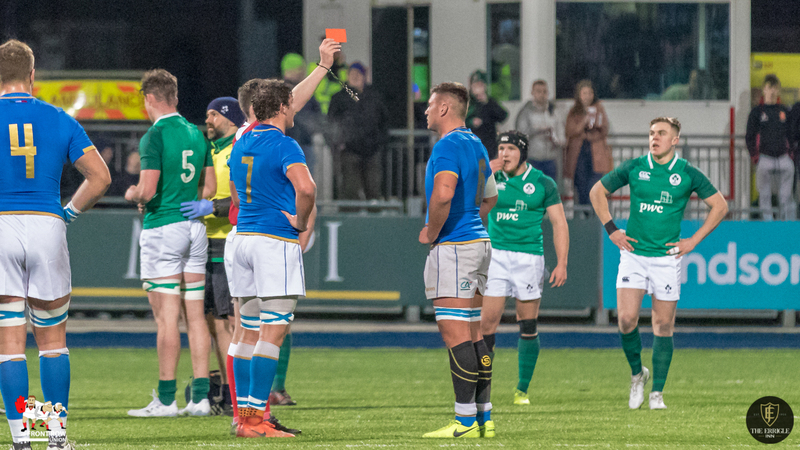 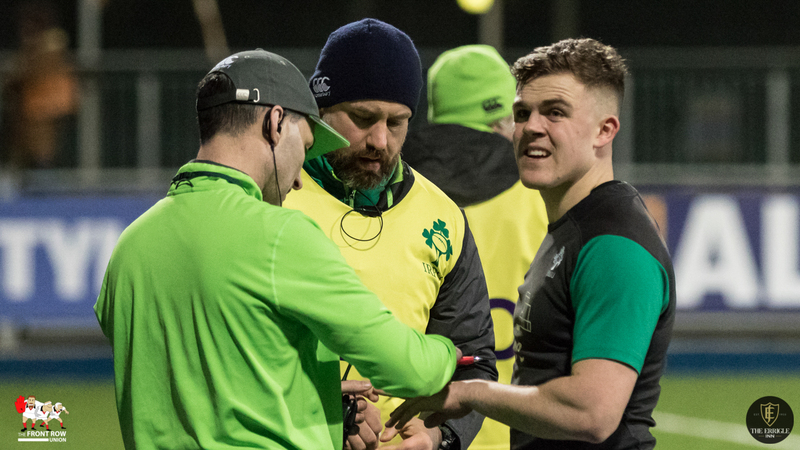 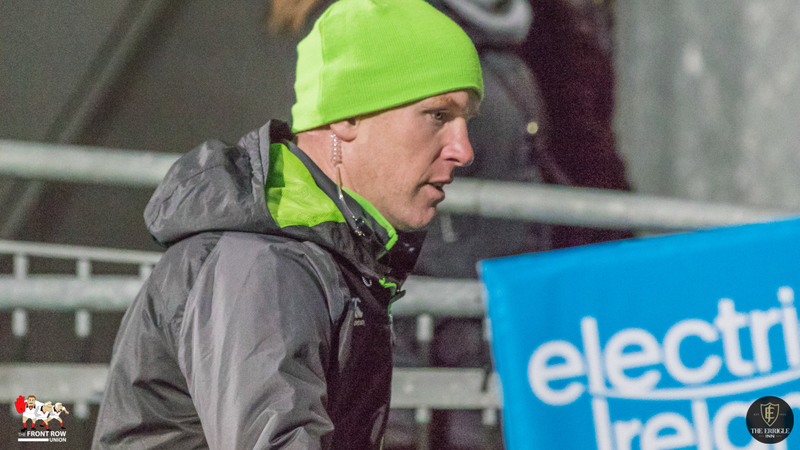 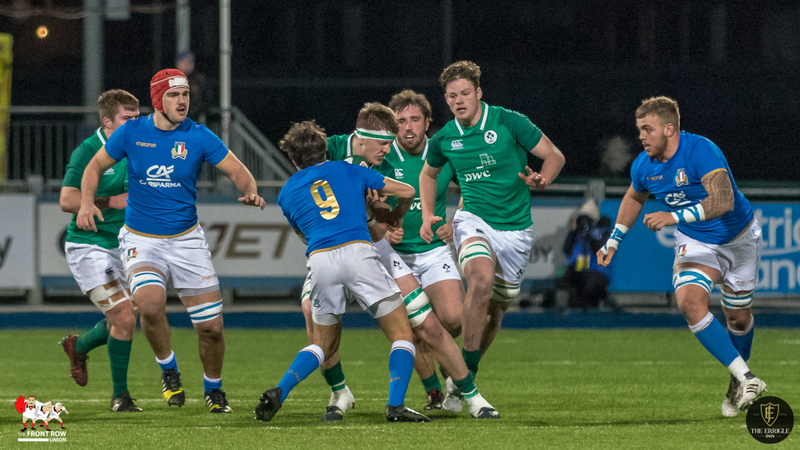 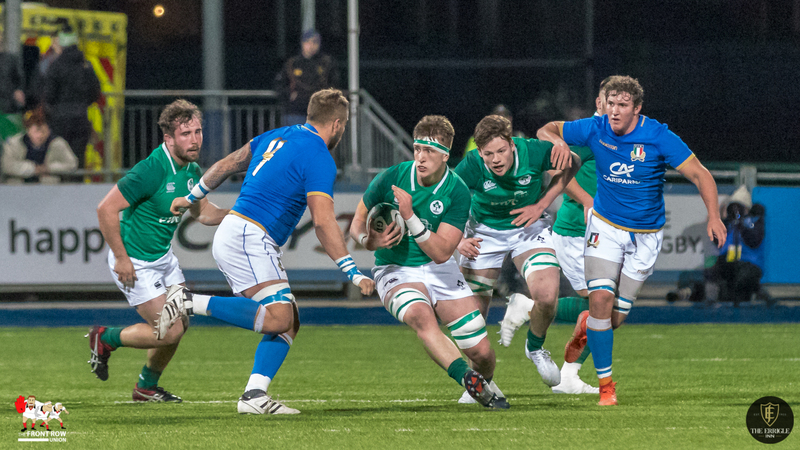 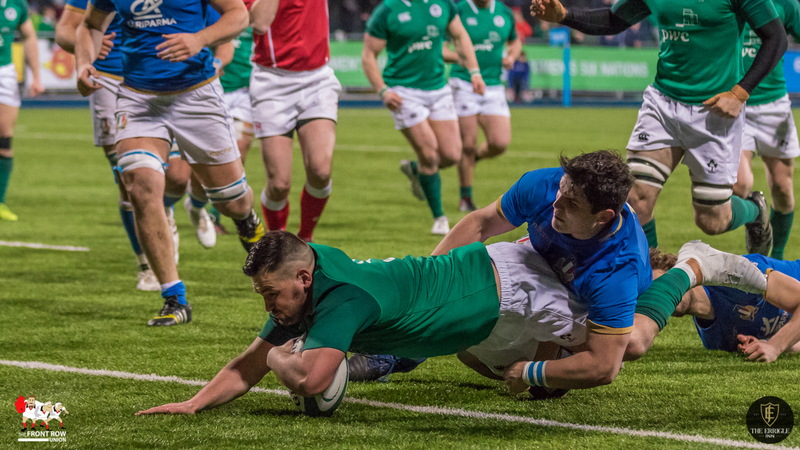 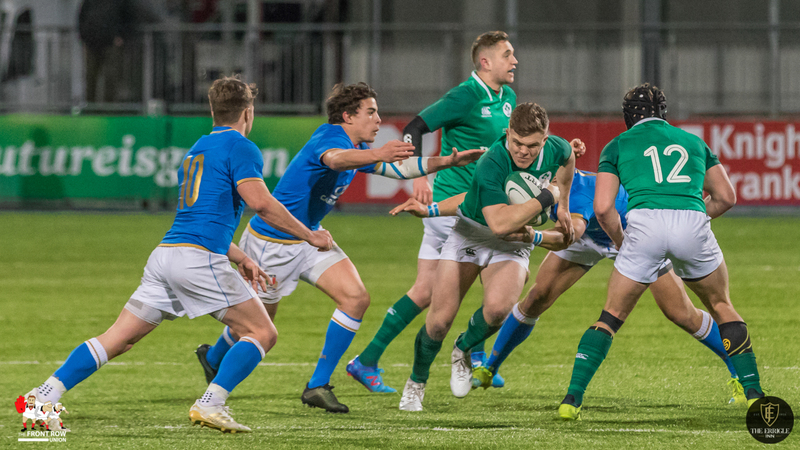 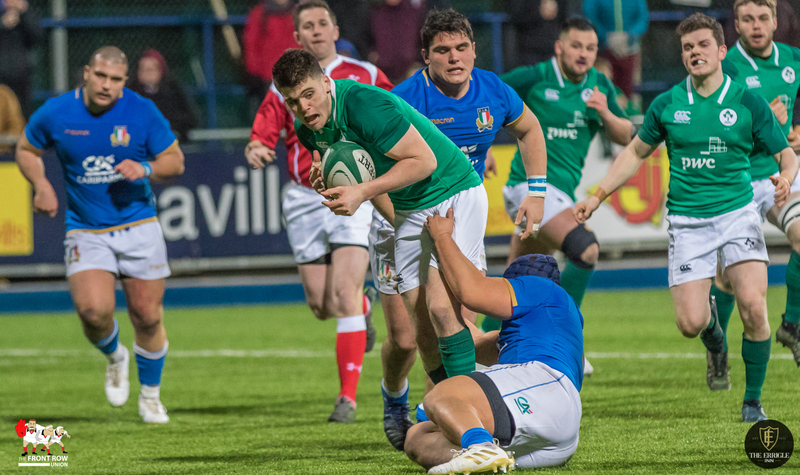 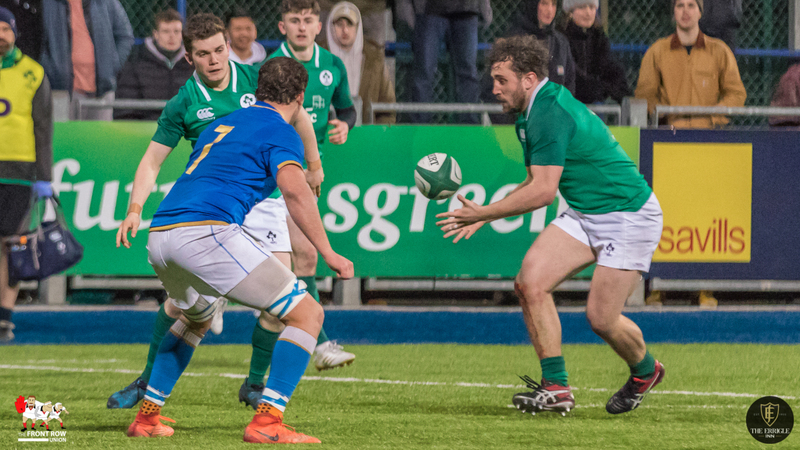 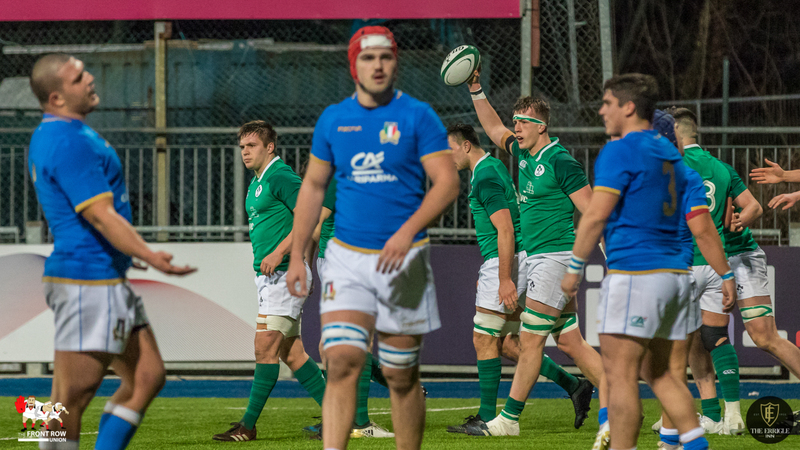 Ireland extended their lead when prop Jack Aungier went over shortly after the resumption and, while Byrne lined up the successful conversion, the Italian captain Michele Lamaro gave his team mates an absolute roasting as they gathered under the uprights. 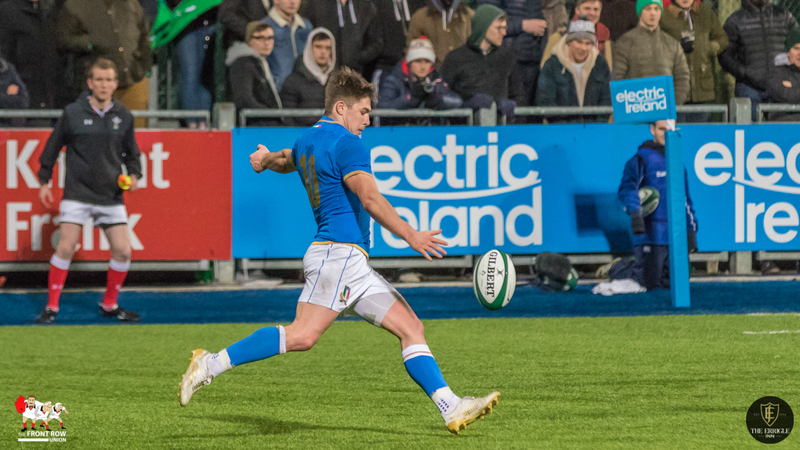 I don’t speak Italian, but I got the gist and I was ready to borrow a pair a boots and forza Italia by the time he’d finished! 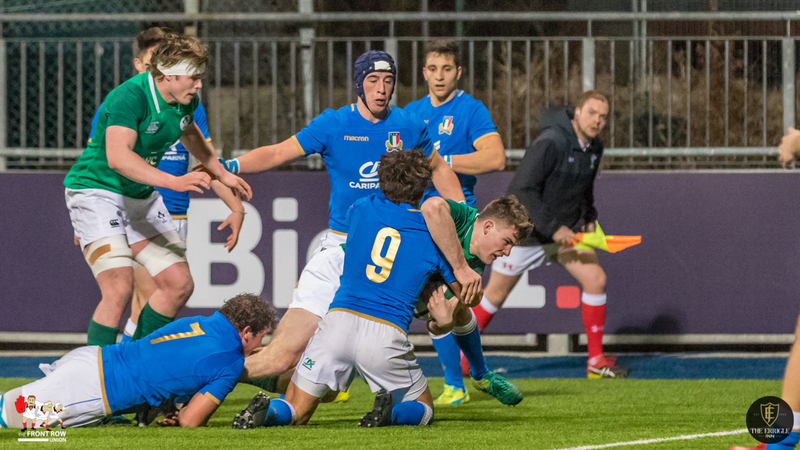 The roasting by Lamaro appeared to have done the trick as Italy dominated the rest of the game. 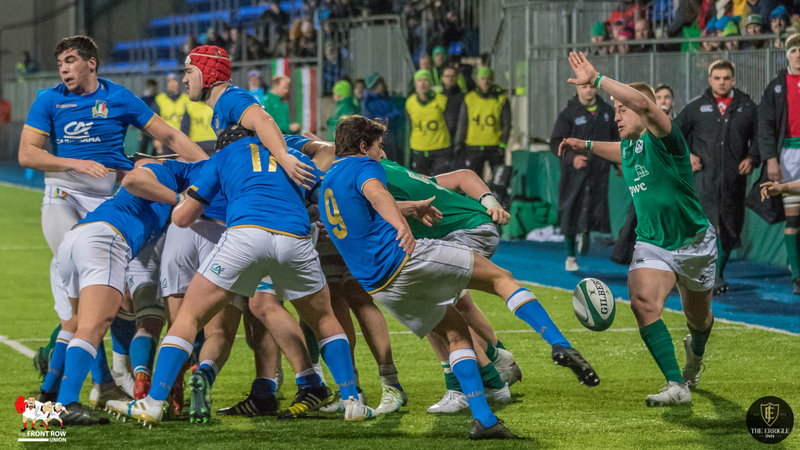 Ireland did have one furter foray over the Italian line when Tommy O’Brien was put through by Michael Sylvester but the move was called back when video evidence showed Sylvester’s boot brushing the touch line. 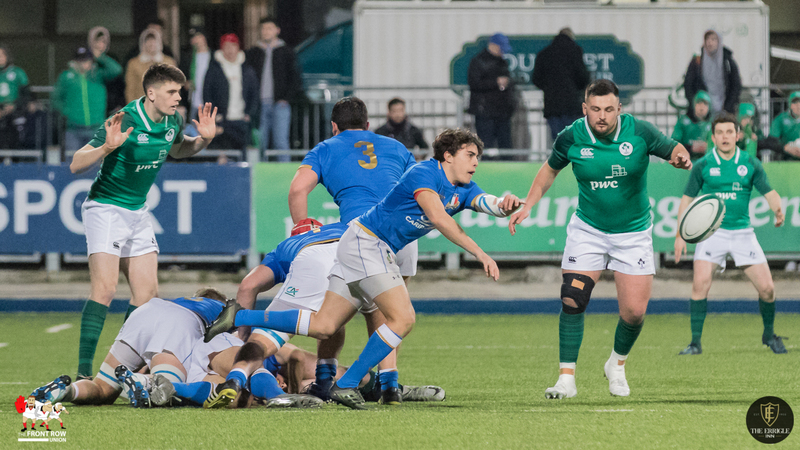 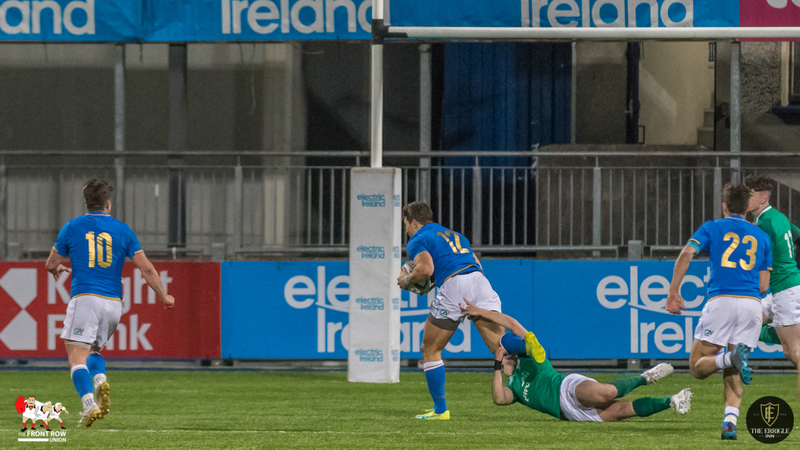 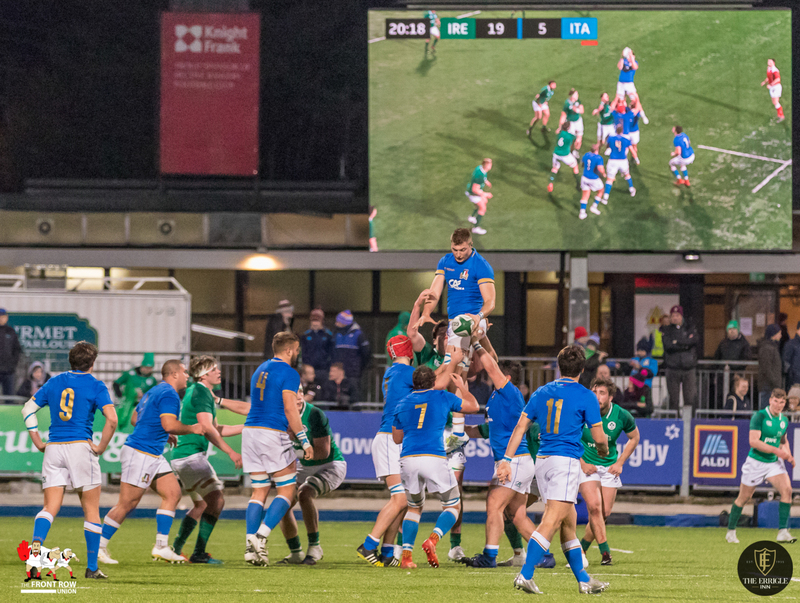 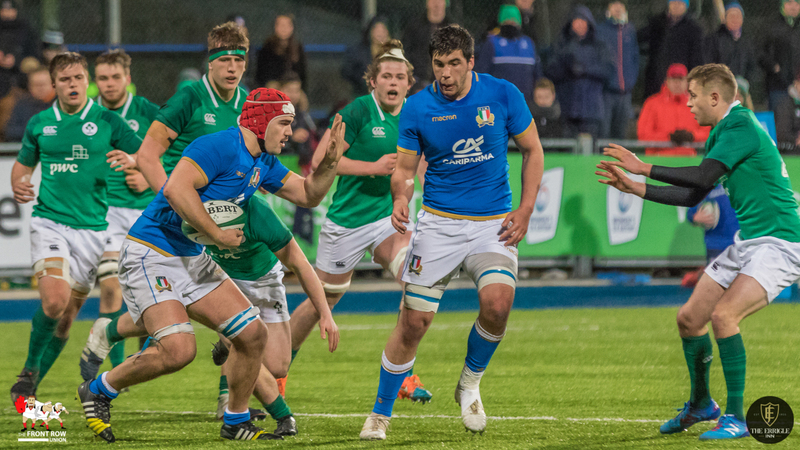 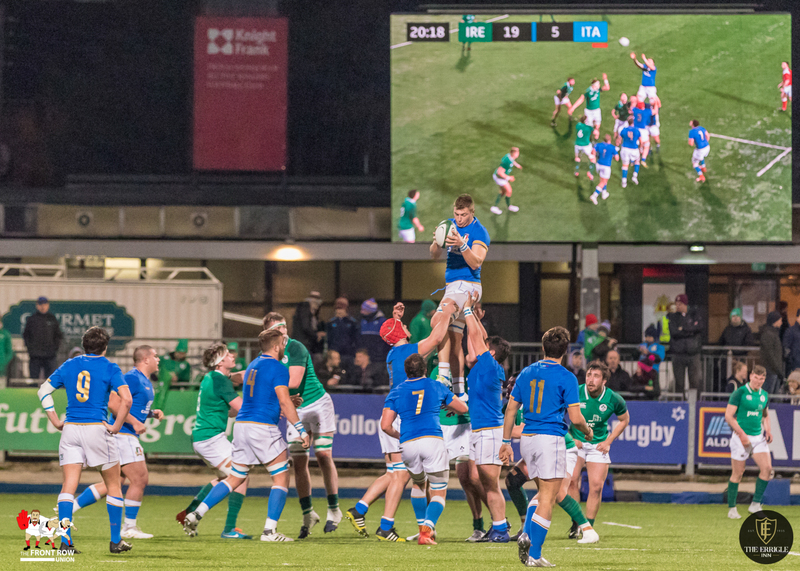 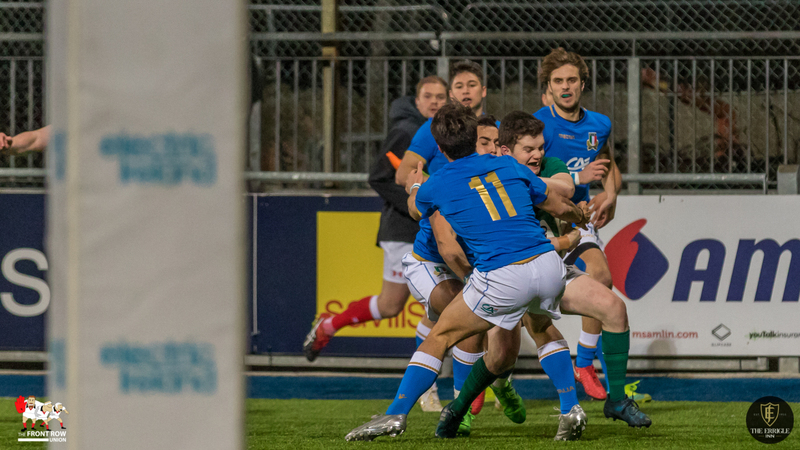 The Italian dominance let to three tries with Damiano Mazza, Rizzi and Edoardo Iachizzi all crossing in a now muted Donnybrook Stadium. 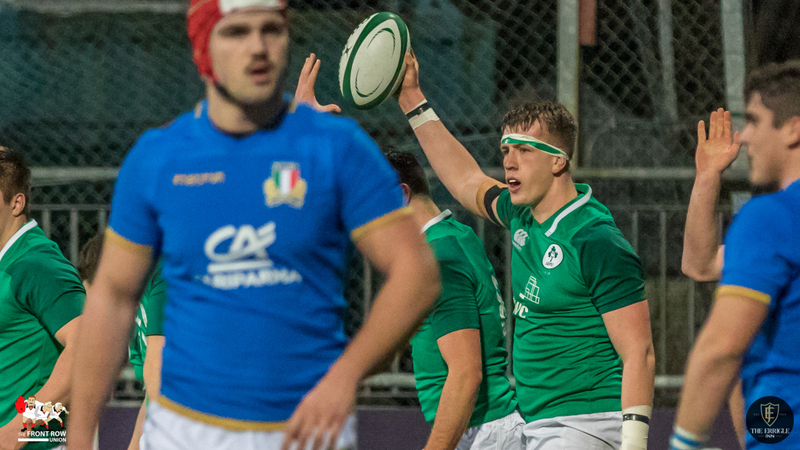 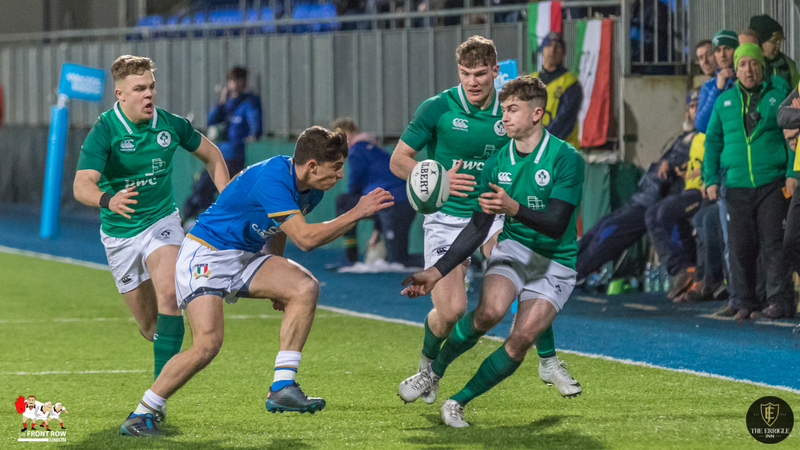 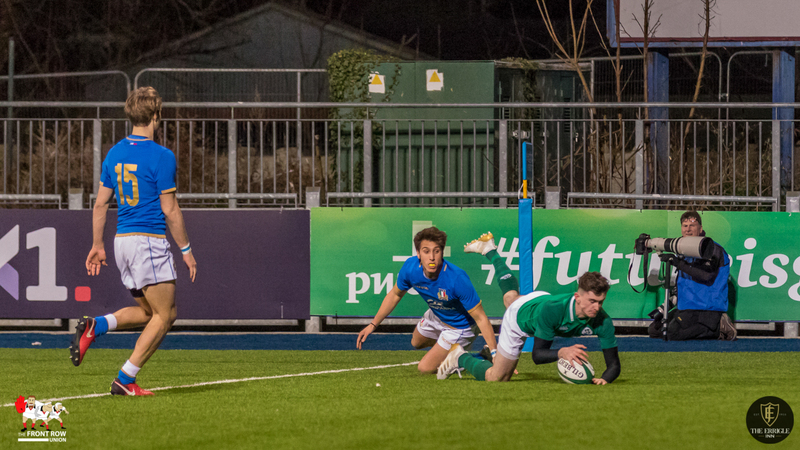 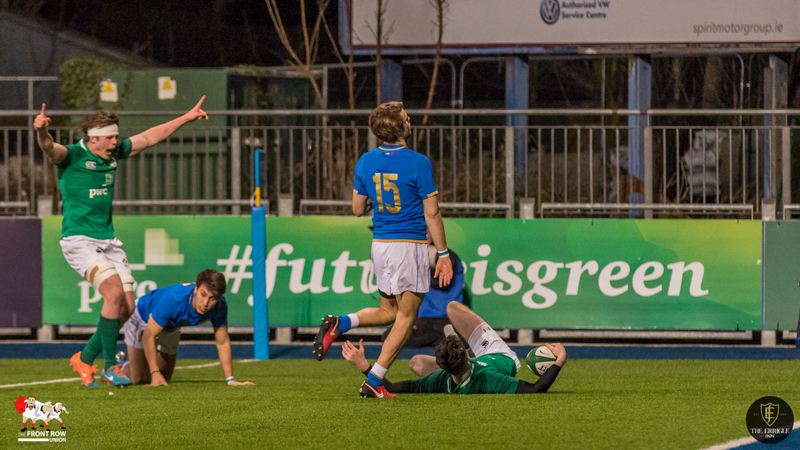 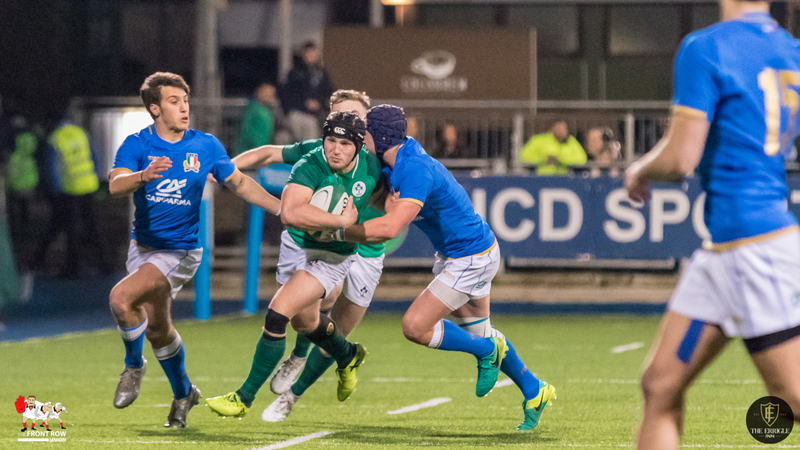 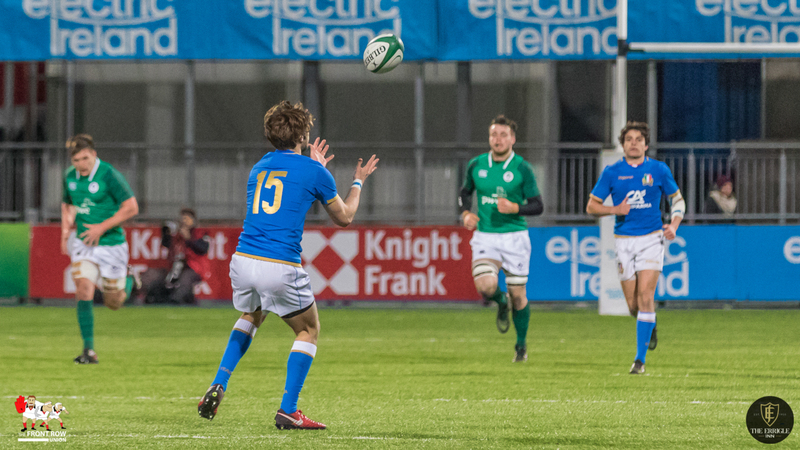 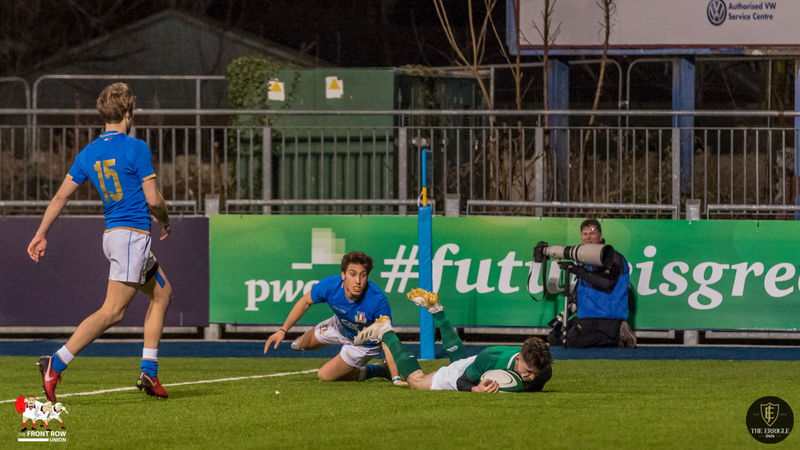 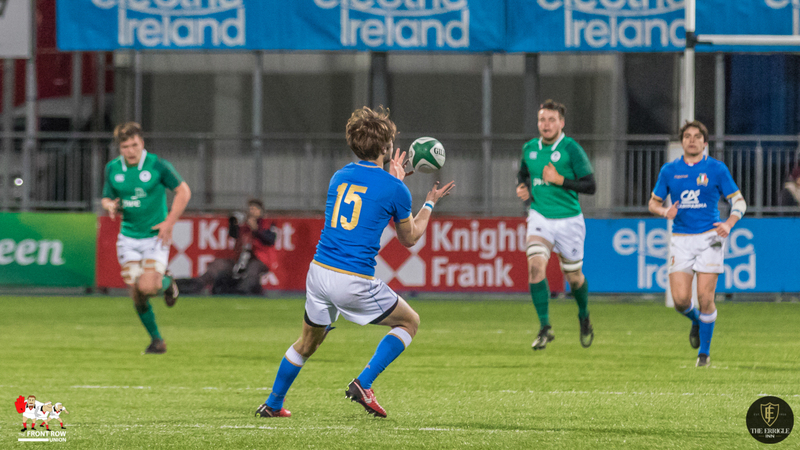 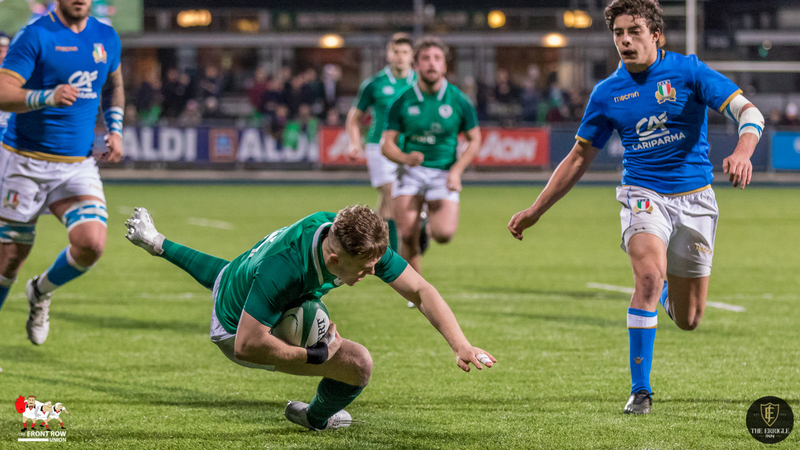 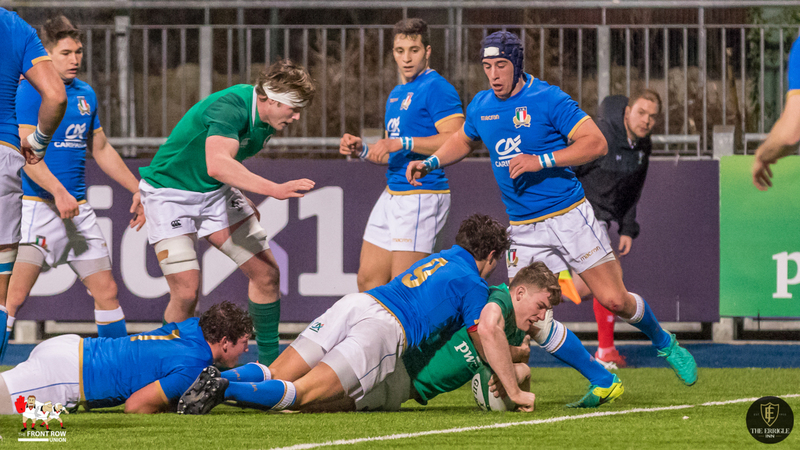 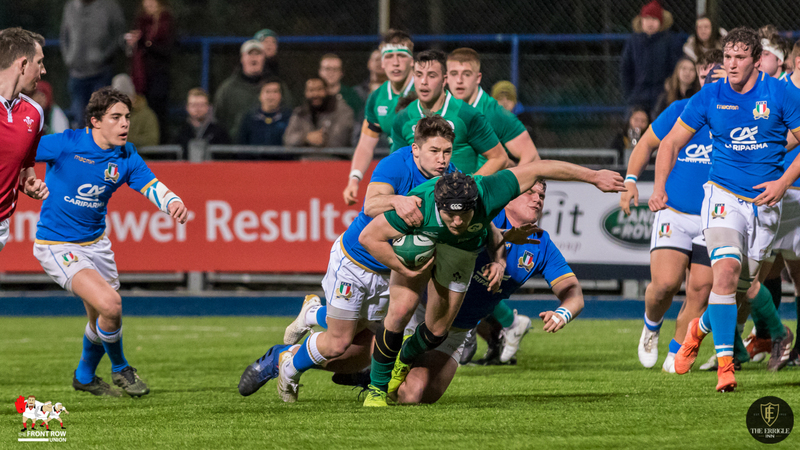 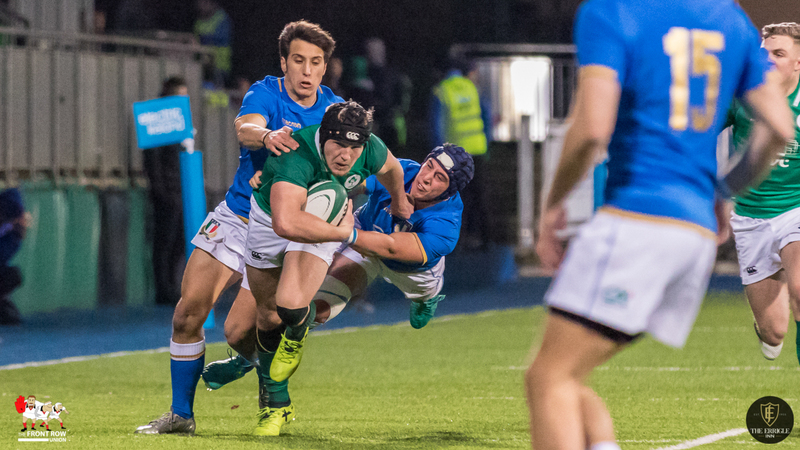 Rizzi converted all three to give a final score of Ireland U20 38 Italy U20 34. 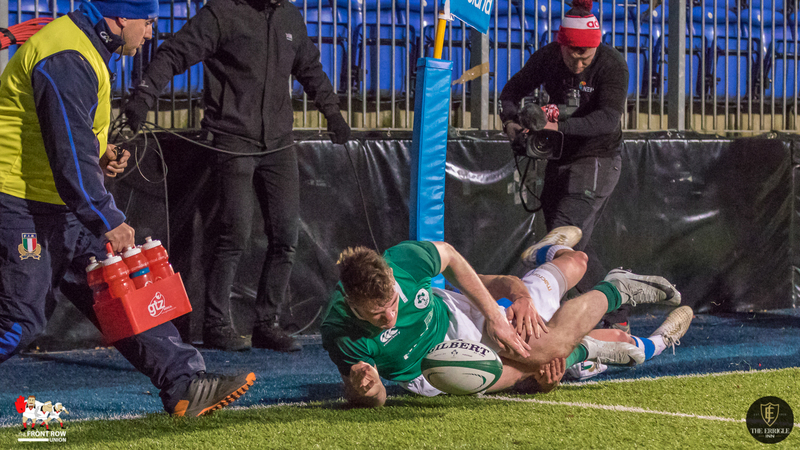 Too close for comfort for the Irish! 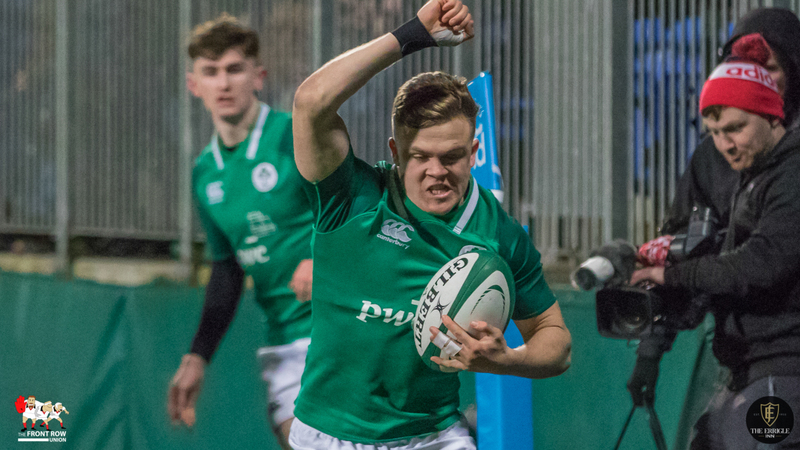 Ireland U20: Michael Silvester, Peter Sullivan, Tommy O’Brien, Angus Curtis, James McCarthy, Harry Byrne, Hugh O’Sullivan, Jordan Duggan, Eoghan Clarke, Jack Aungier, Cormac Daly, Jack Dunne, Sean Masterson, Matthew Agnew, Jack O’Sullivan. 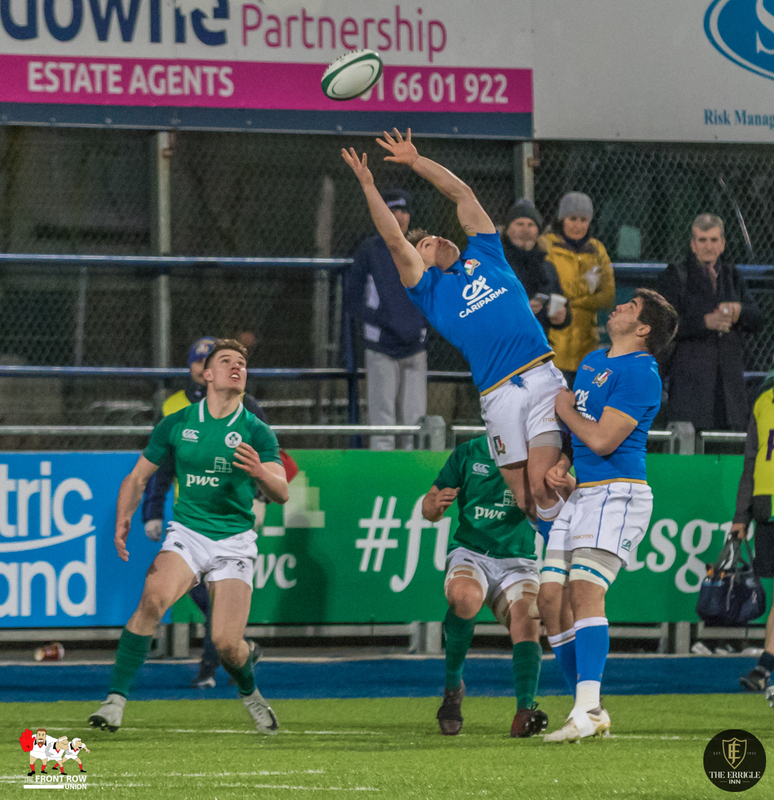 Replacements: Diarmuid Barron, James French, Tom O’Toole, Charlie Ryan, Ronan Foley, Paddy Patterson, Conor Dean, Angus Kernohan. 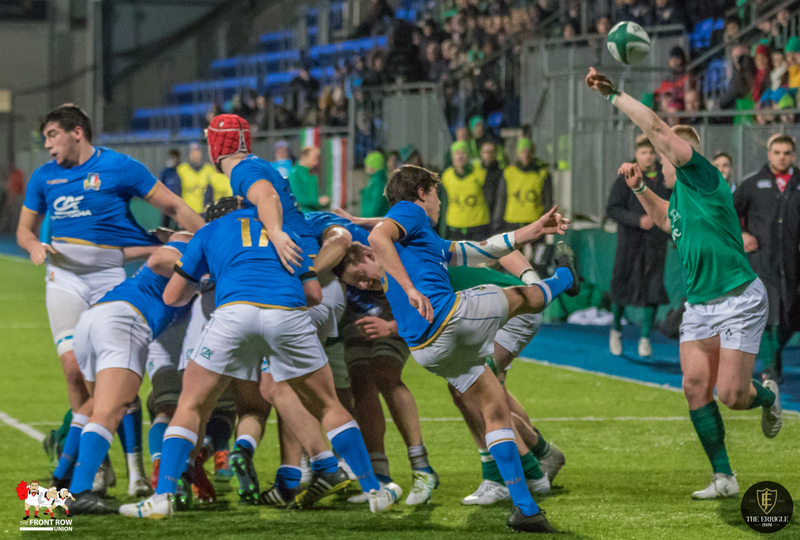 As for the Ulster guys, it was quiet games all round. 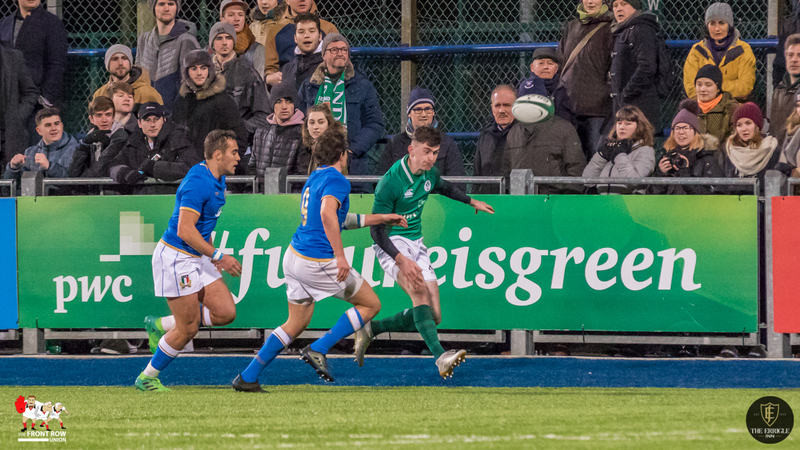 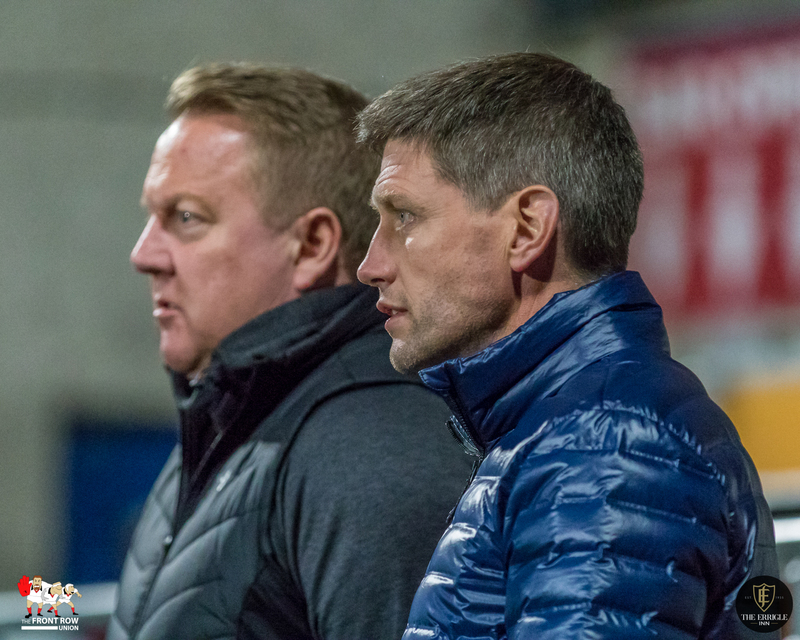 Angus Curtis and Matty Agnew played the full 80 mins, Tom O’Toole came on on the 54th minute and Angus Kernohan got a couple of minutes at the end.